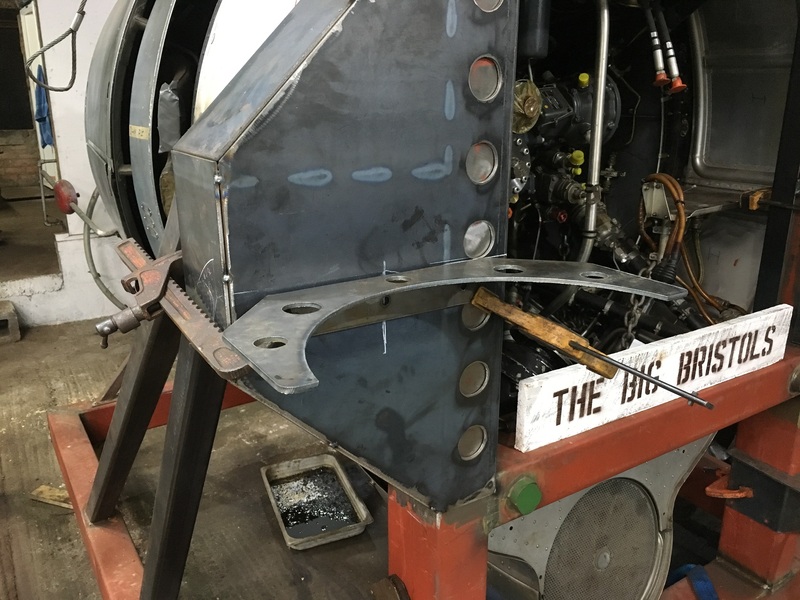 We soon realized that we could not run with a front support like the 216 , as the nacelle is in the way and the prop is to close to the front edge of the nacelle. 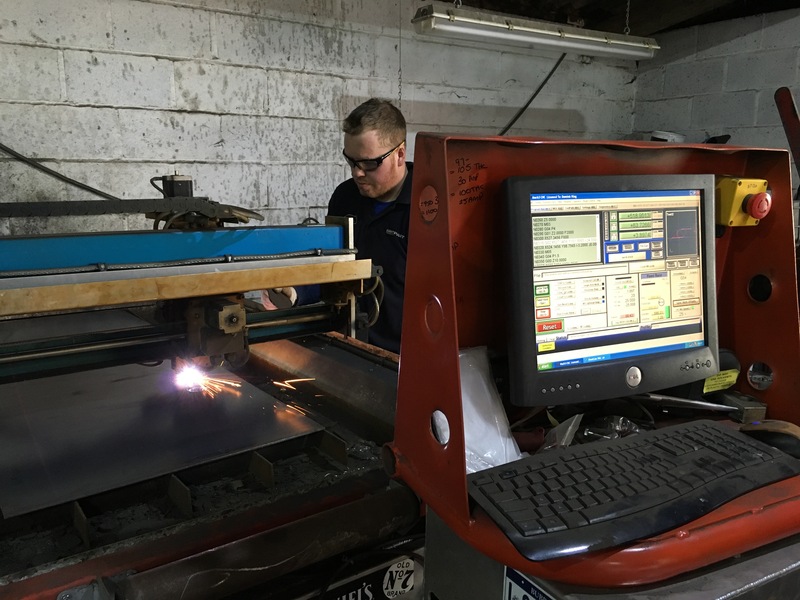 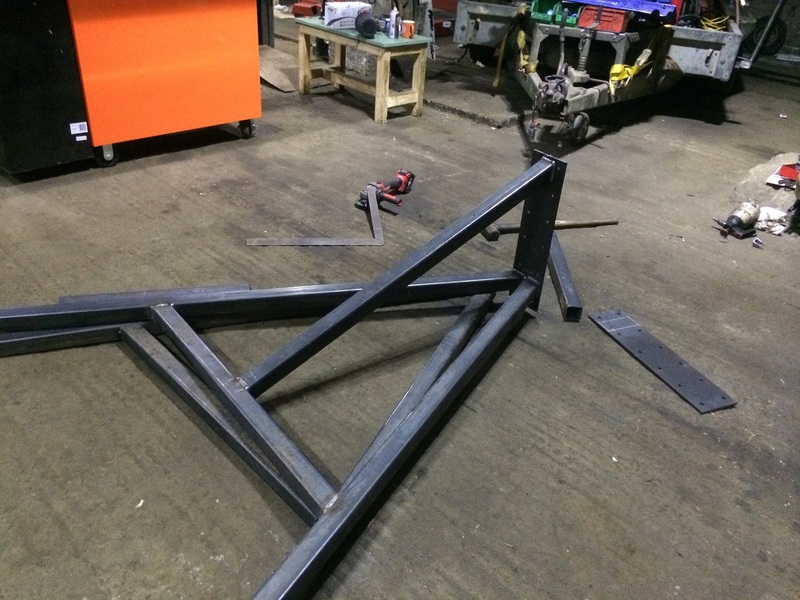 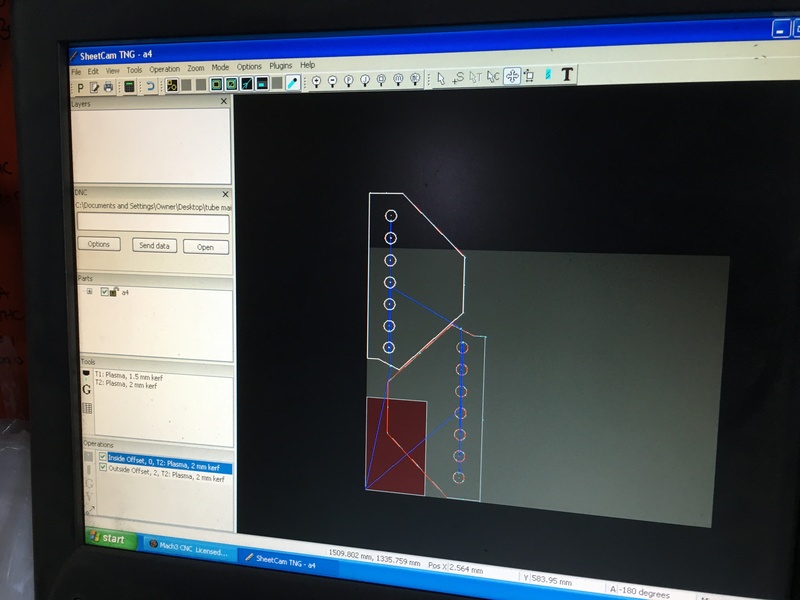 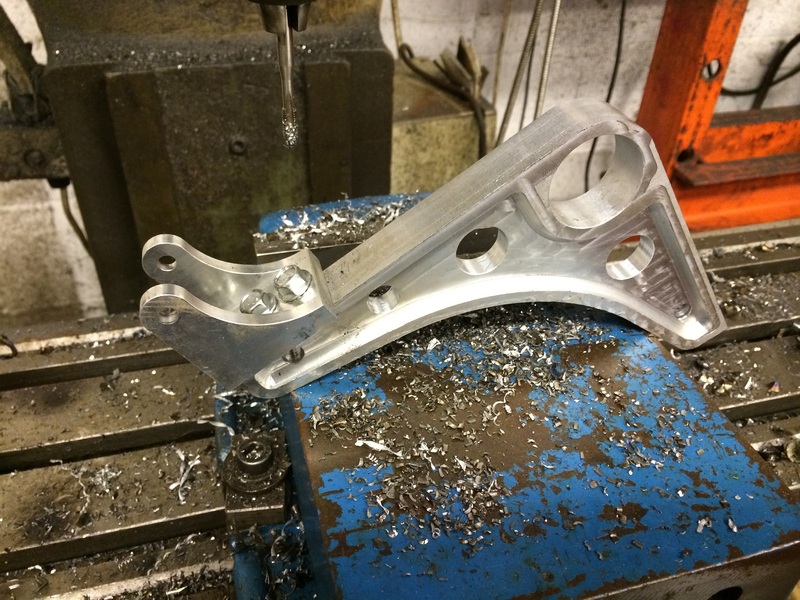 So we designed extra bracing for the rear mounting frame, then passed that over to to Dom and he cut it out on his CNC Plasma cutter. 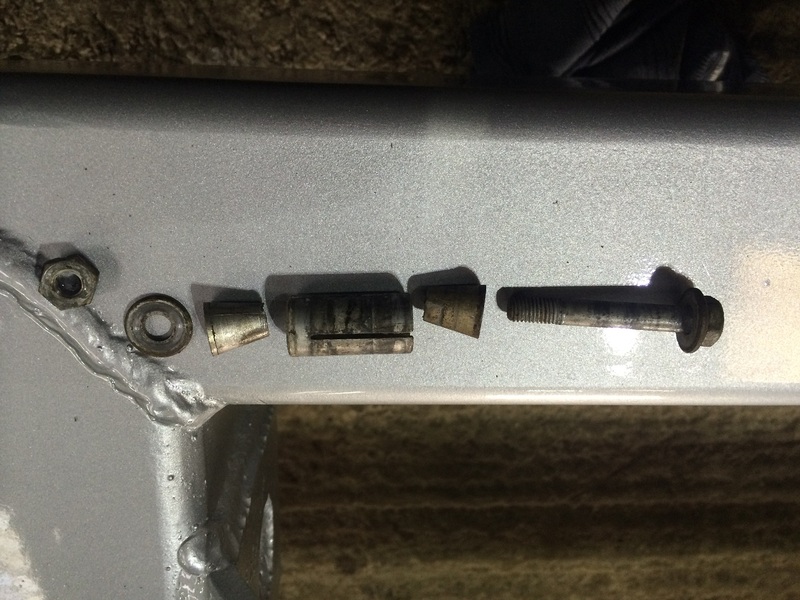 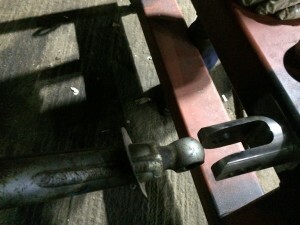 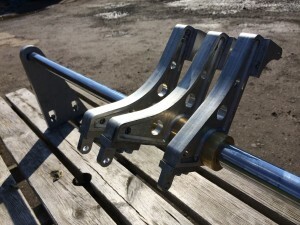 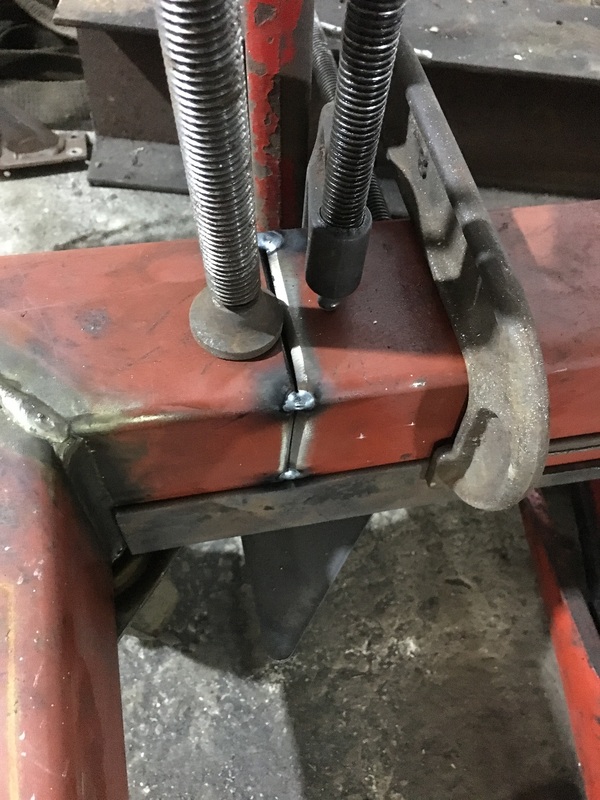 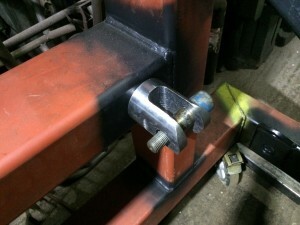 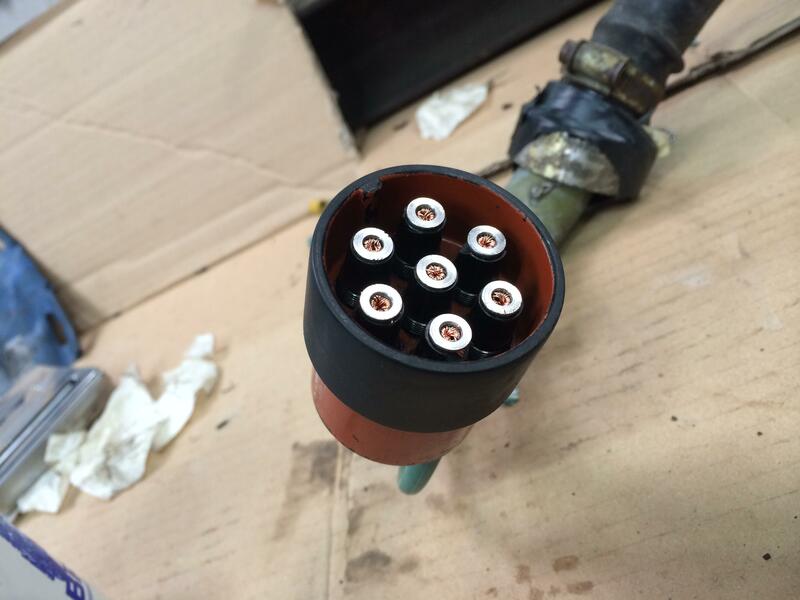 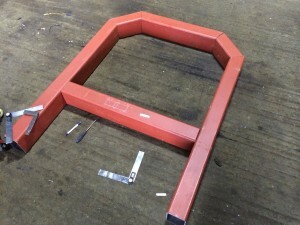 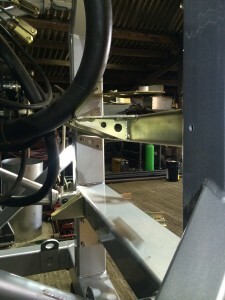 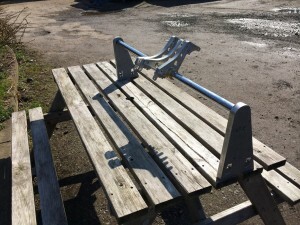 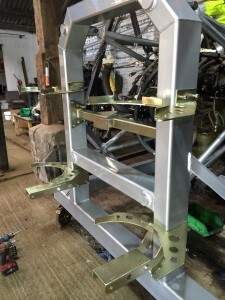 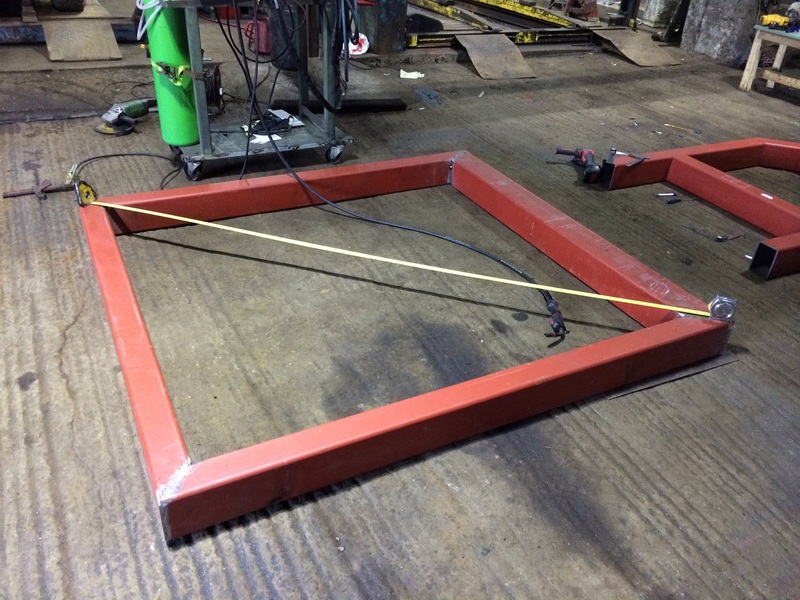 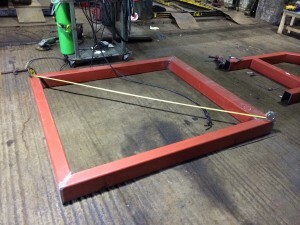 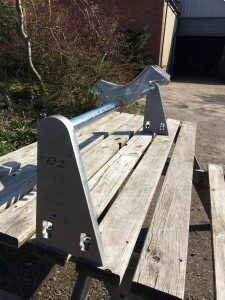 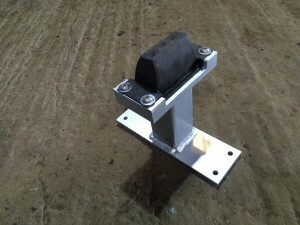 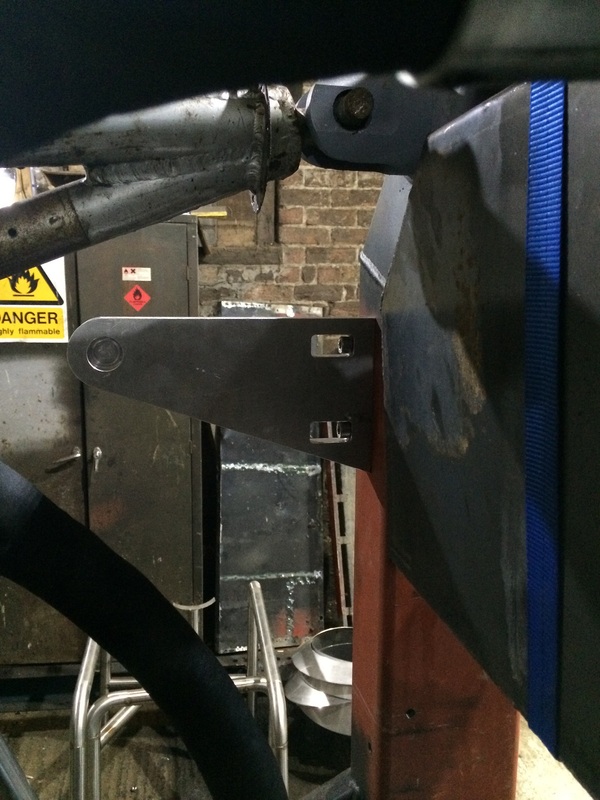 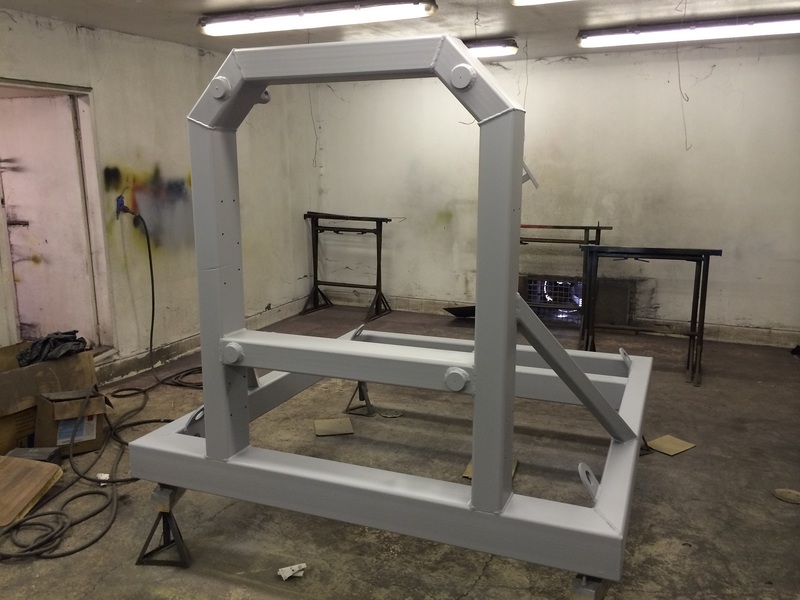 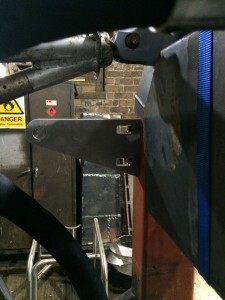 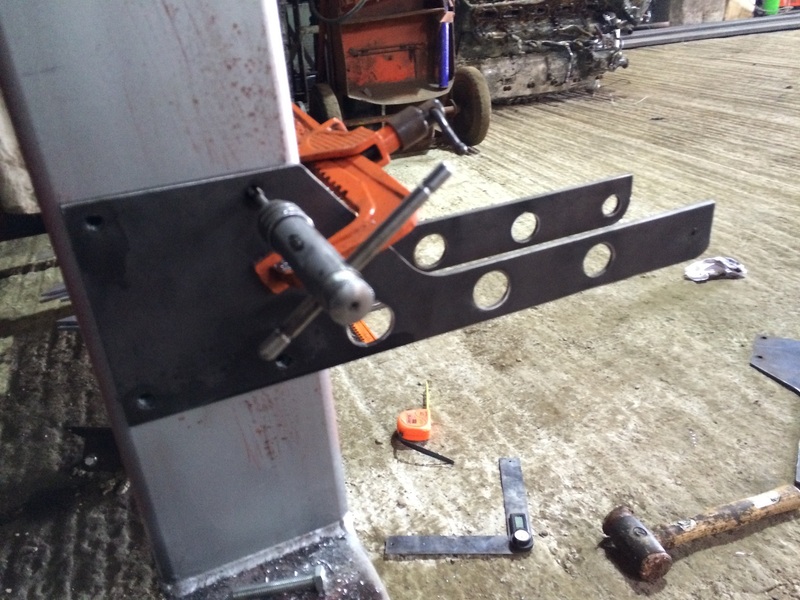 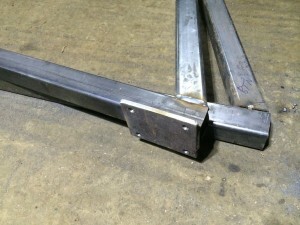 We used 5 mm steel to make the extra side mounts with internal gussets . 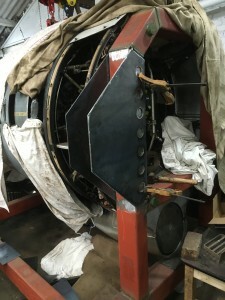 Then a couple of extra stays back on to the lower frame. 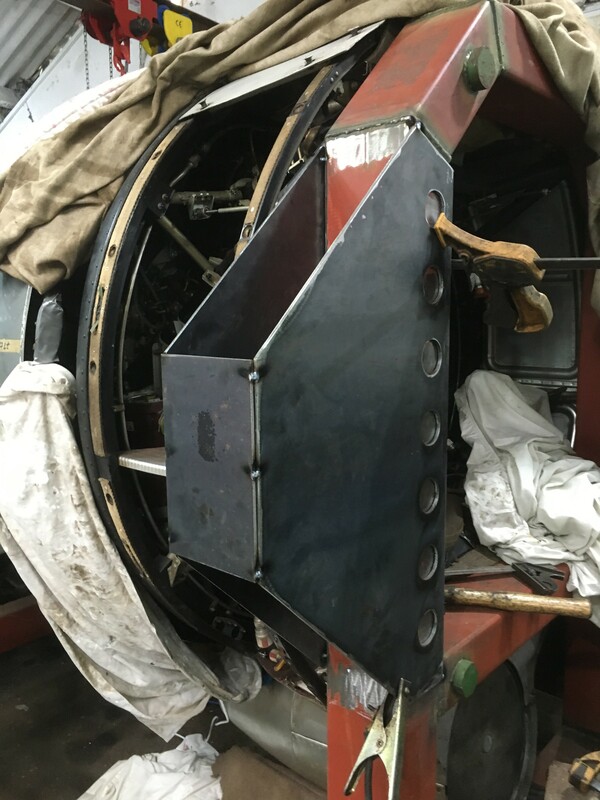 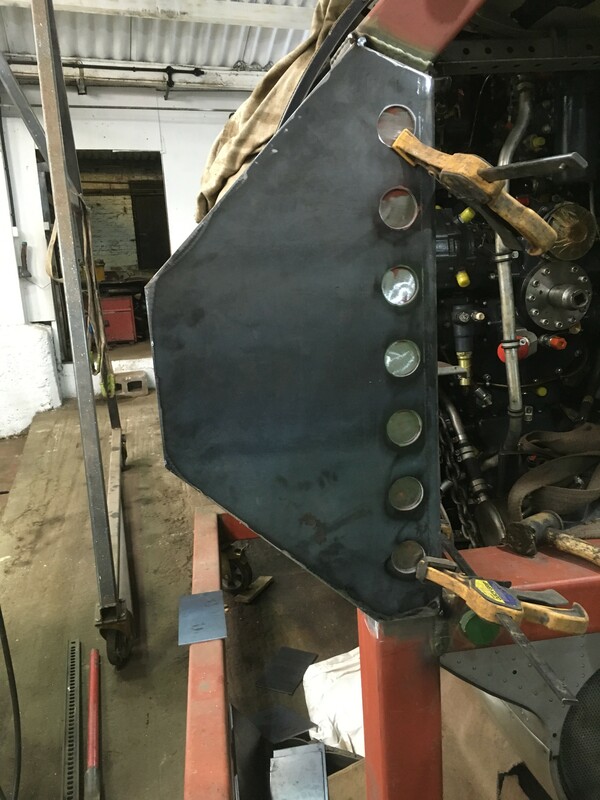 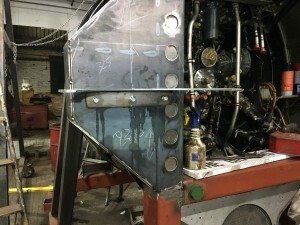 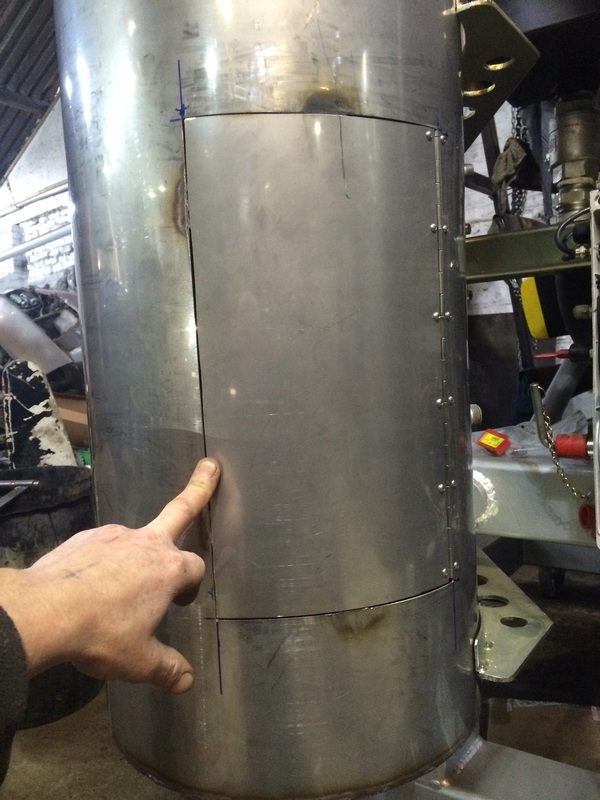 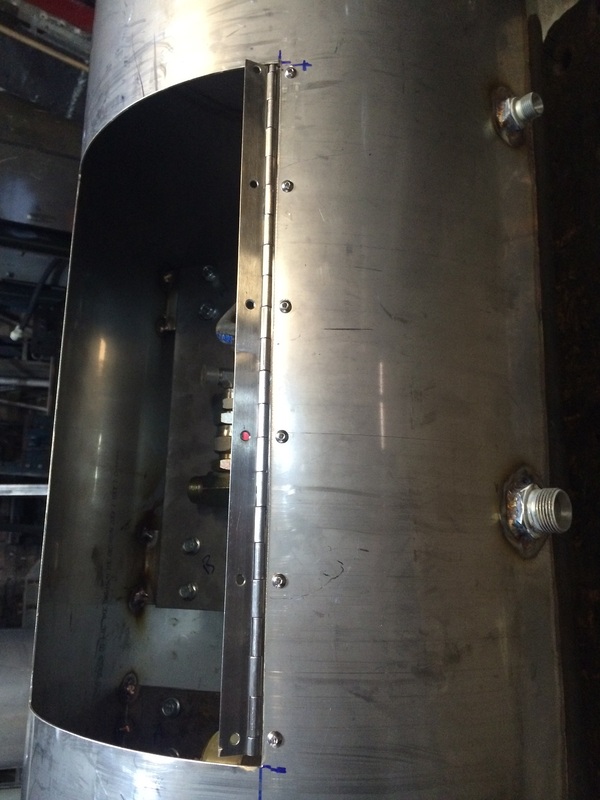 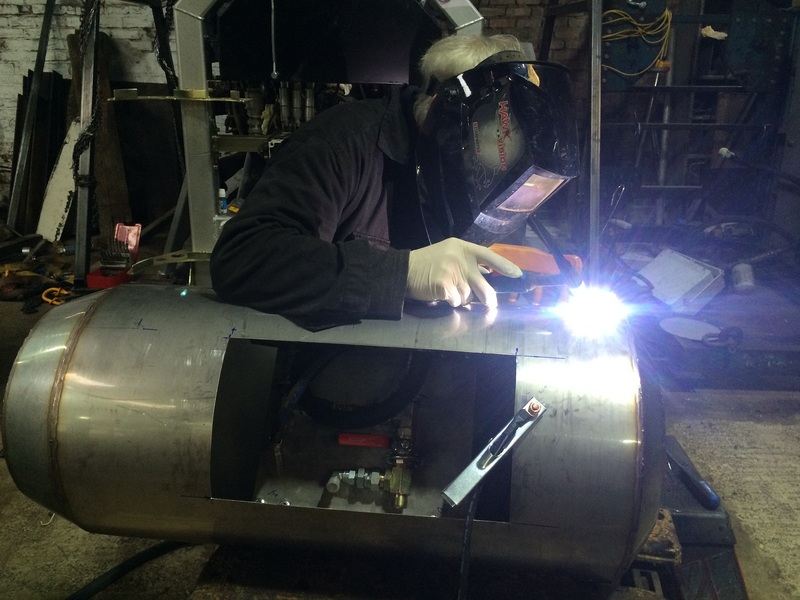 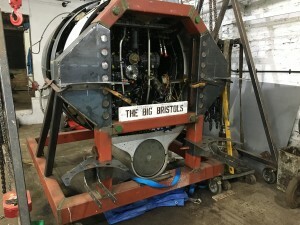 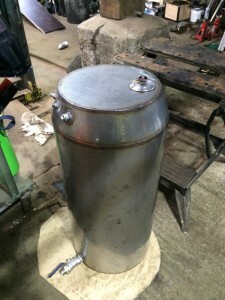 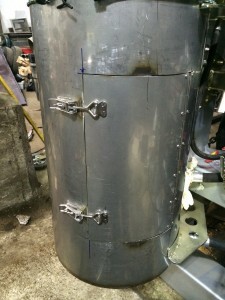 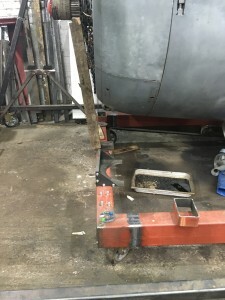 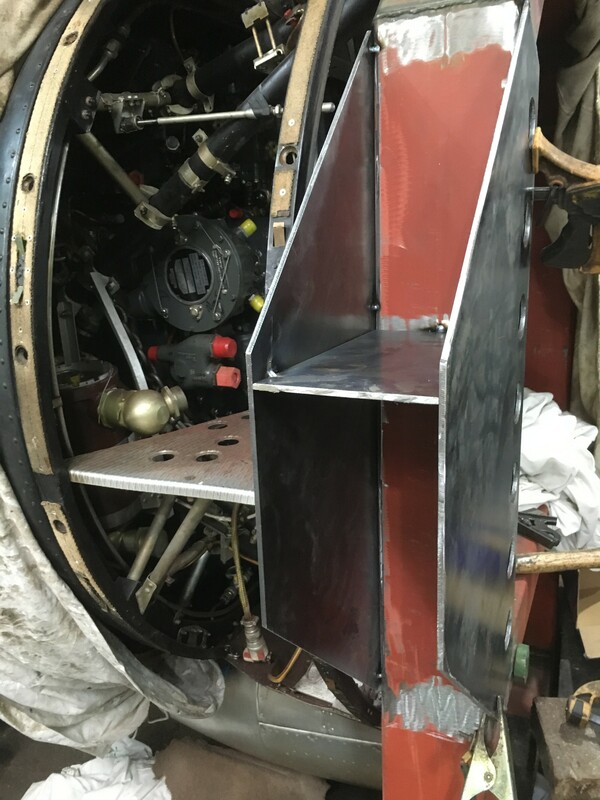 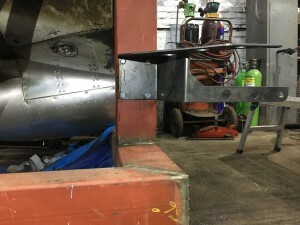 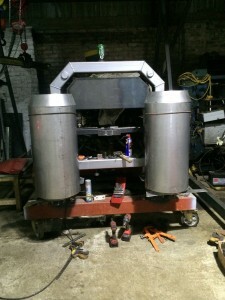 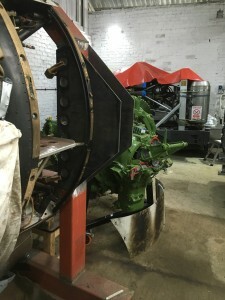 We plan to mount the tanks more to the side , which will cover up the extra steel work and leave the center section open so the rear of the engine is visible. 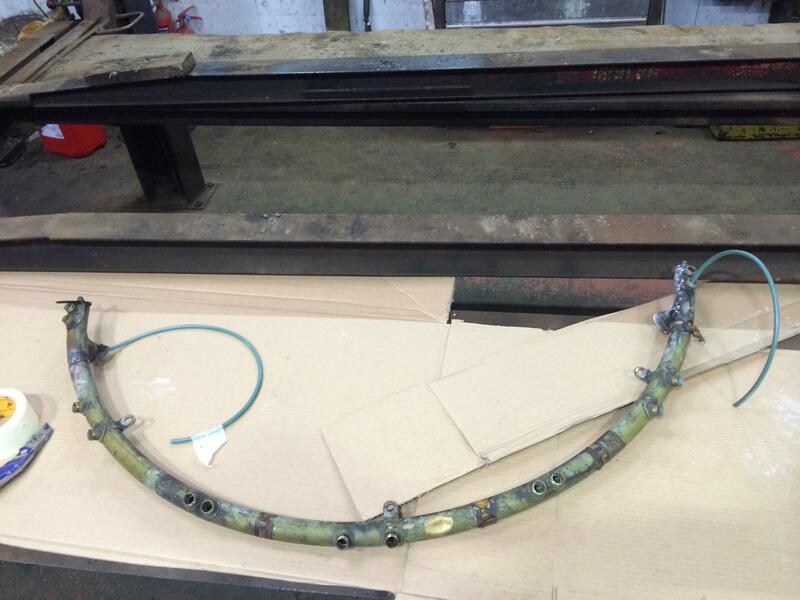 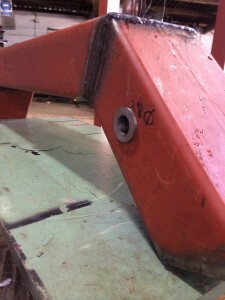 New Tank mounts have been made just like on the 216 but offset to the outside. 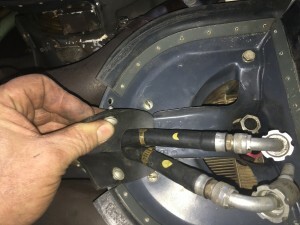 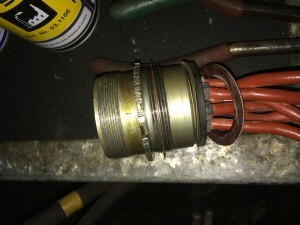 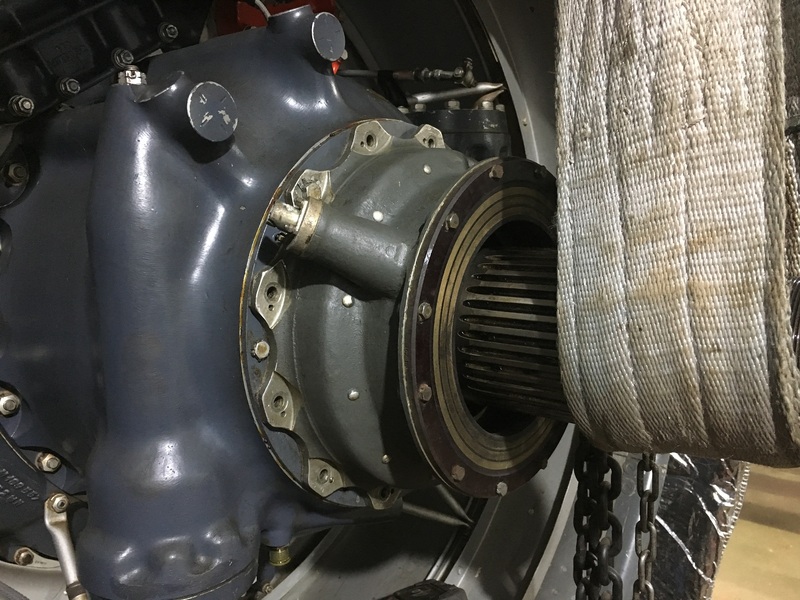 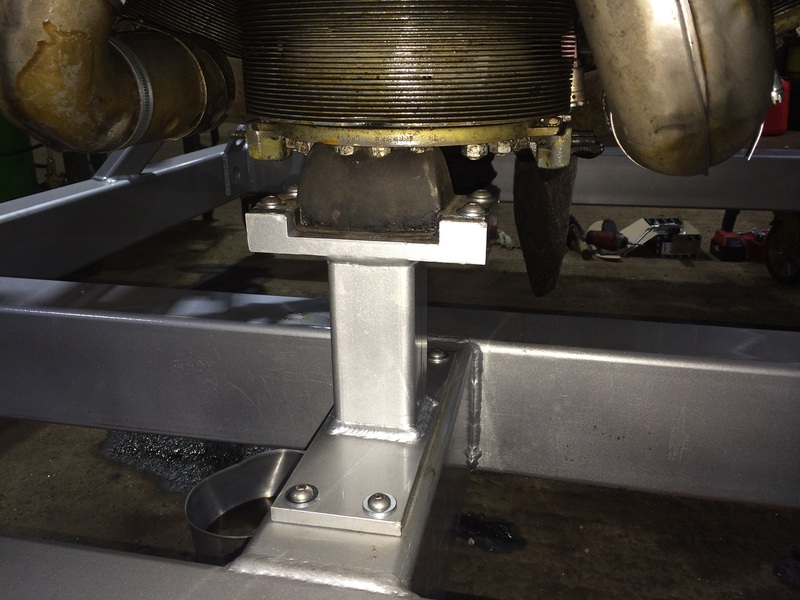 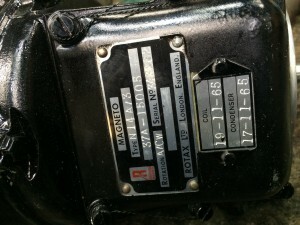 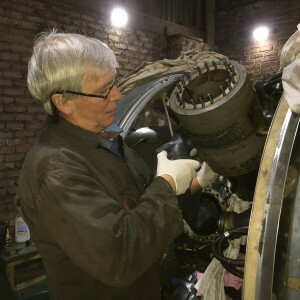 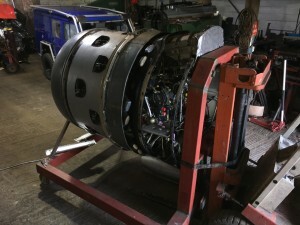 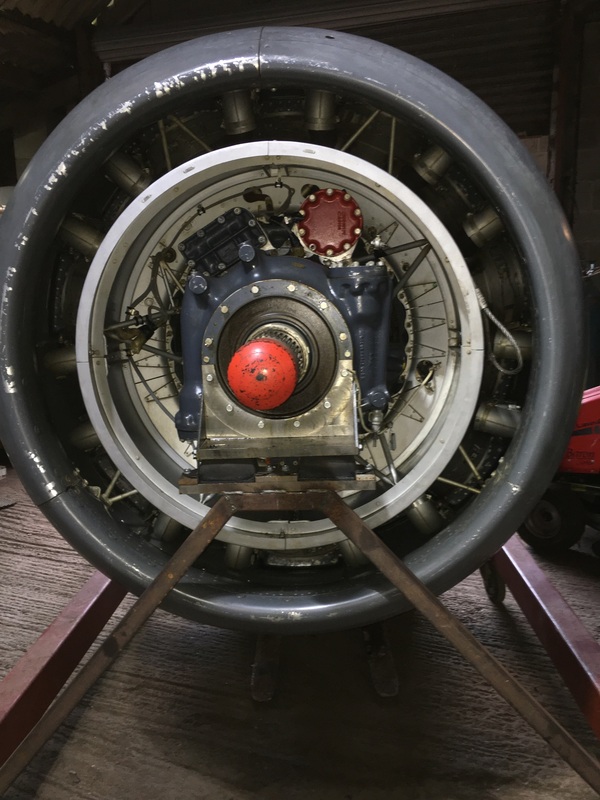 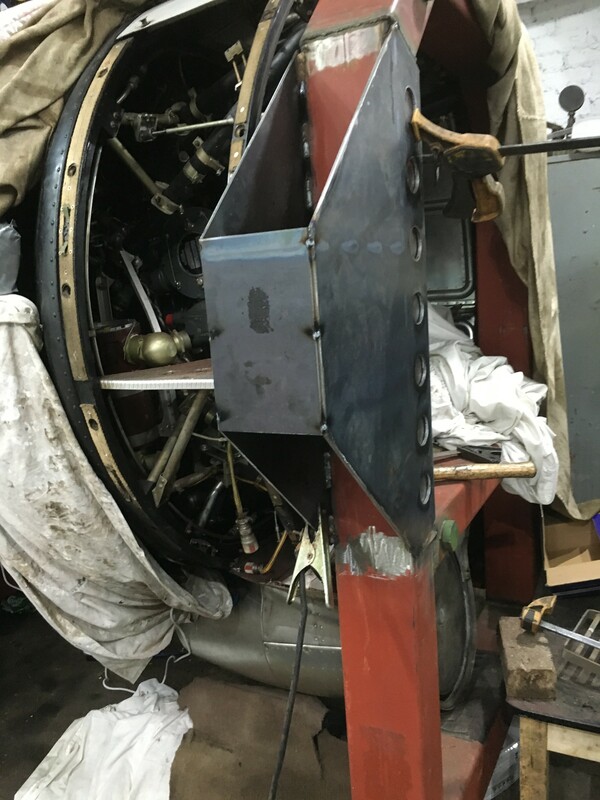 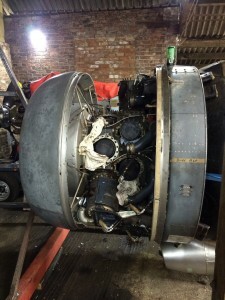 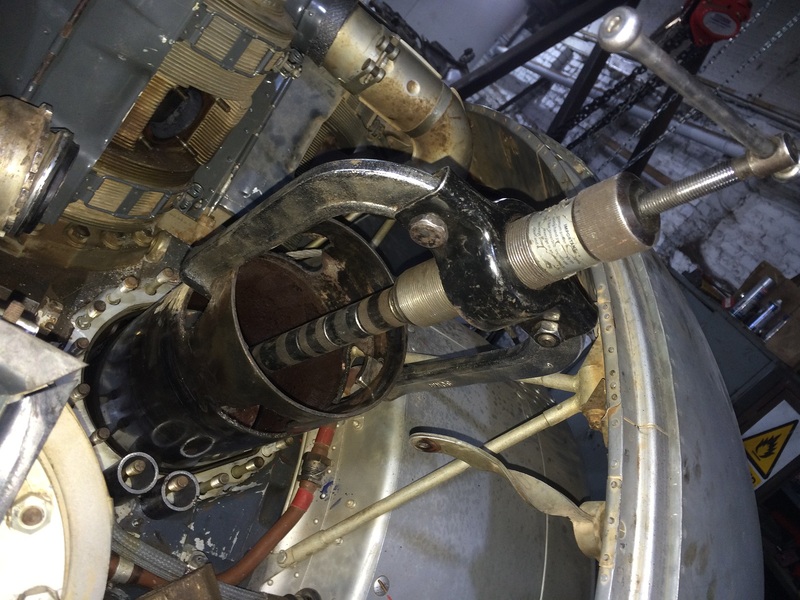 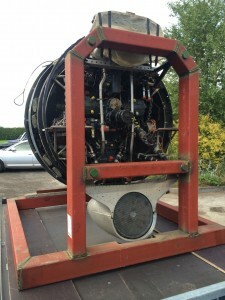 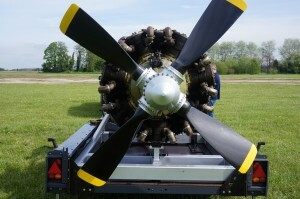 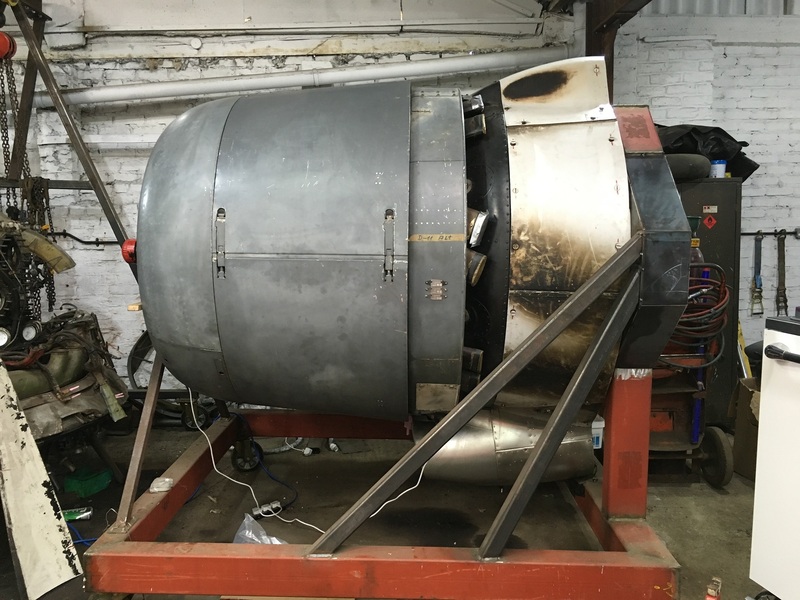 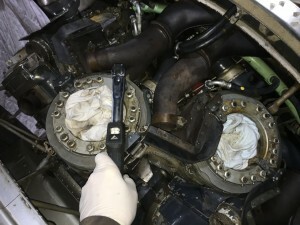 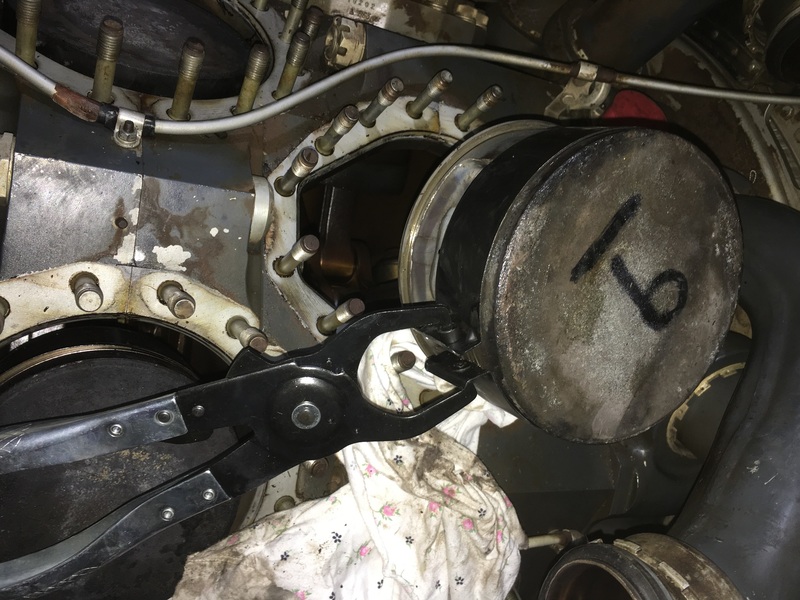 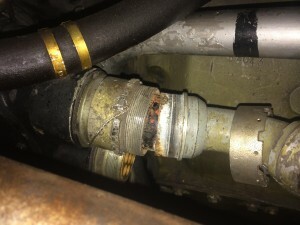 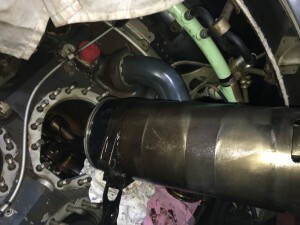 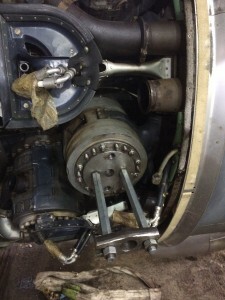 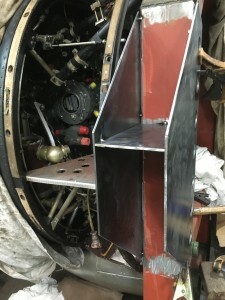 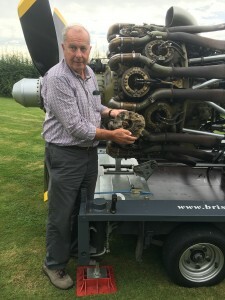 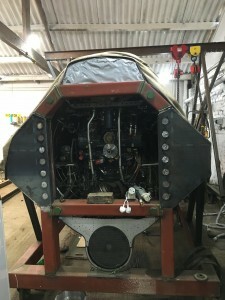 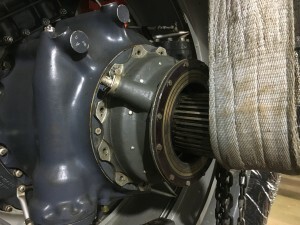 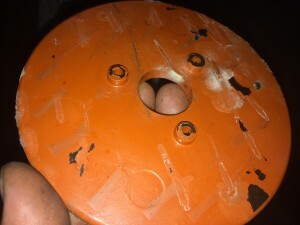 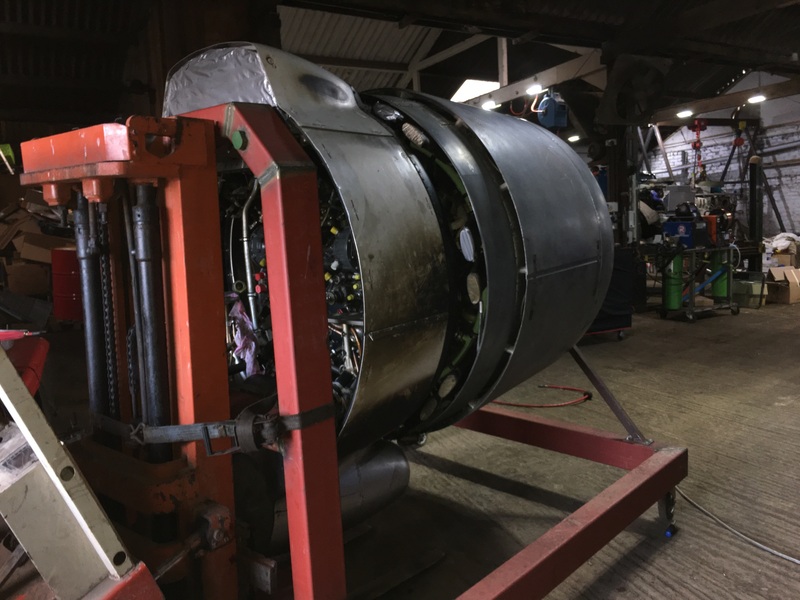 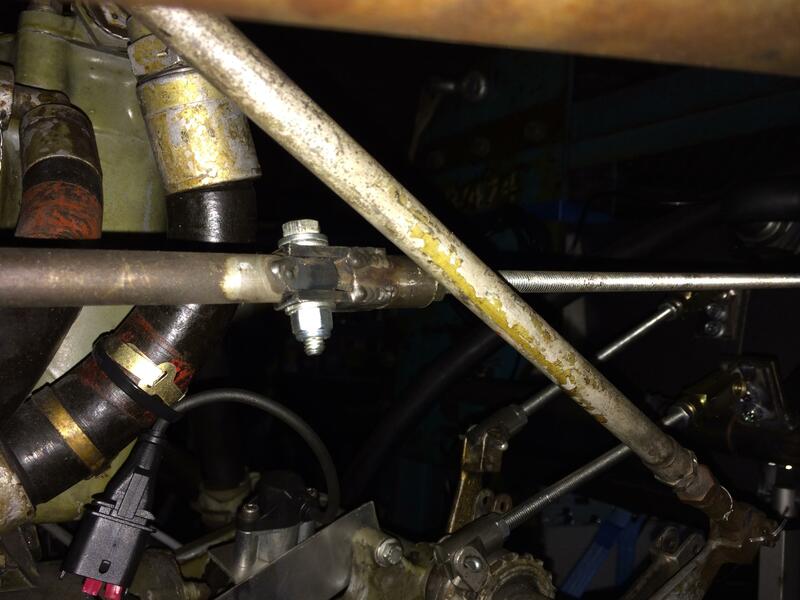 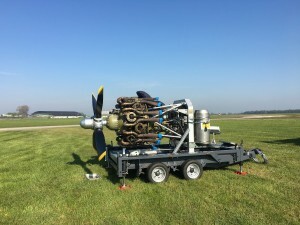 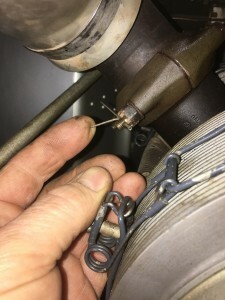 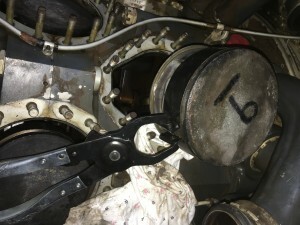 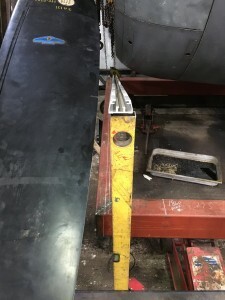 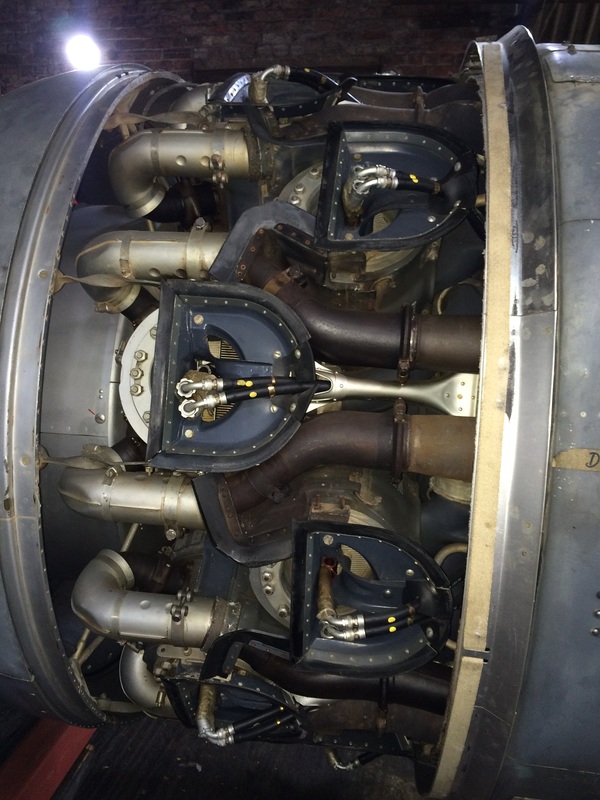 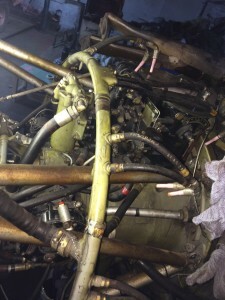 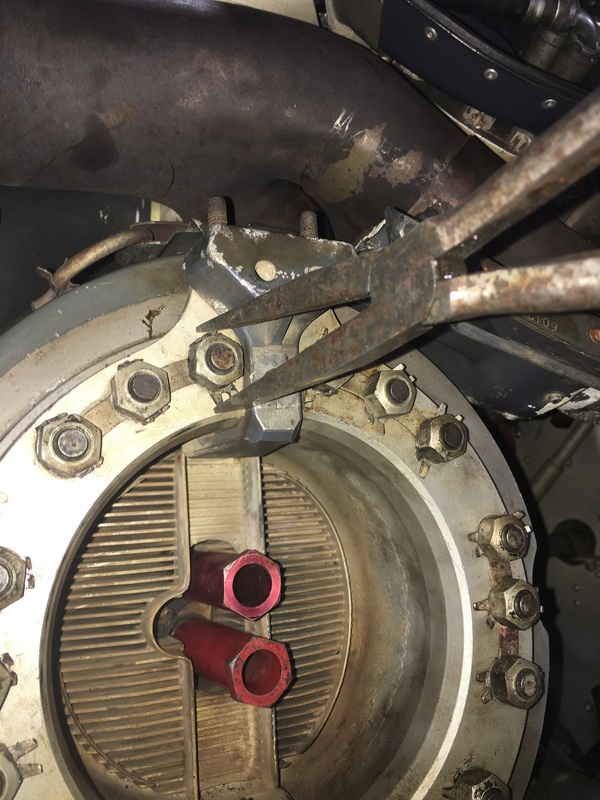 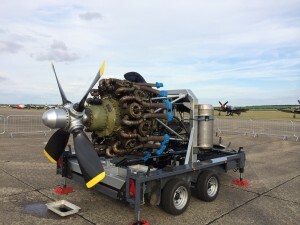 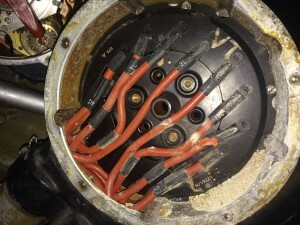 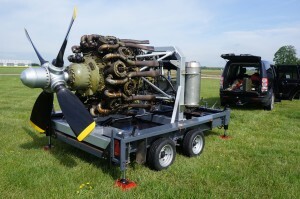 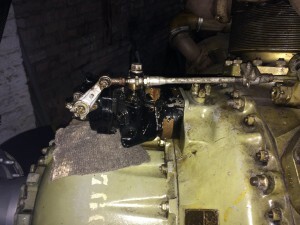 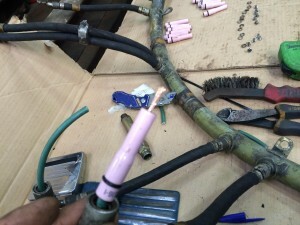 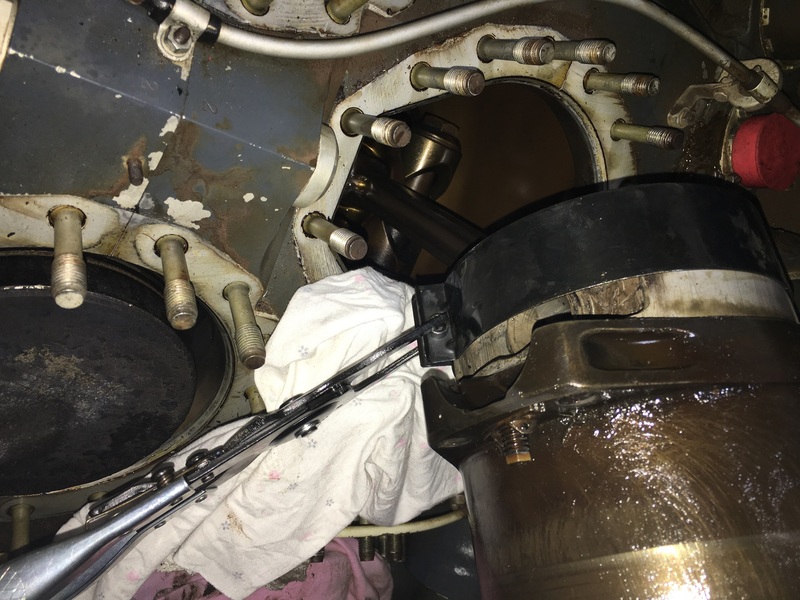 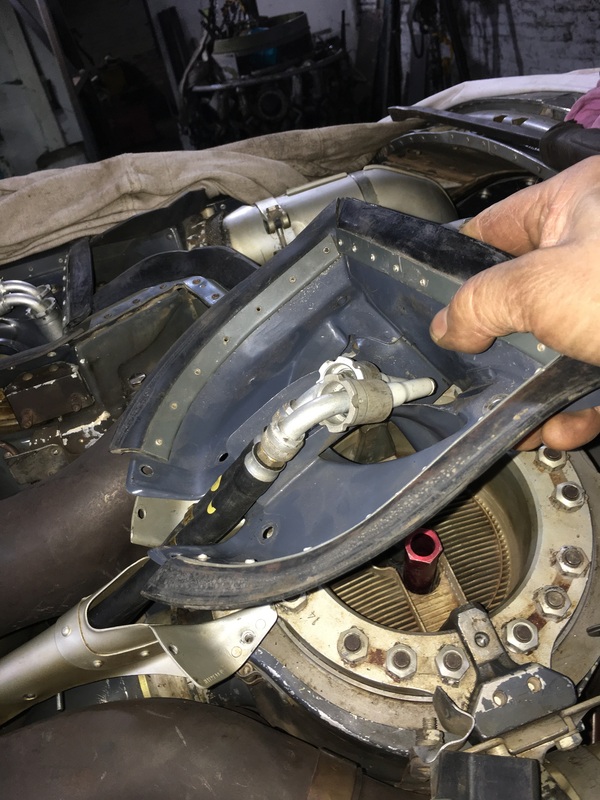 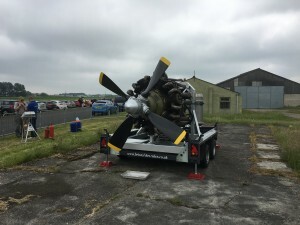 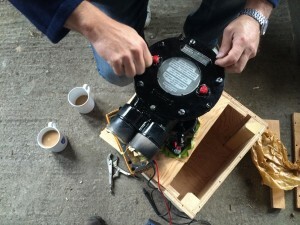 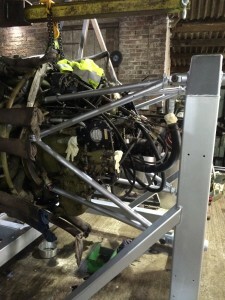 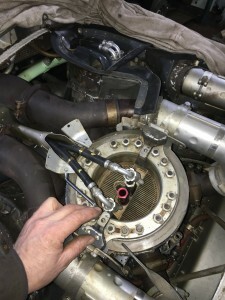 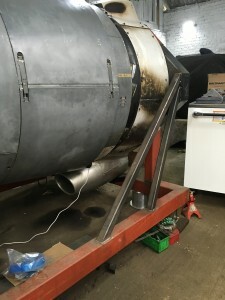 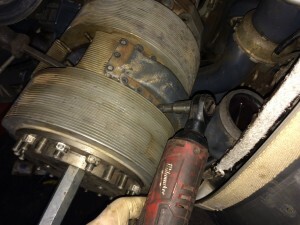 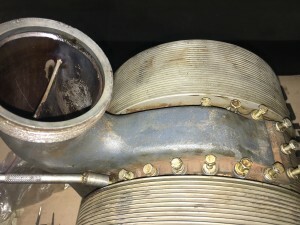 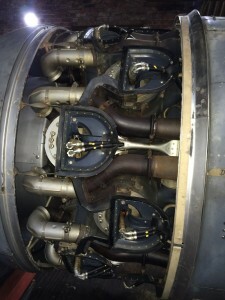 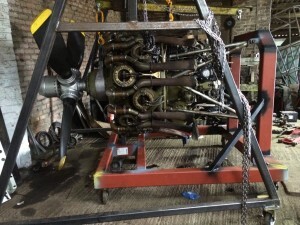 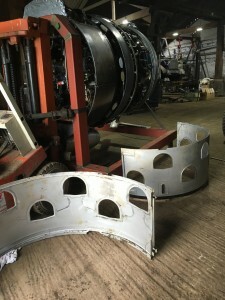 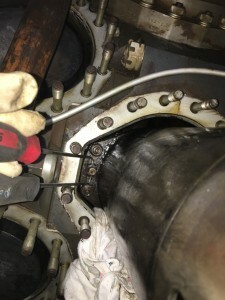 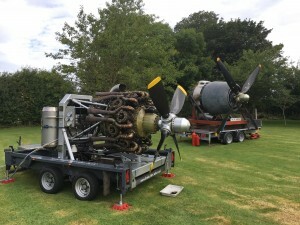 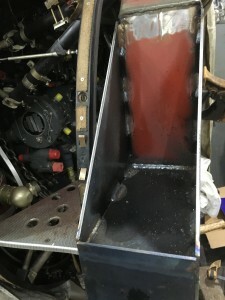 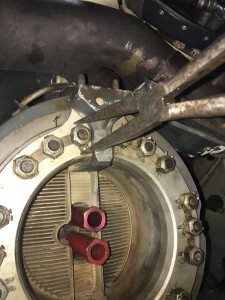 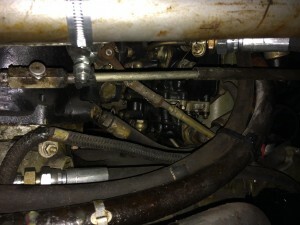 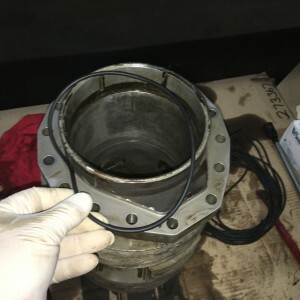 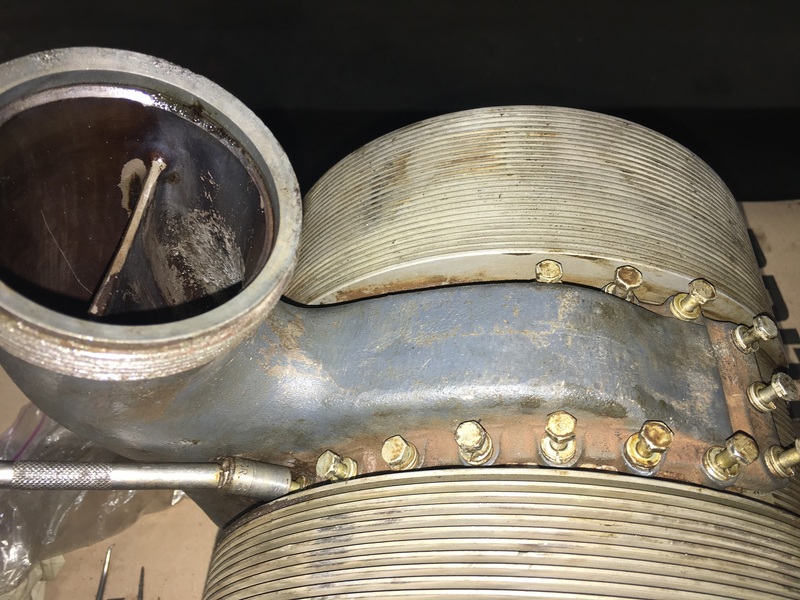 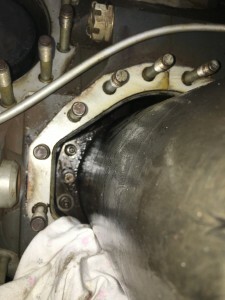 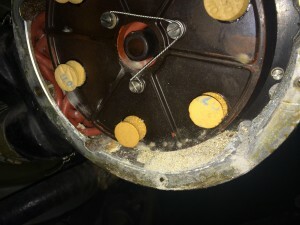 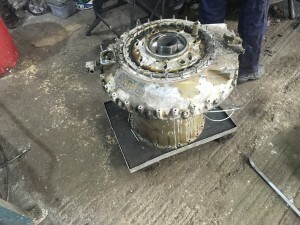 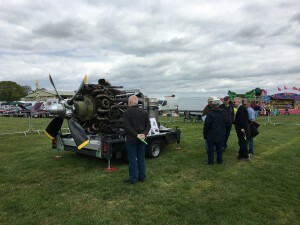 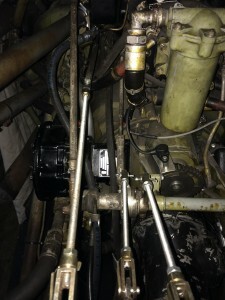 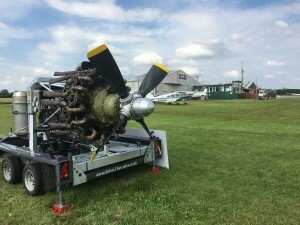 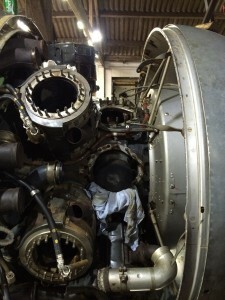 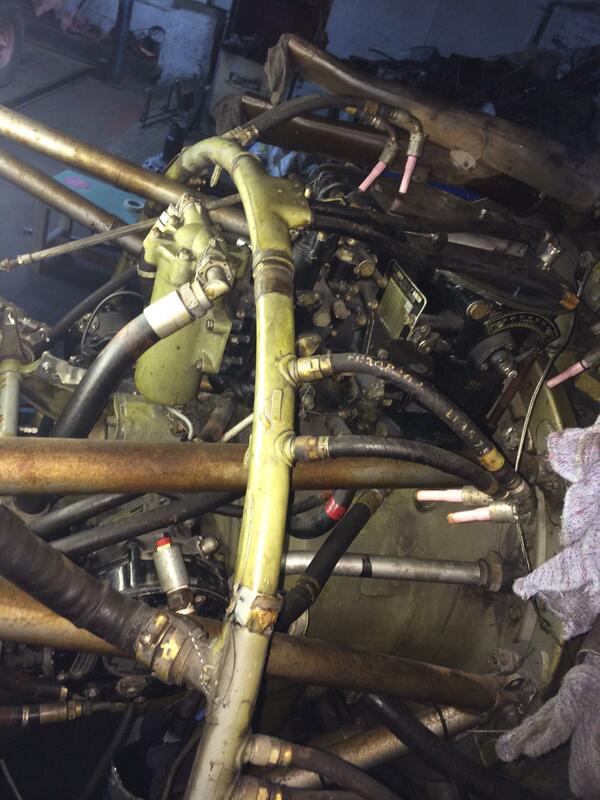 Note the extra casing that is fitted to this 759 to allow electrical connection to the prop hub,as there is limit switches inside to allow interlocking for prop thrust reverse. 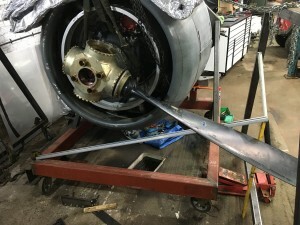 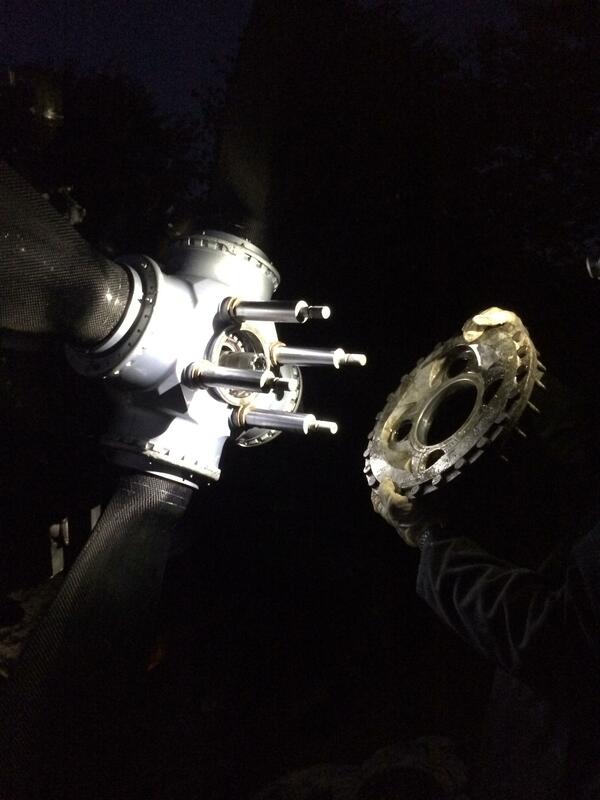 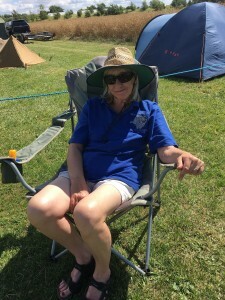 With my very helpful wife Gill the prop hub and one blade was mounted to check clearances. 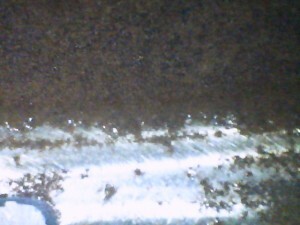 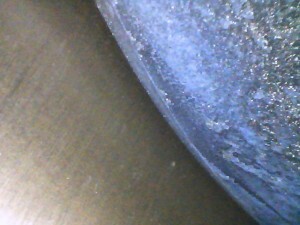 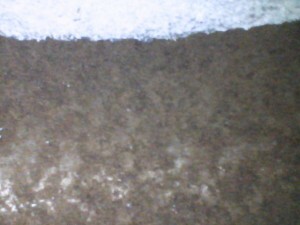 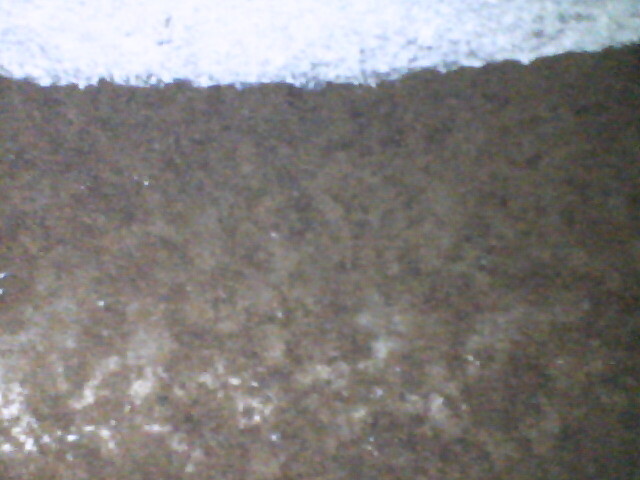 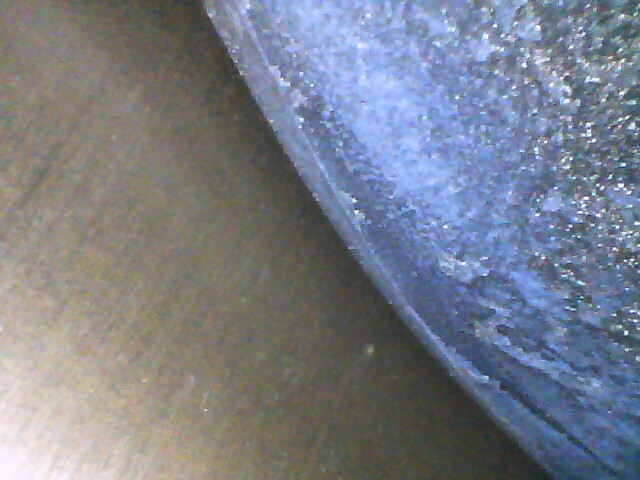 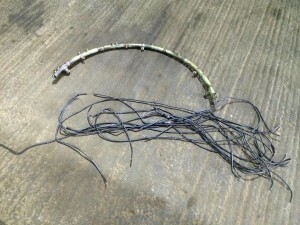 As you can see the blade in full feather would touch the frame. 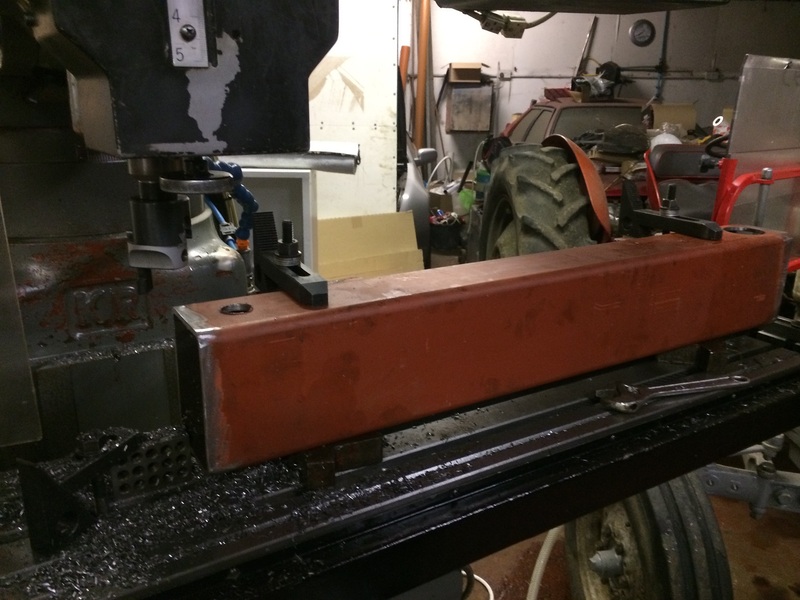 After a bit more measuring , we decided that 60 mm needed to come out. 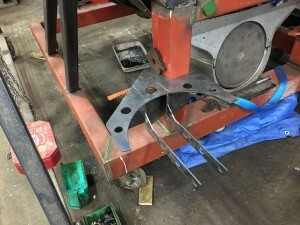 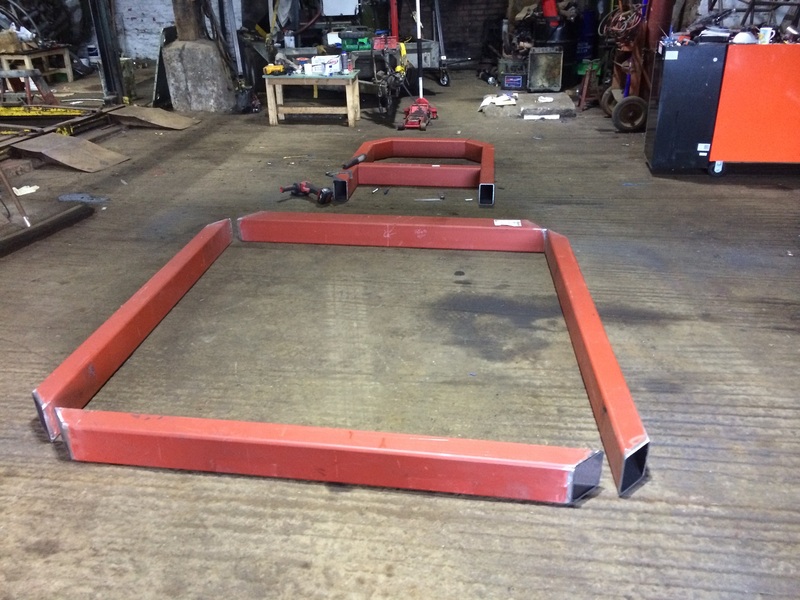 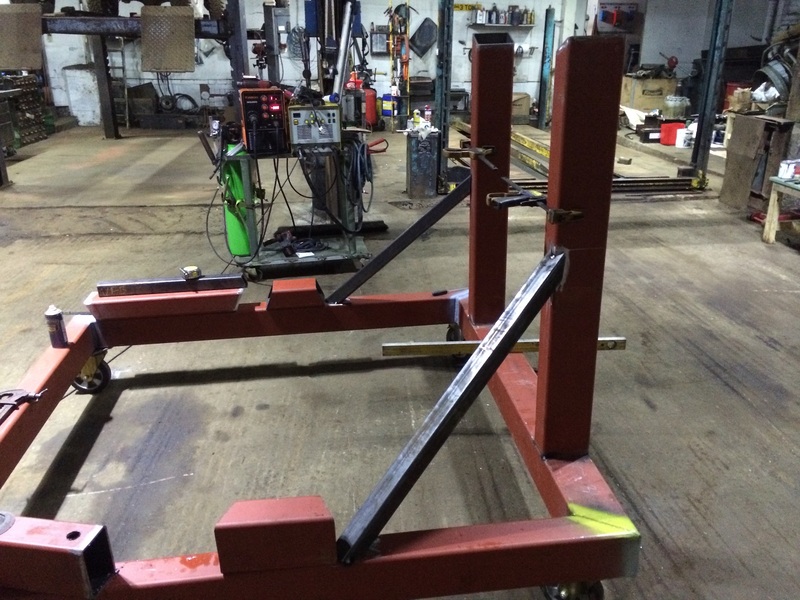 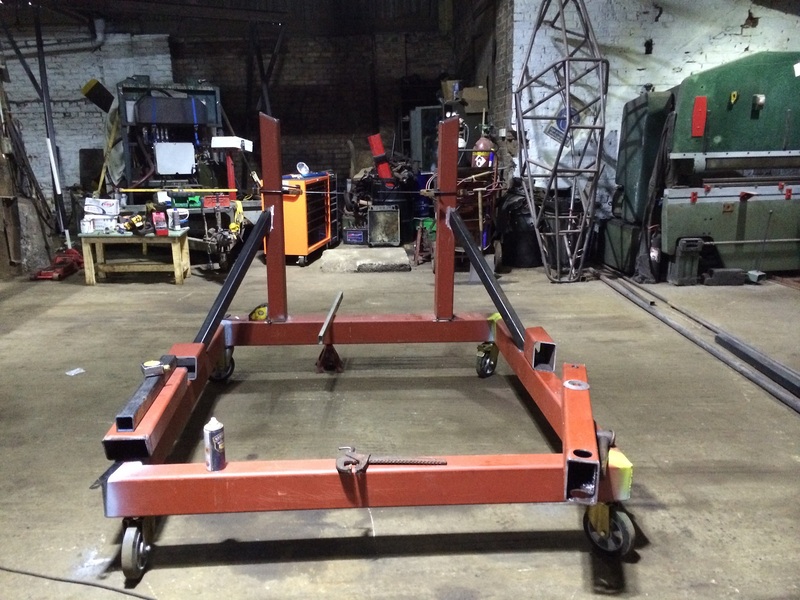 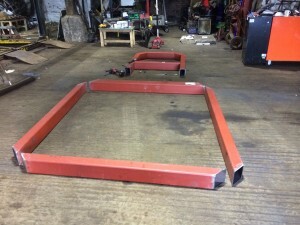 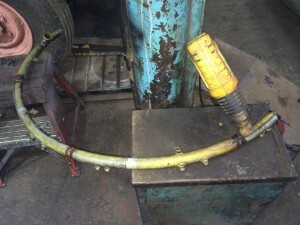 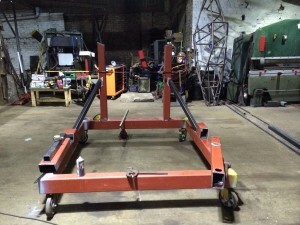 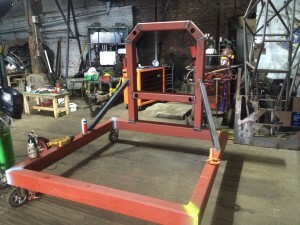 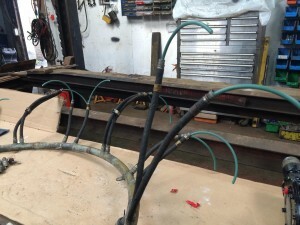 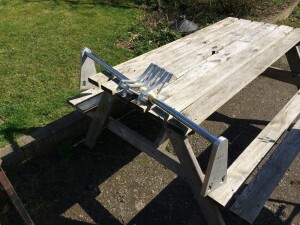 After Chopping the frame back by 60 mm, it was all clamped back up and welded up. 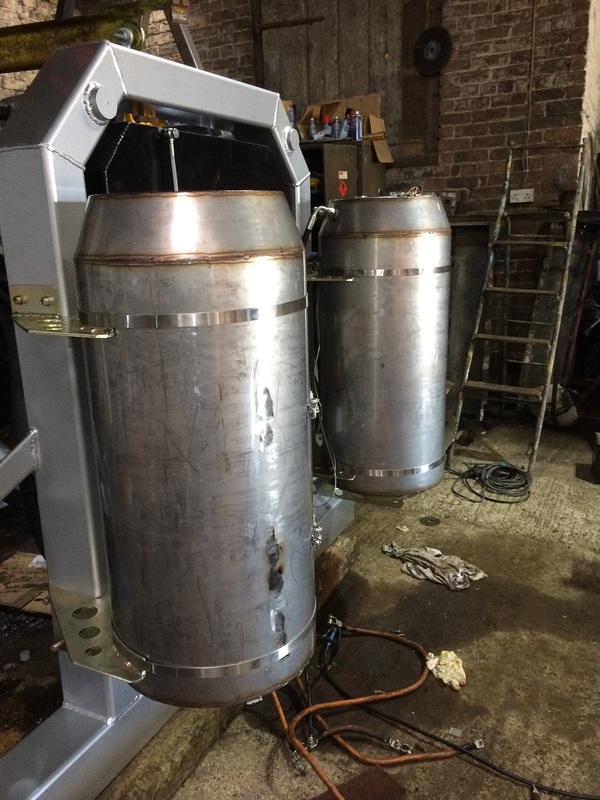 Next job make up the tanks. At the shows, there is always two questions asked from young and old. 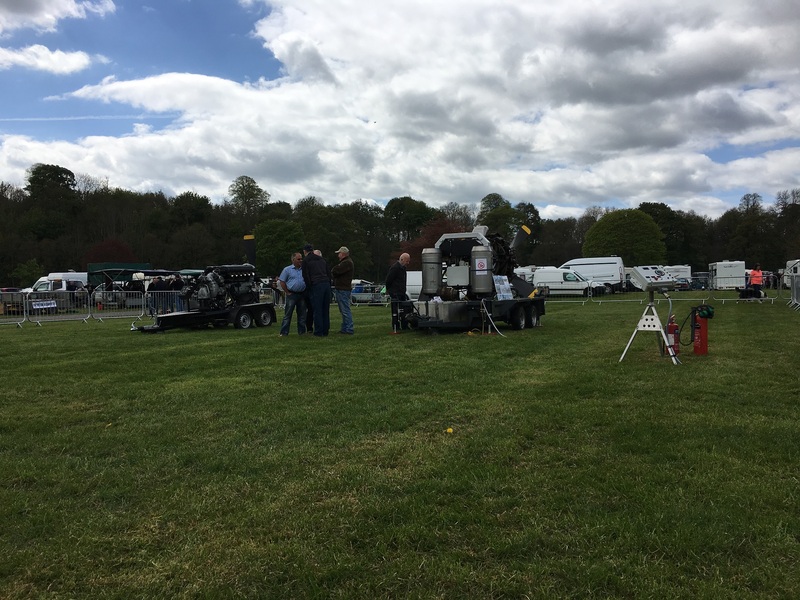 So we decided to make a display unit that can be taken to shows and people can have a hands on demonstration of both of these questions. 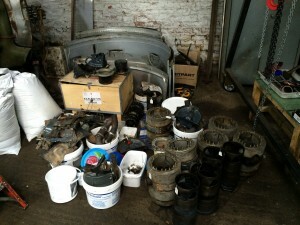 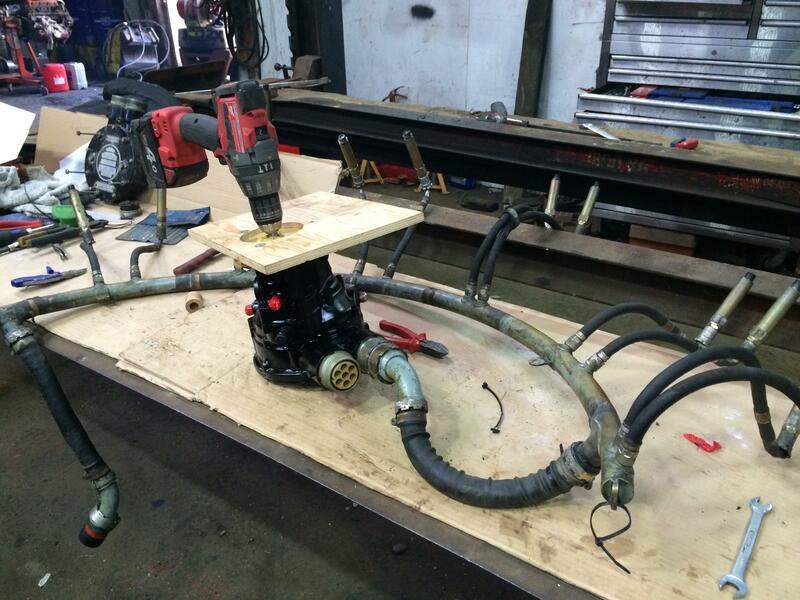 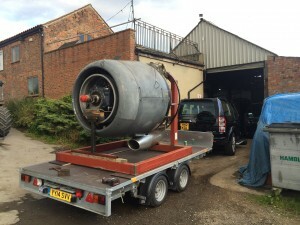 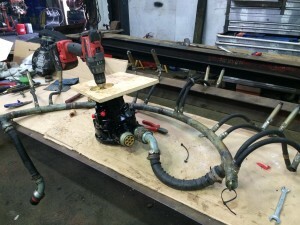 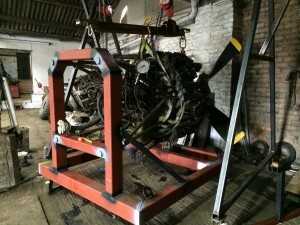 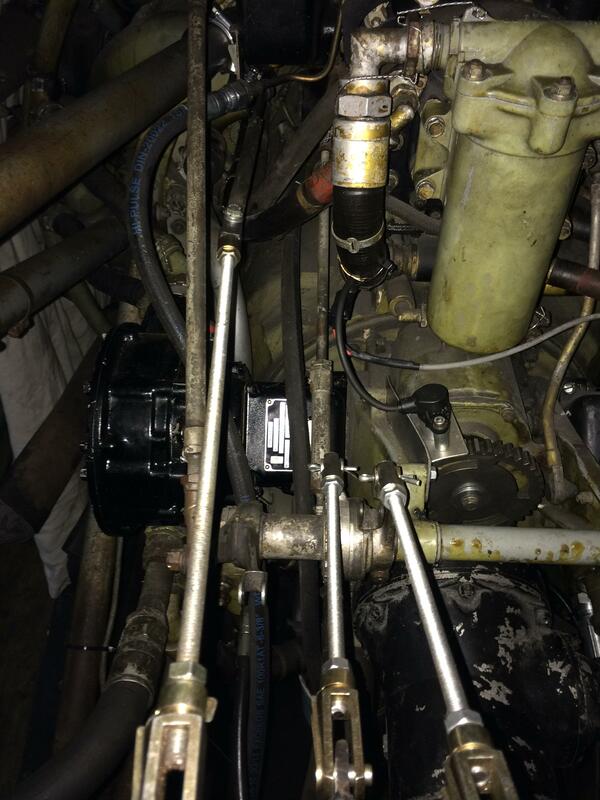 We had a old 264 engine that we had removed all useful parts, so we decided to use this to make our display unit. 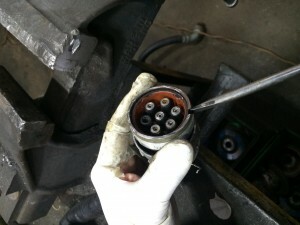 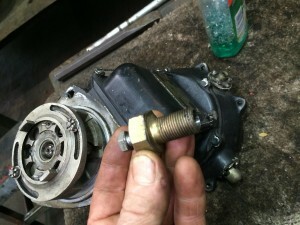 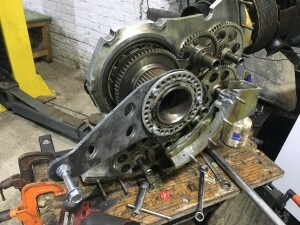 First I cut up the front crank case section then the timing case cover using a reciprocating saw. 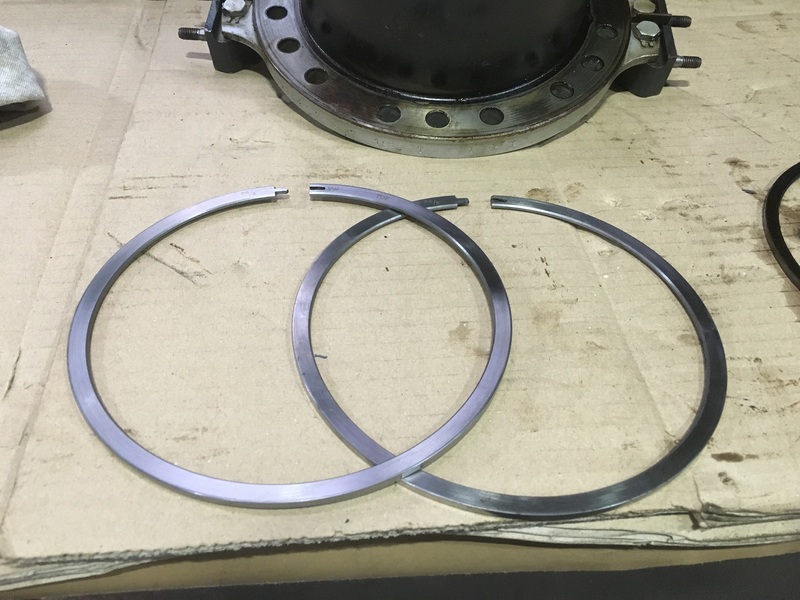 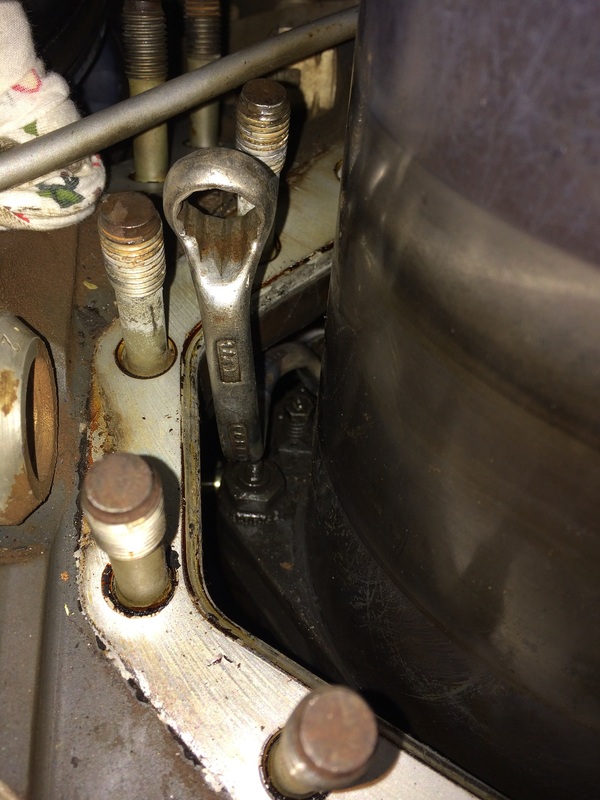 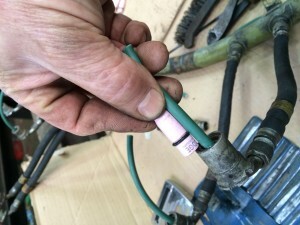 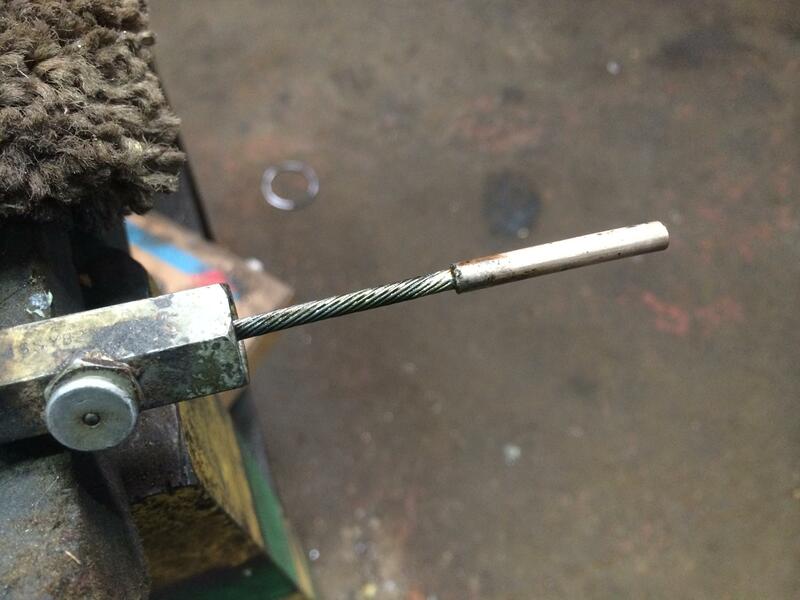 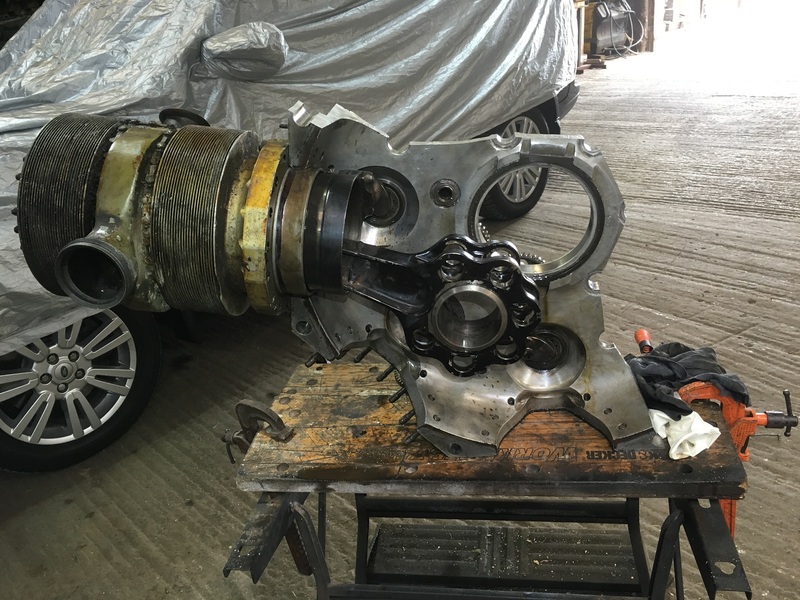 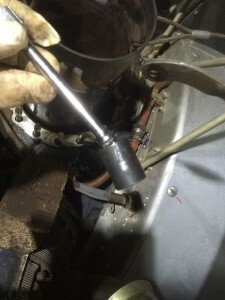 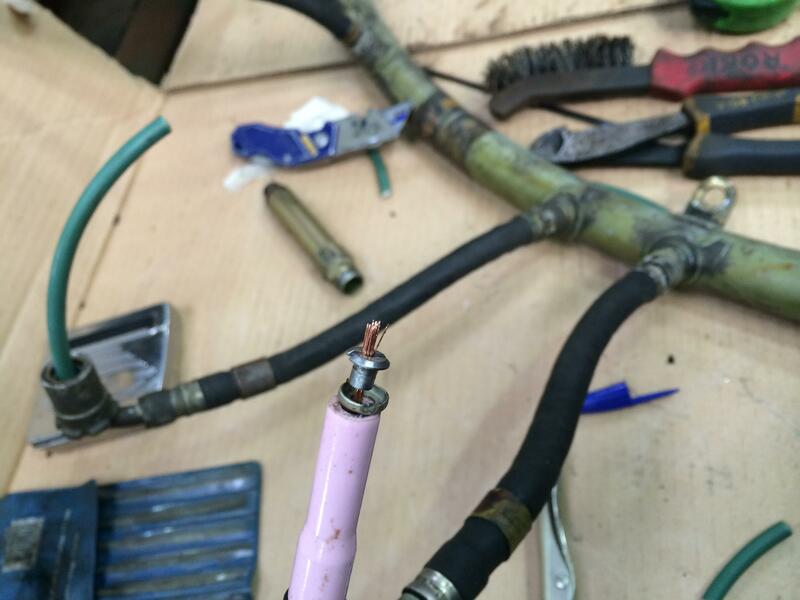 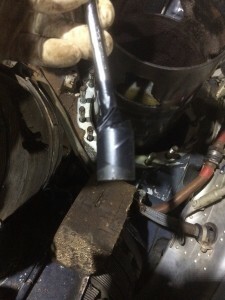 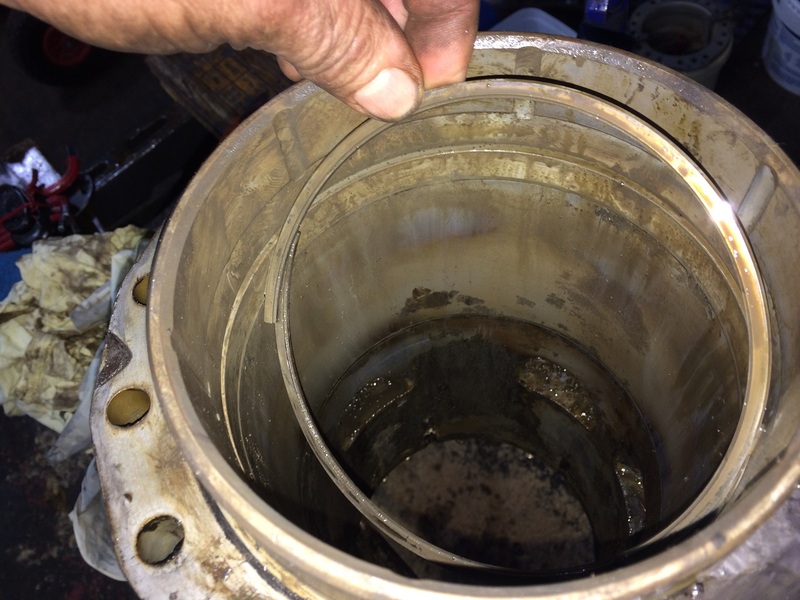 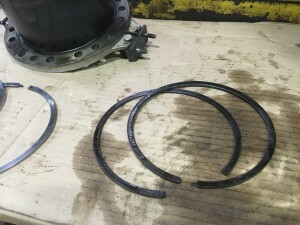 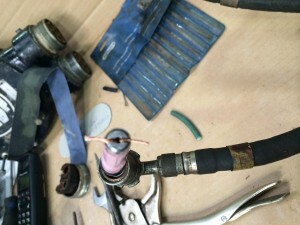 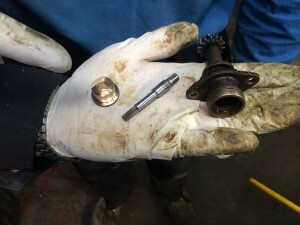 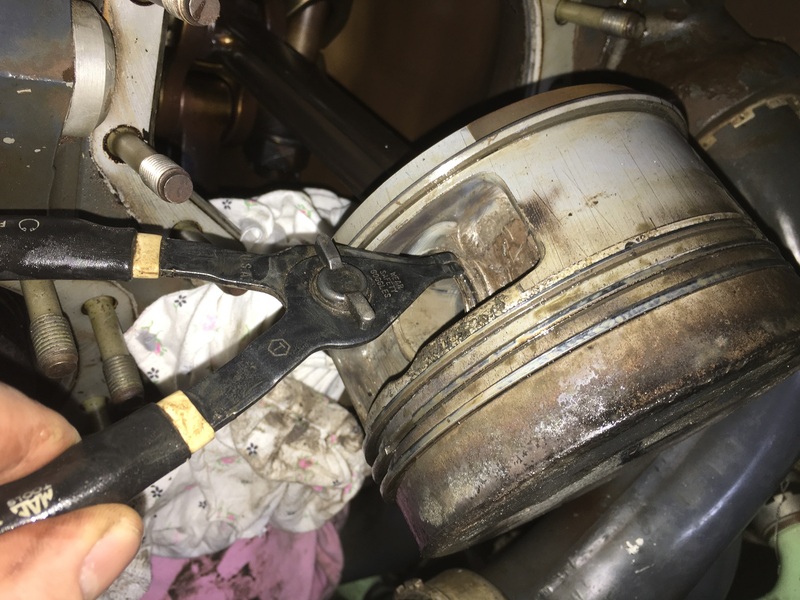 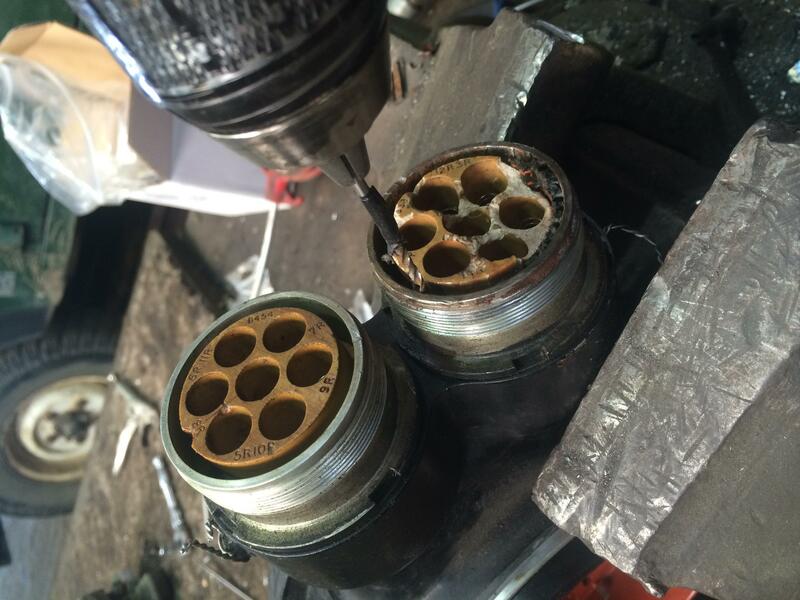 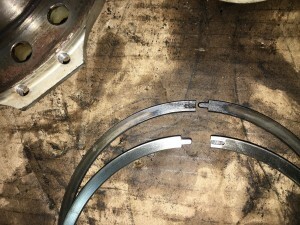 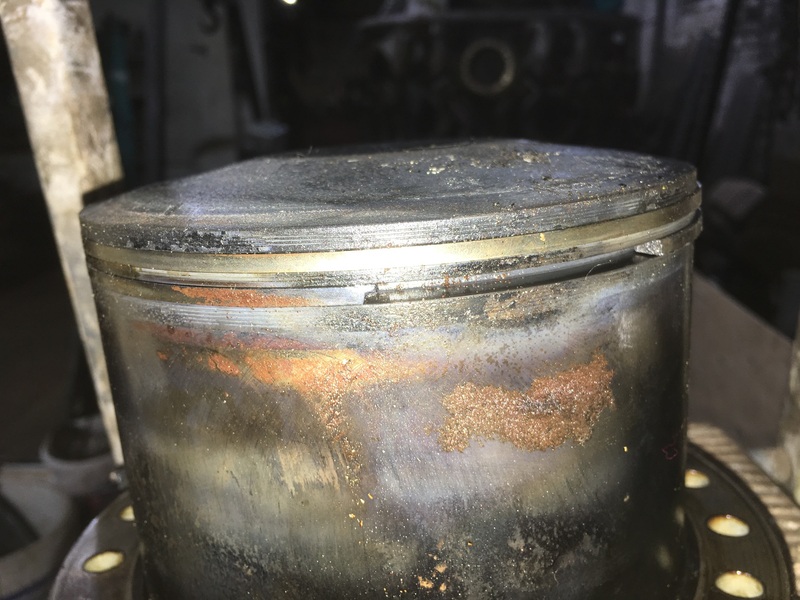 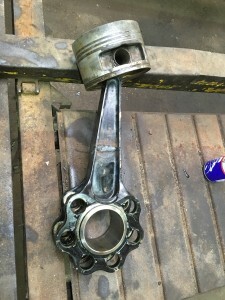 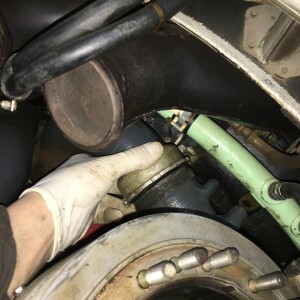 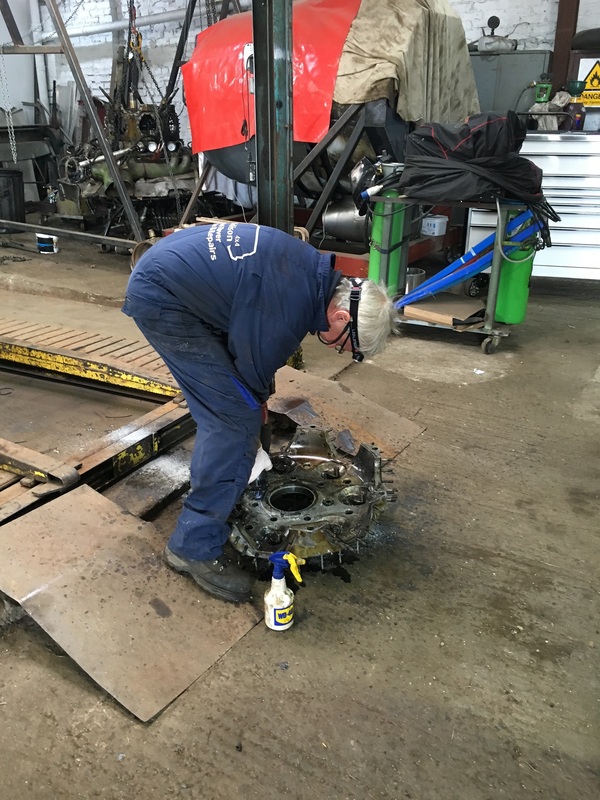 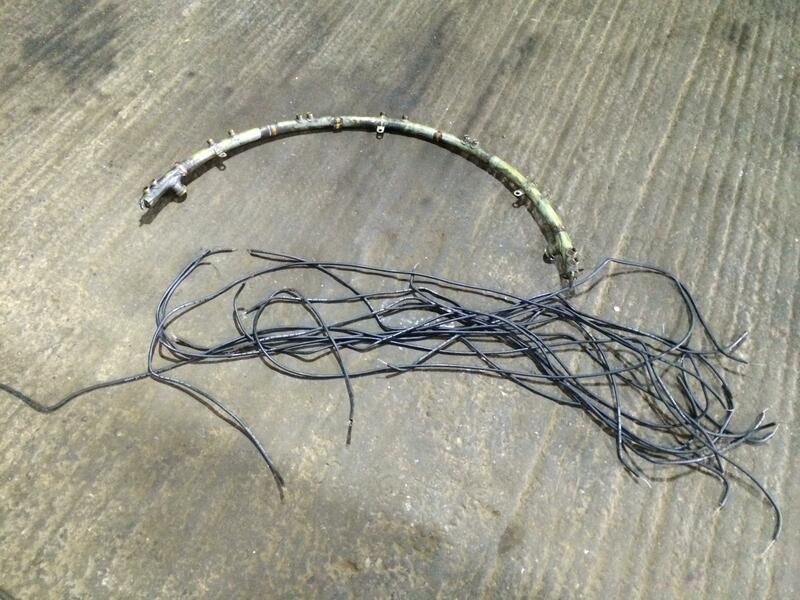 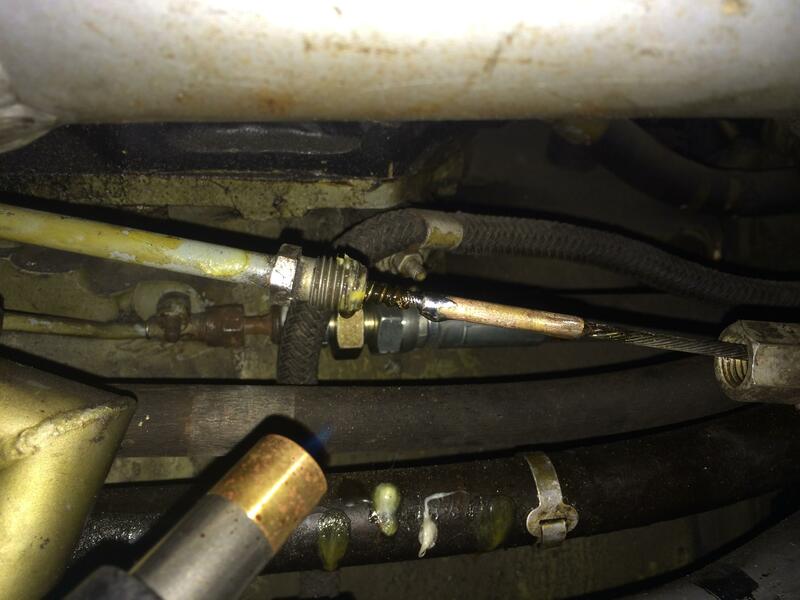 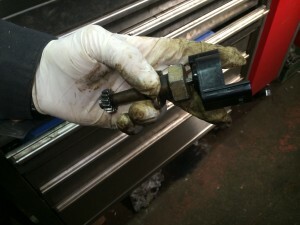 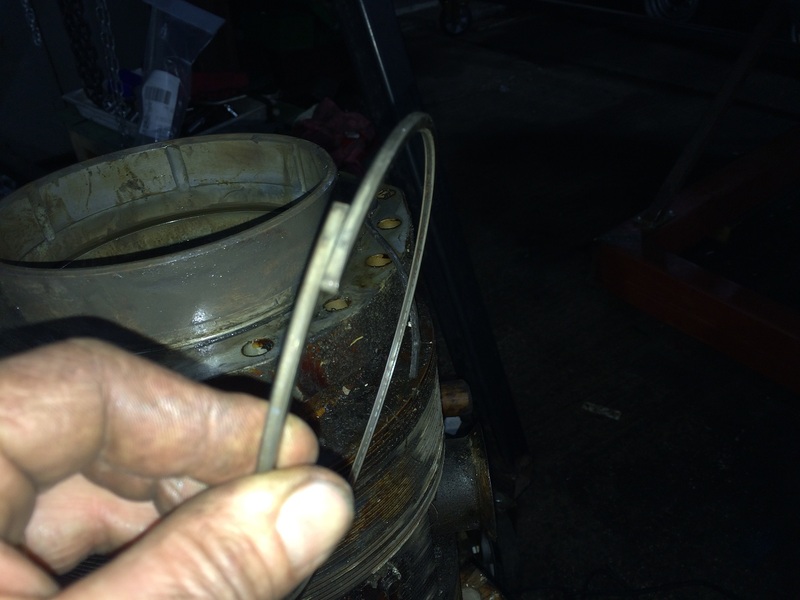 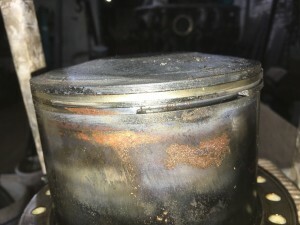 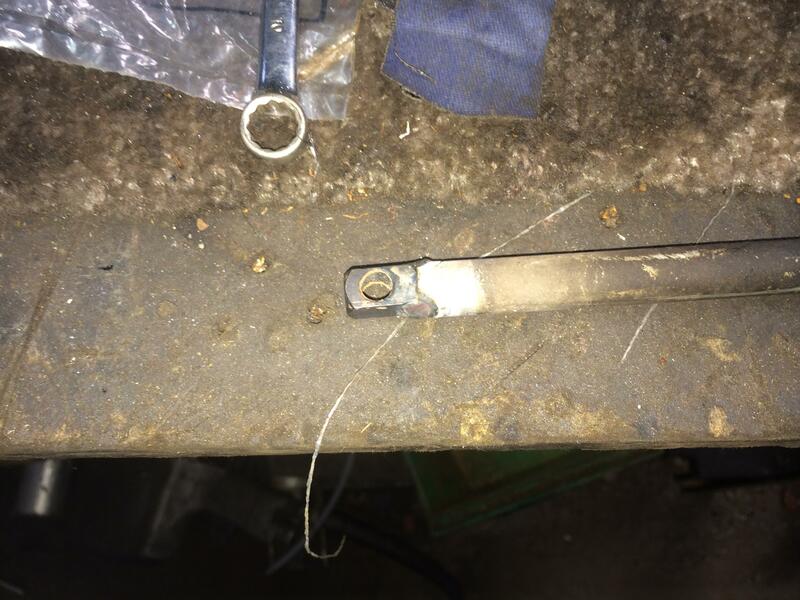 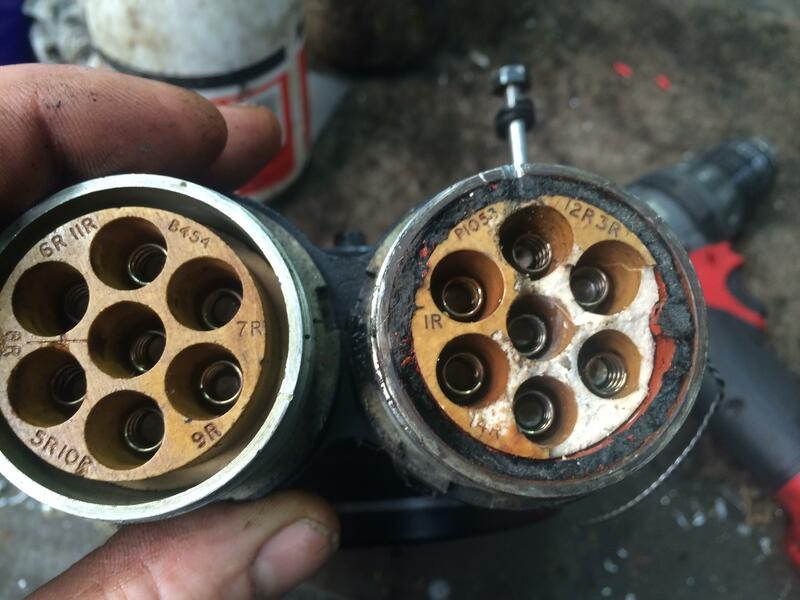 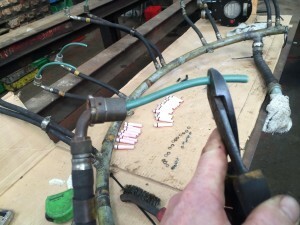 Next job was to weld back together the master rod, as this had to be cut to strip the engine as that cylinder would not come off. 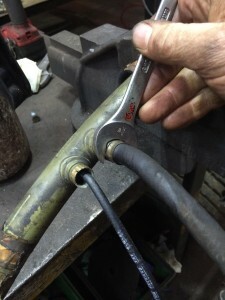 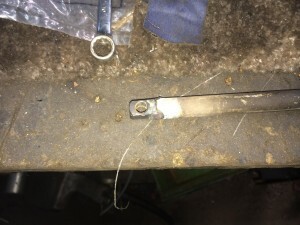 Next I cout down the front half of the crank manaton and make a replacement crank pin to allow the master rod to be attached. The last job was to make a cranking handle , it works a treat. 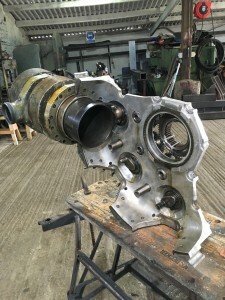 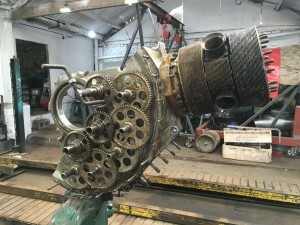 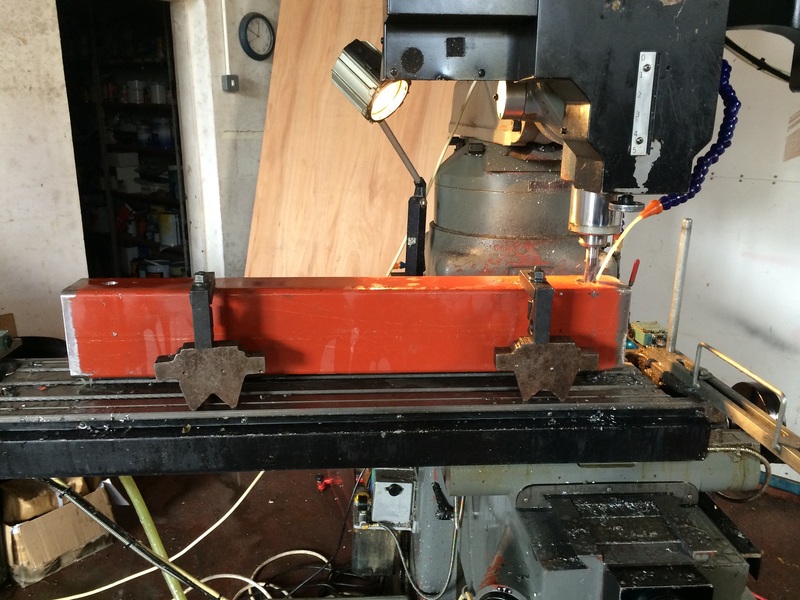 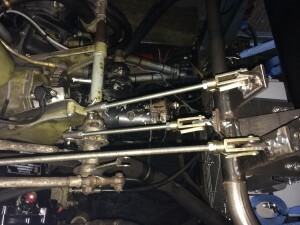 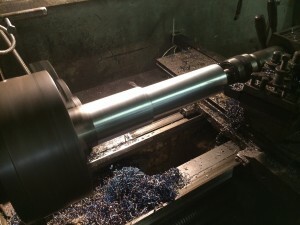 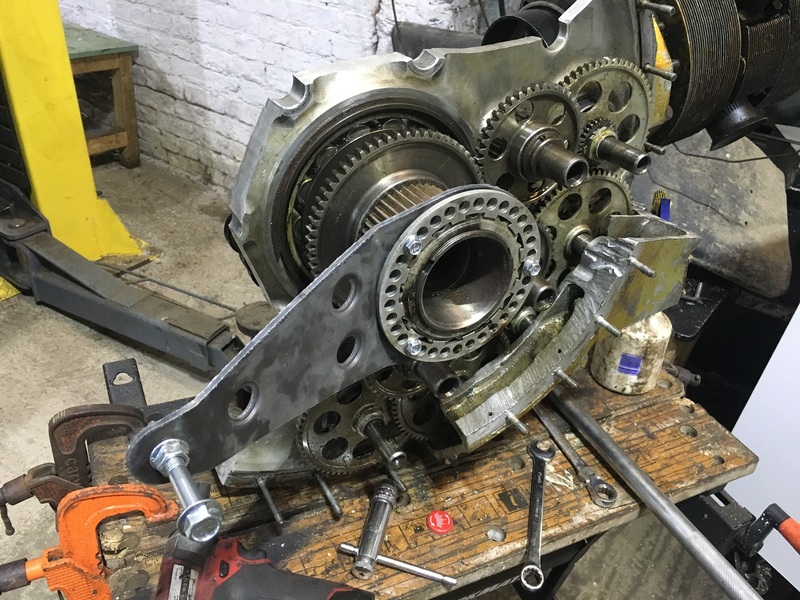 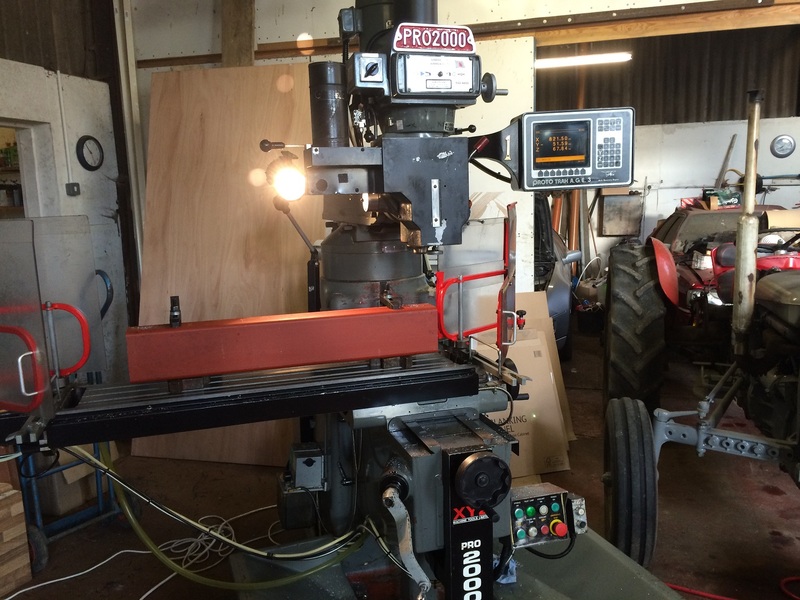 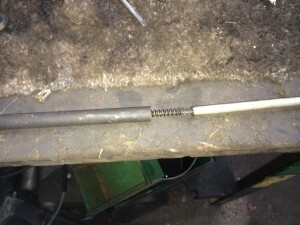 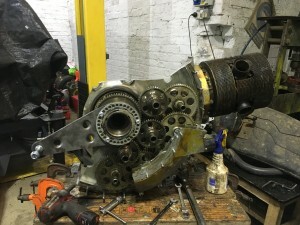 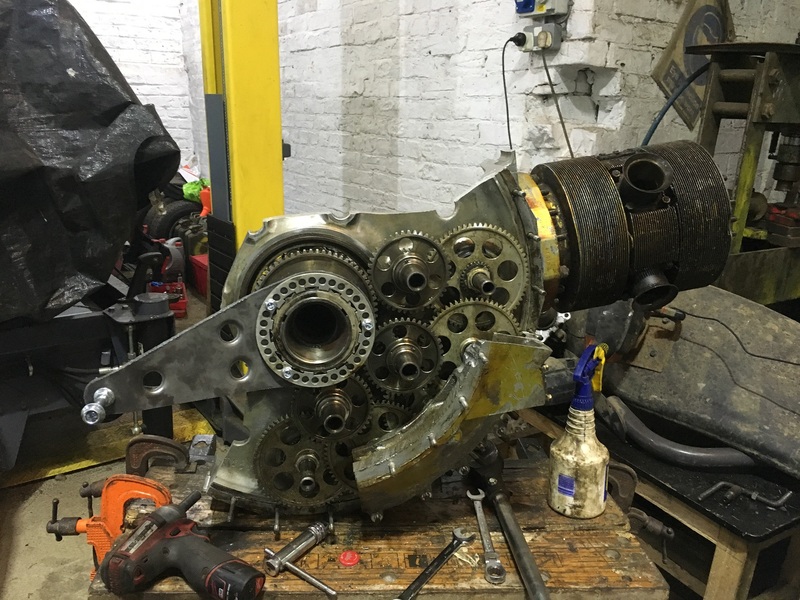 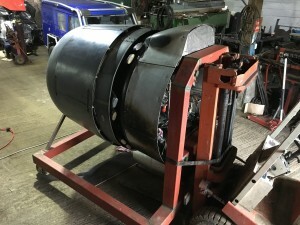 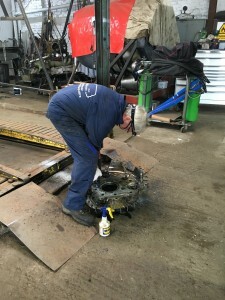 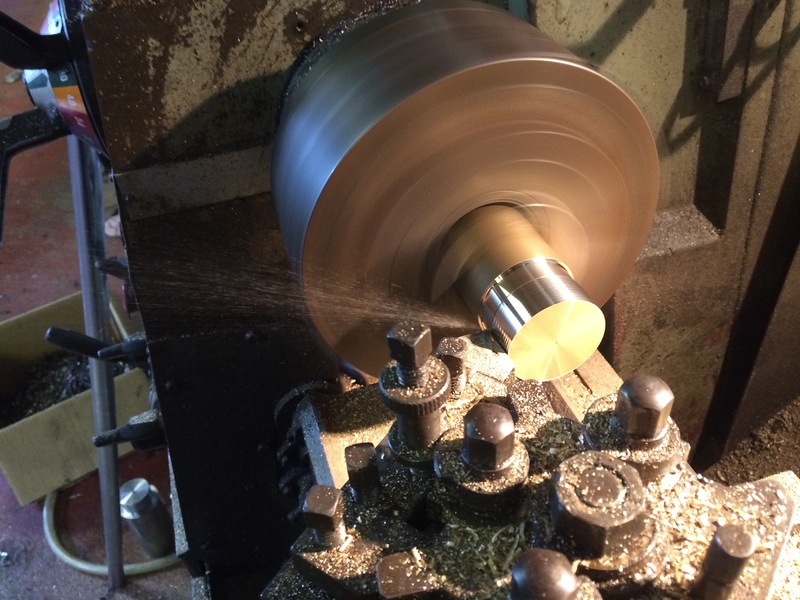 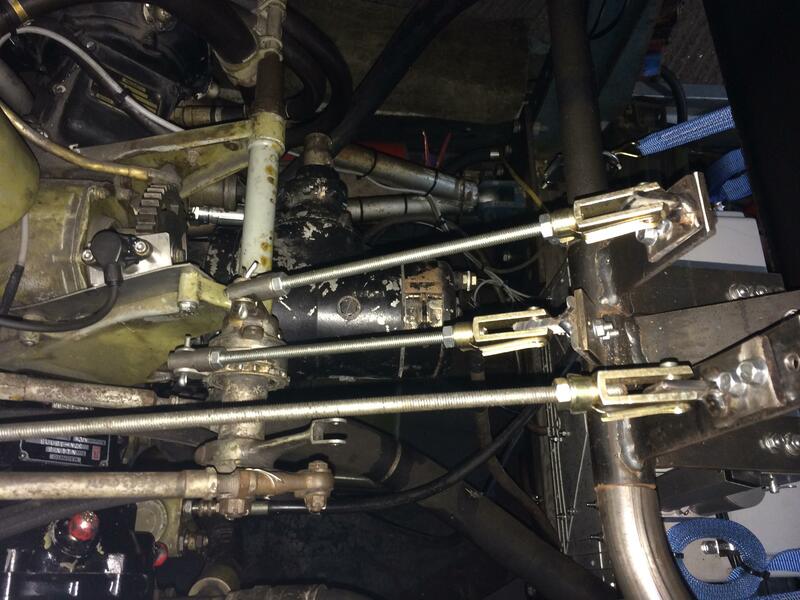 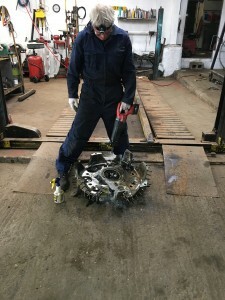 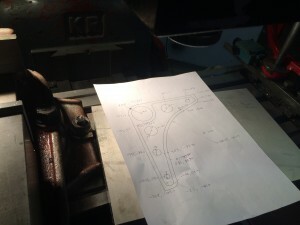 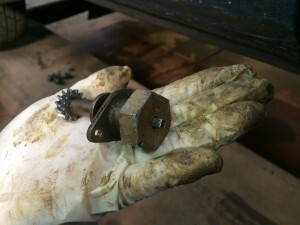 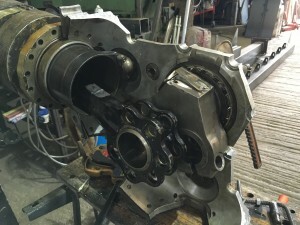 Over winter Pete will tidy the casing up and crankshaft on the milling machine, then all we have to do is make a perspex box to go over it , as there is plenty of finger trapping gears and sleeve valve ports etc. 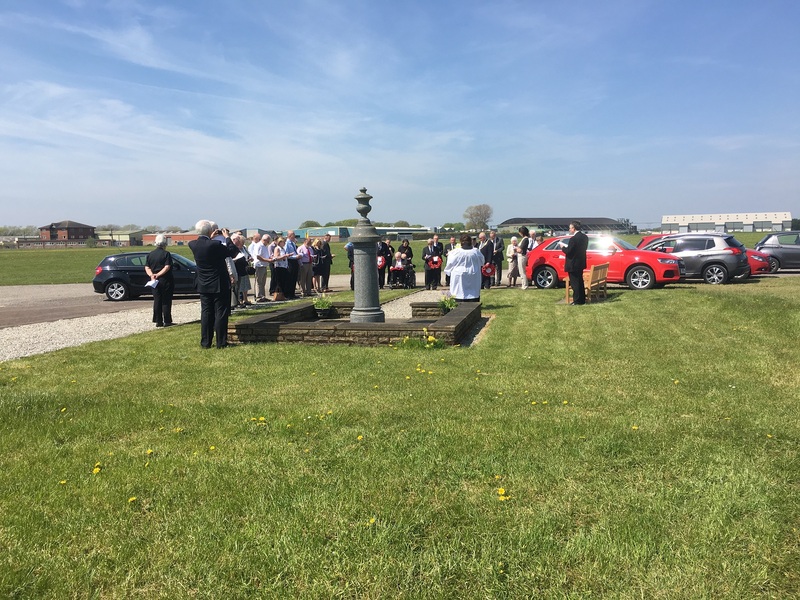 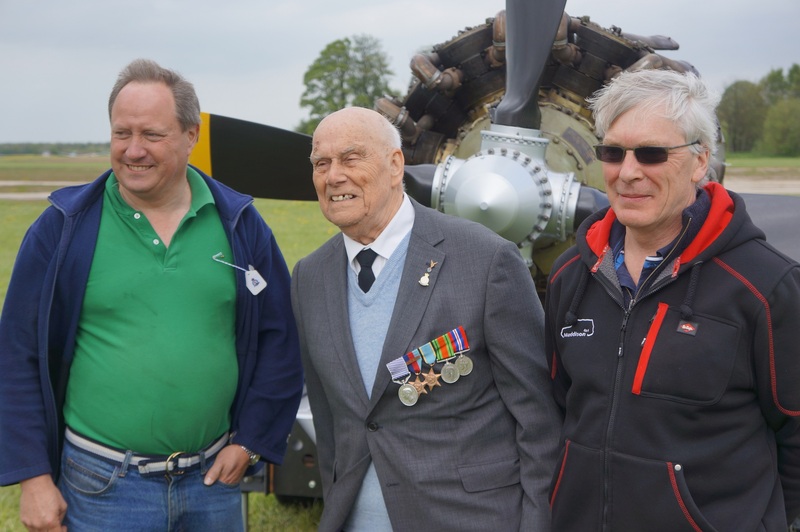 On the Sunday we invited an 93 year old Halifax Pilot of 102 squadron Tom Sawyer to start up our 216, we didn’t have to ask him twice! 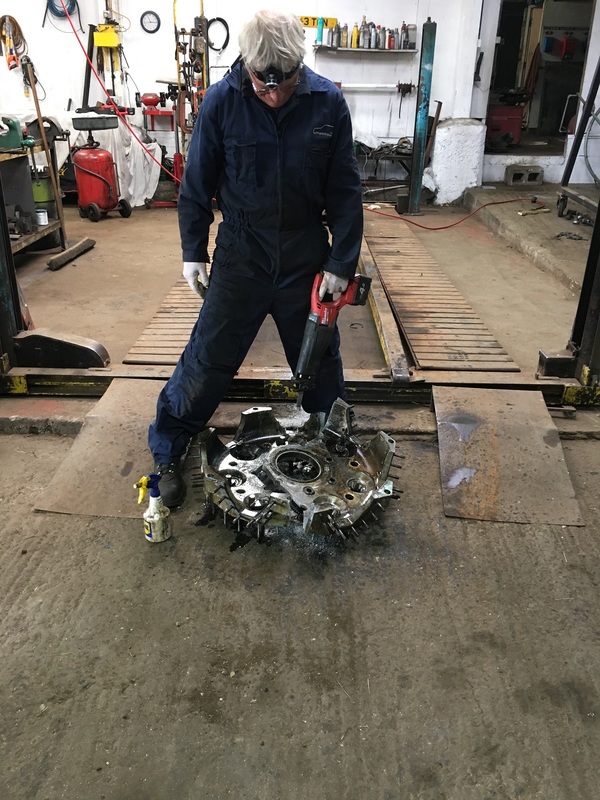 he was chuffed to bits. 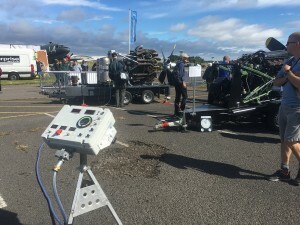 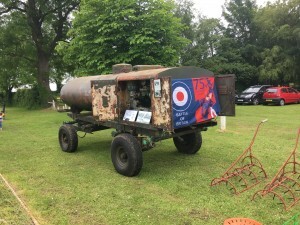 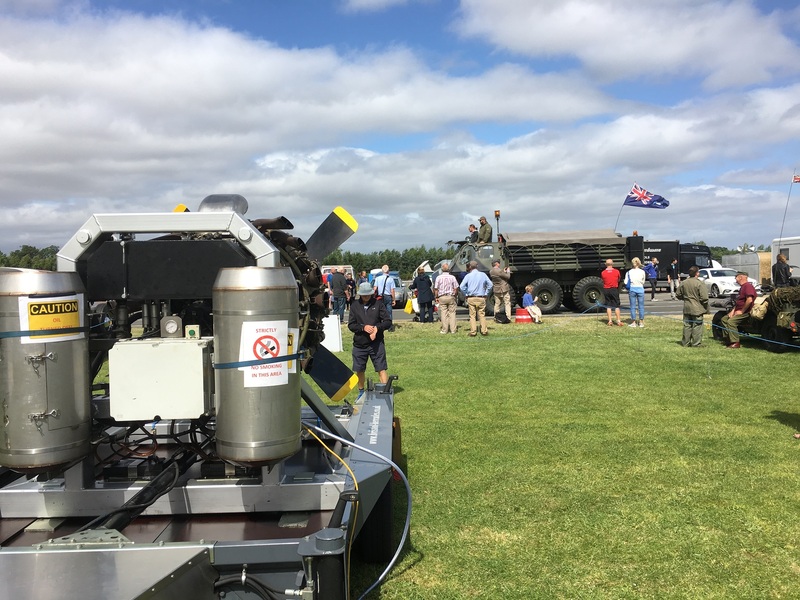 The next outing for us was at the Duxford Flying Legends 11th and 12th of July, before we went down we made a new tachometer from a Land Rover defender speedo. 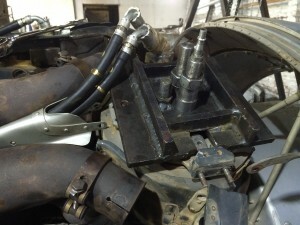 and a new air intake and fit some new guages. 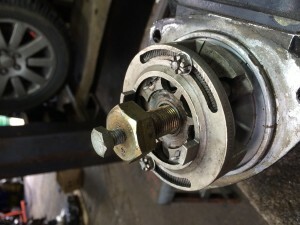 We modified the Land Rover speedometer drive spindle to fit the square drive on the Hercules, then made a brass bush to hold it in. 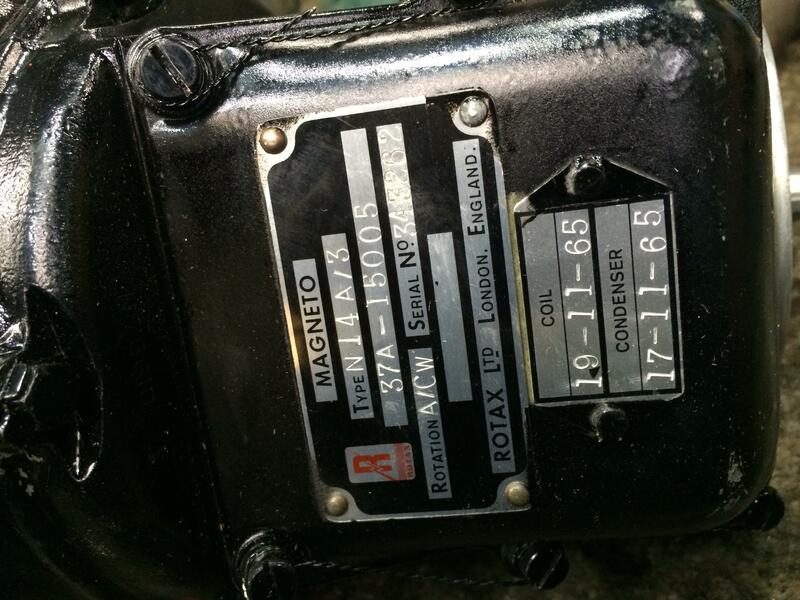 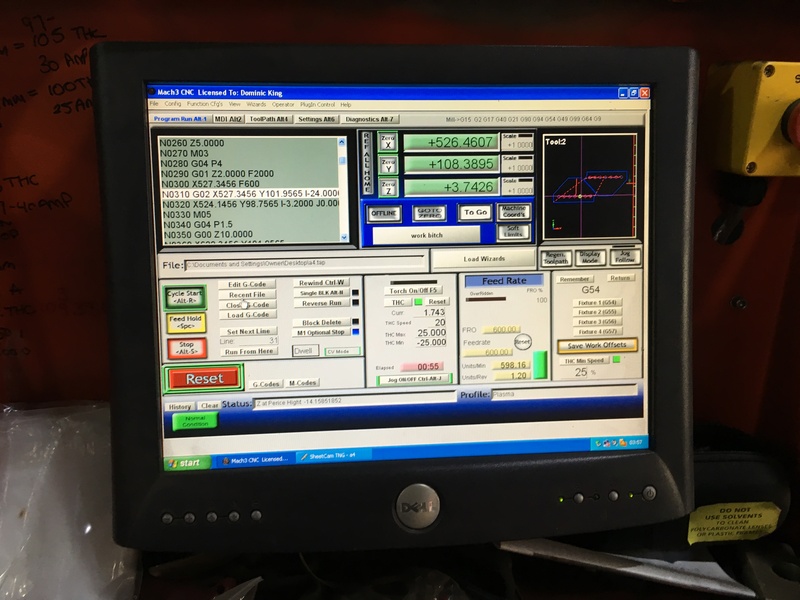 And here we have the finished article, the original tachometer drive altered to drive a Land Rover speed transducer which then drives a 80mm Land Rover Defender speedometer, we used a pulse multiplier bought from ebay to allow us to calibrate the speedometer. 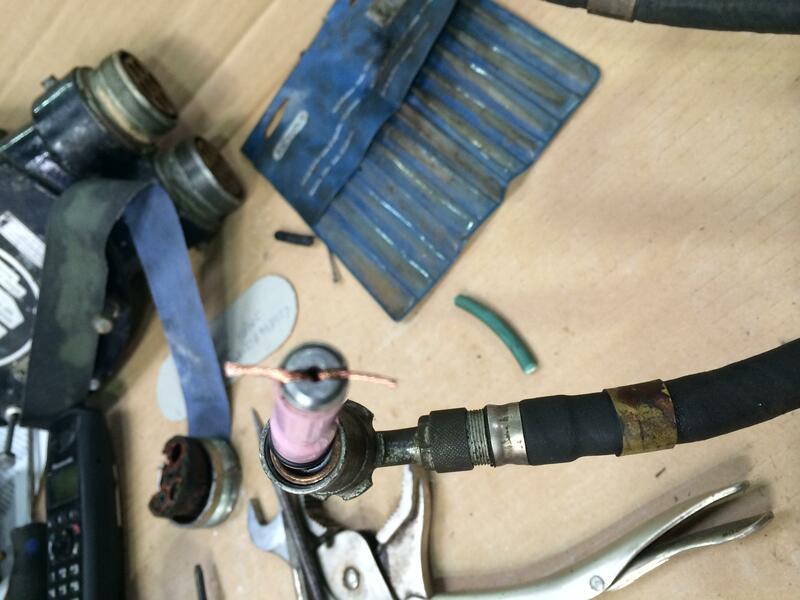 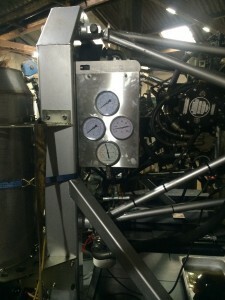 We used an old Snapon timing light to calibrate the tachometer. 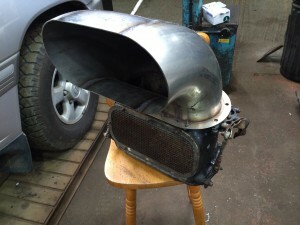 The next job was the air intake. 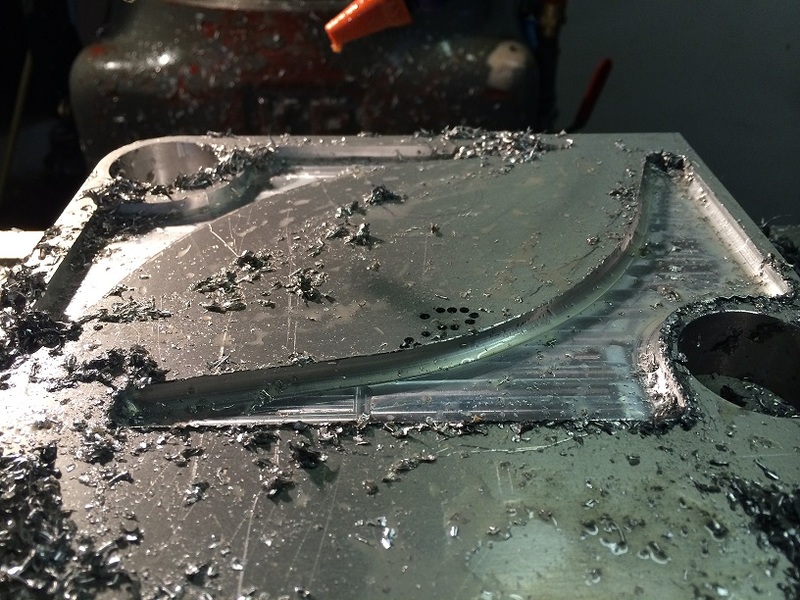 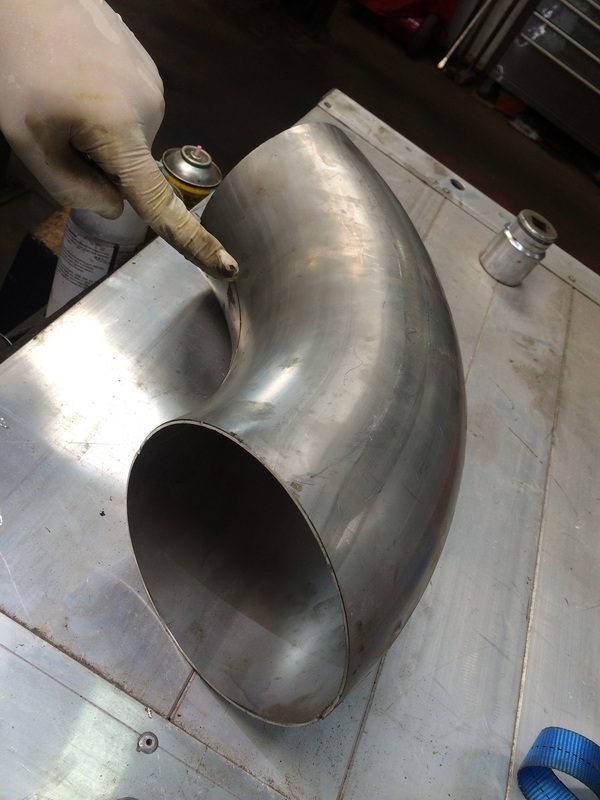 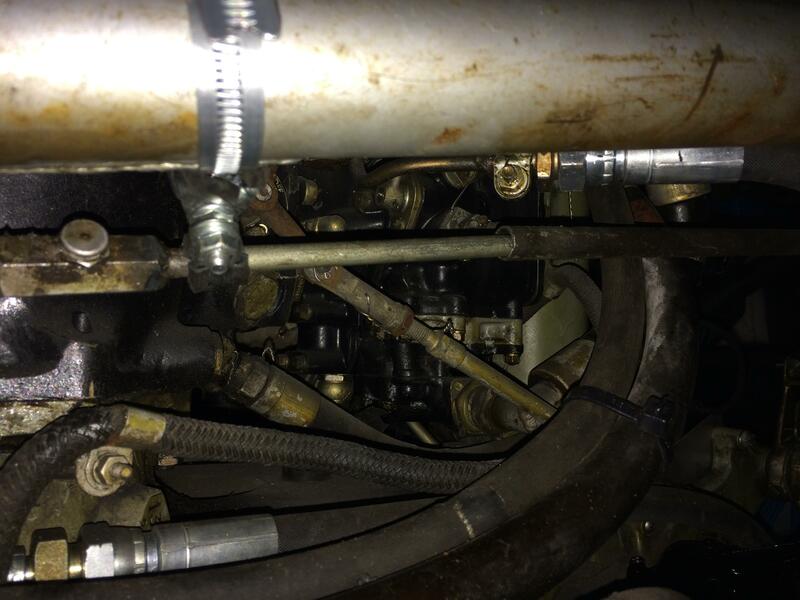 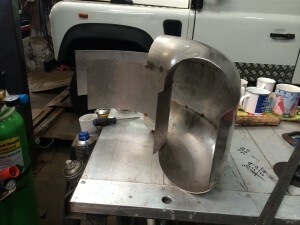 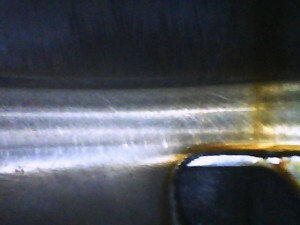 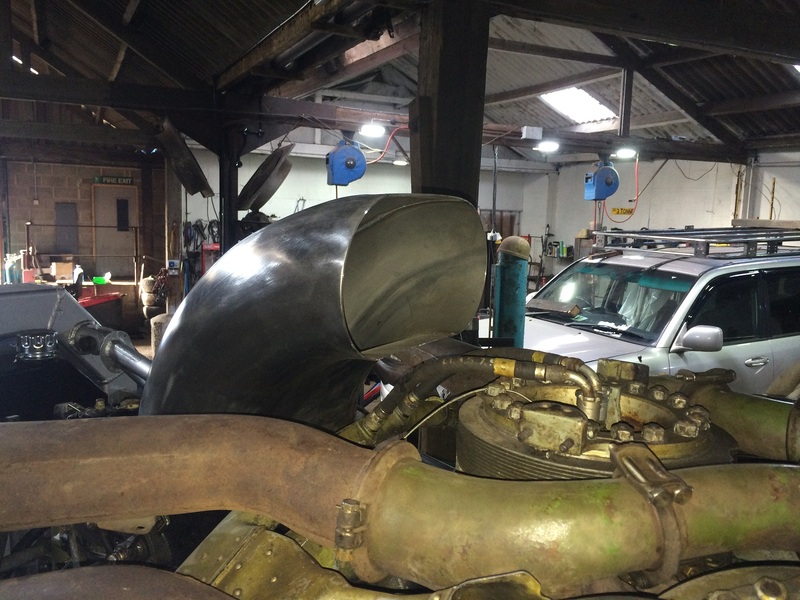 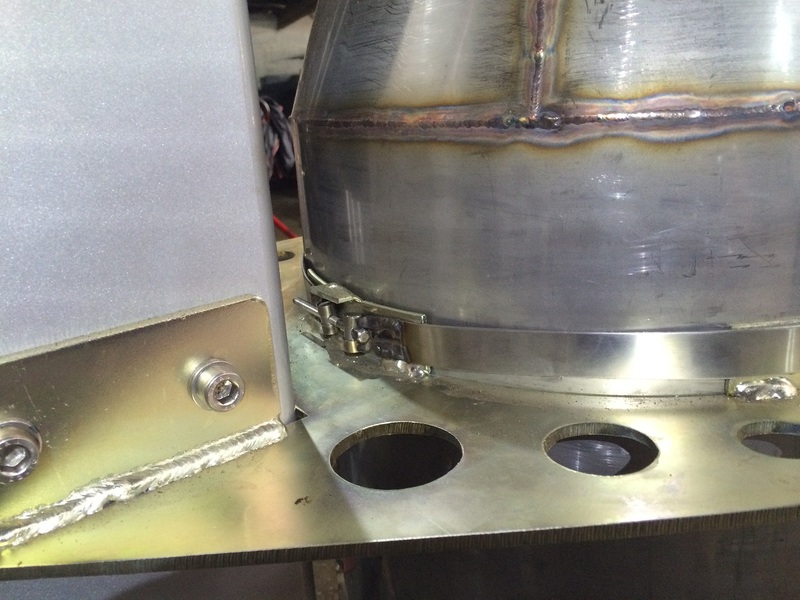 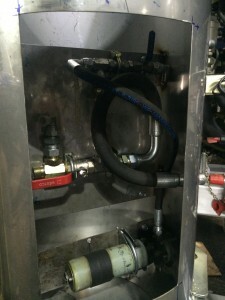 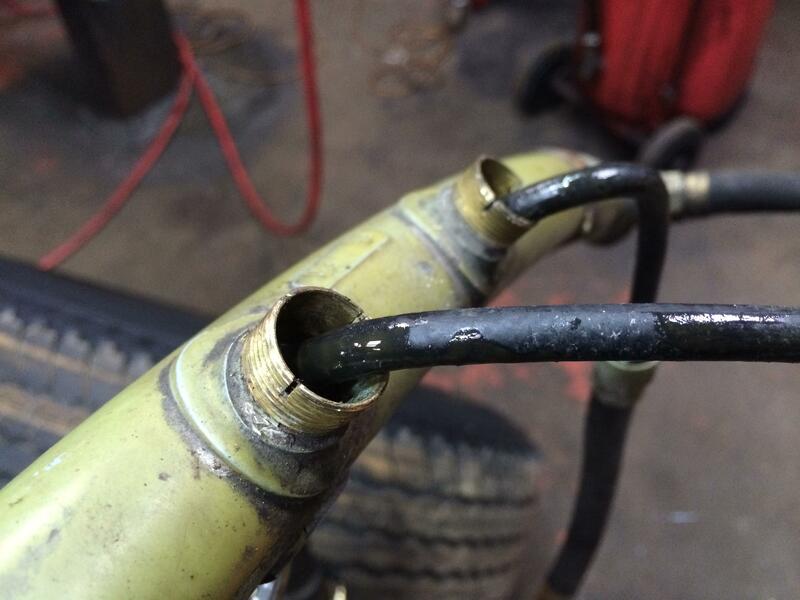 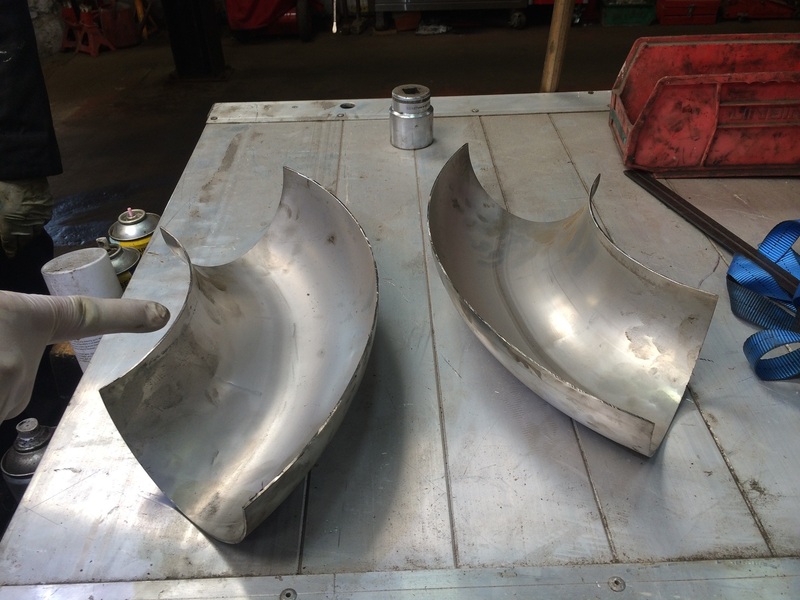 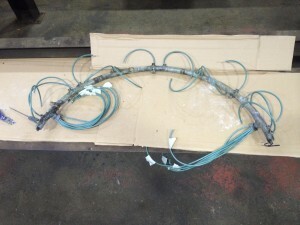 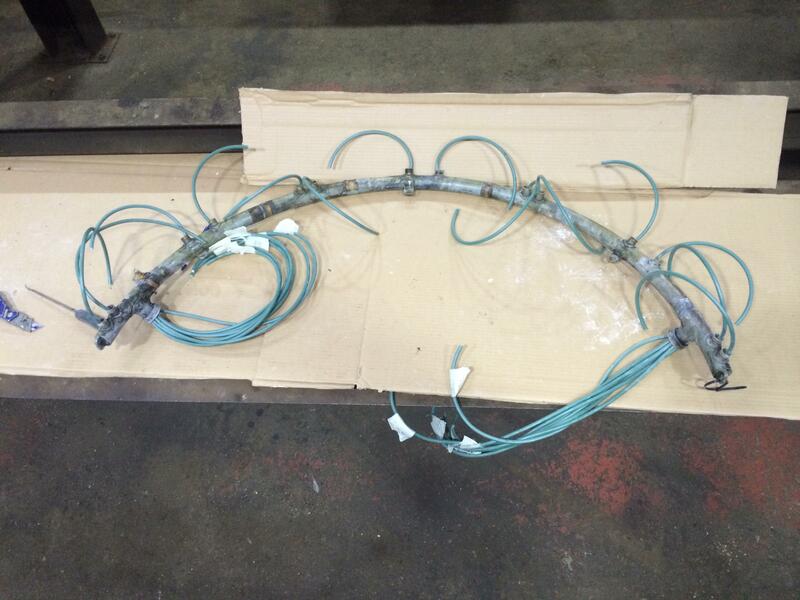 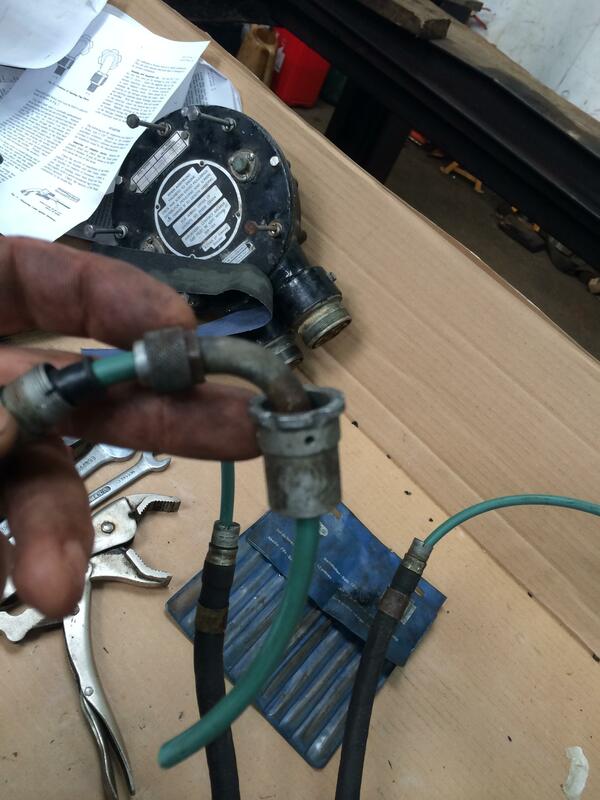 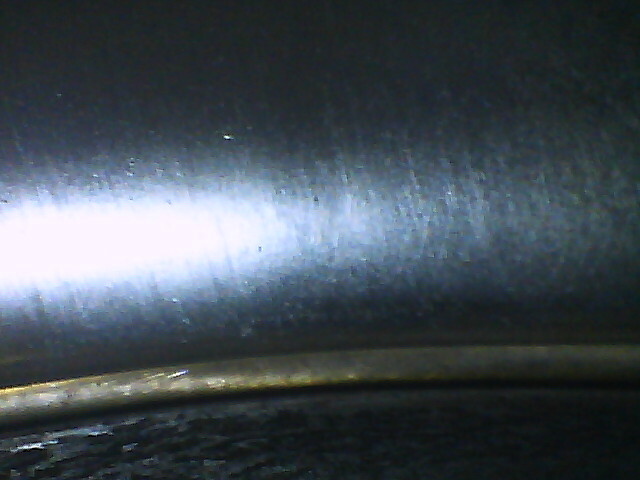 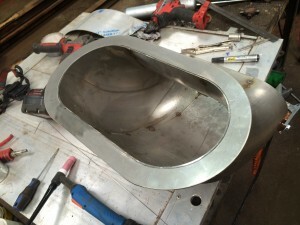 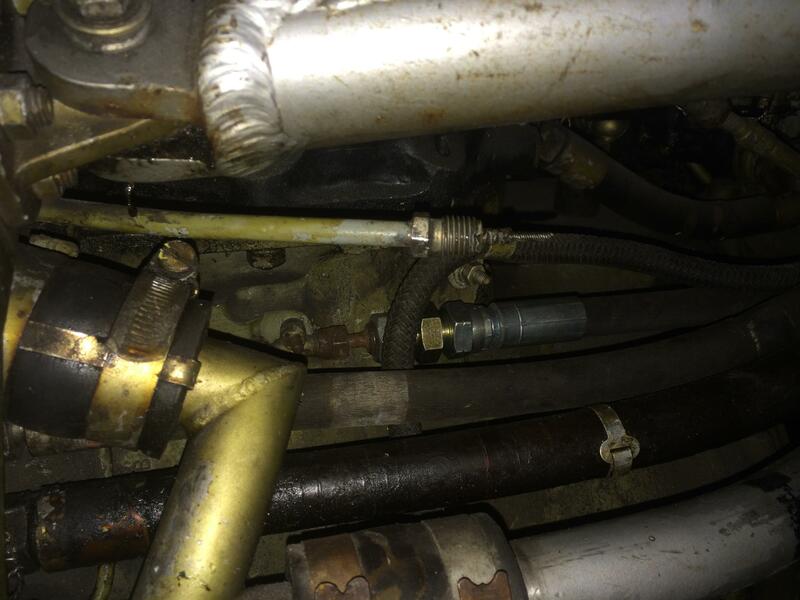 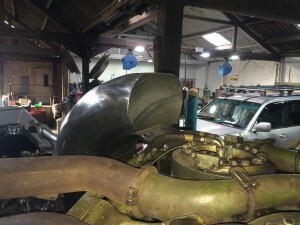 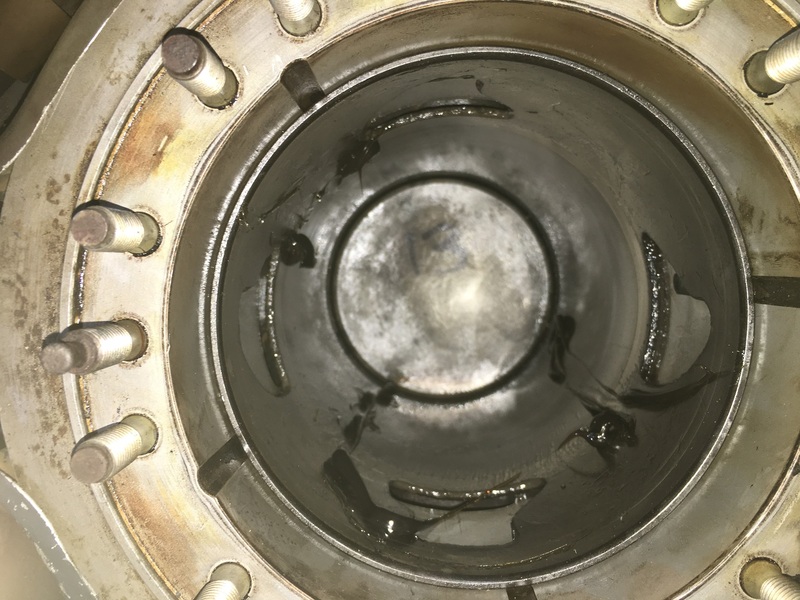 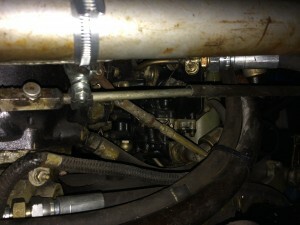 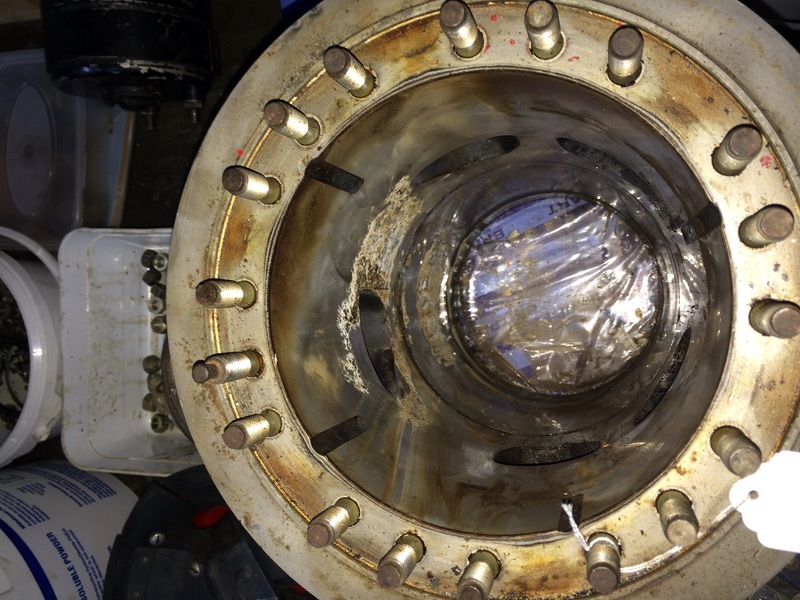 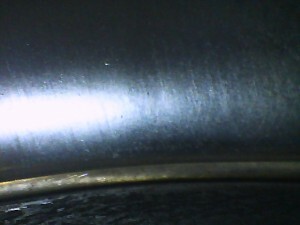 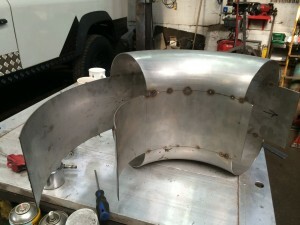 This was made from a stainless steel 6″ bend split in two then spaced out to suite the intake. 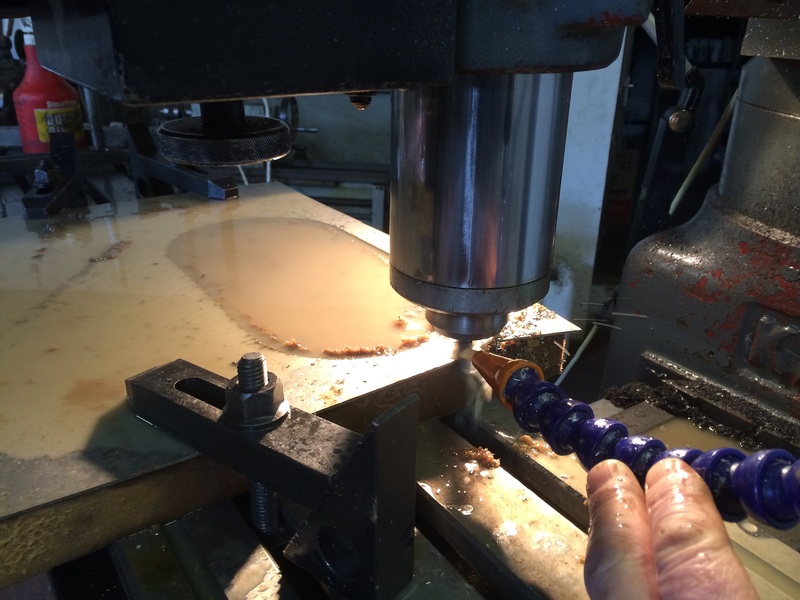 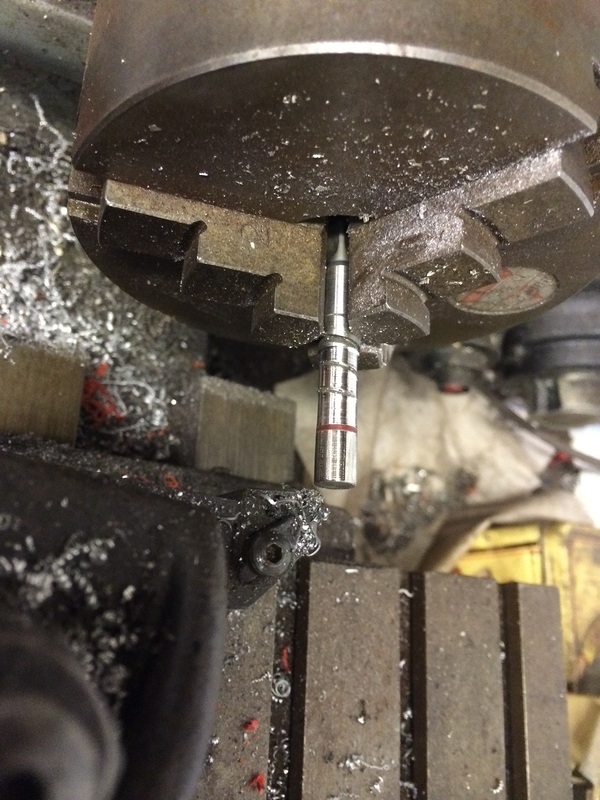 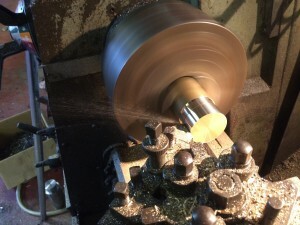 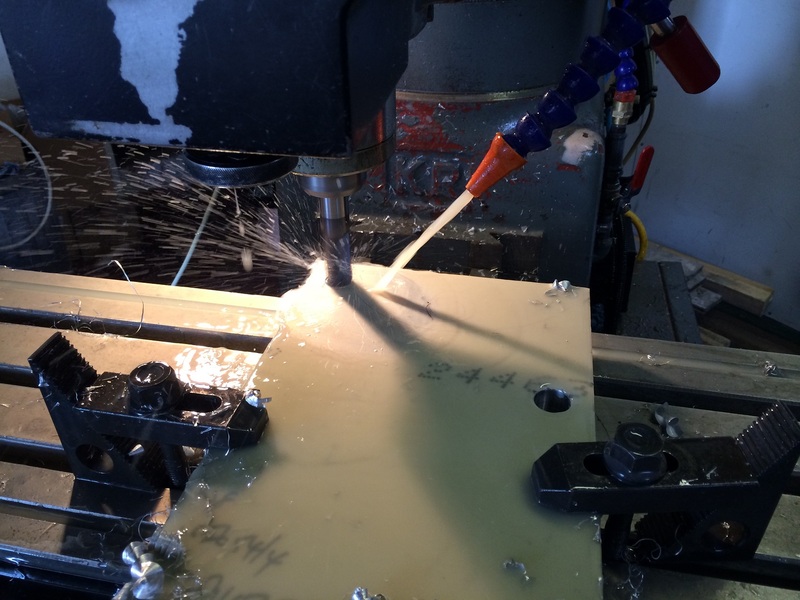 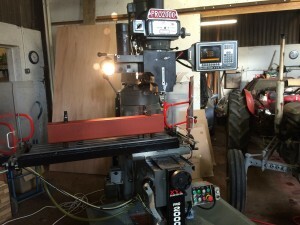 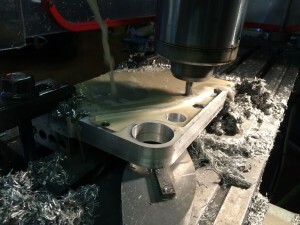 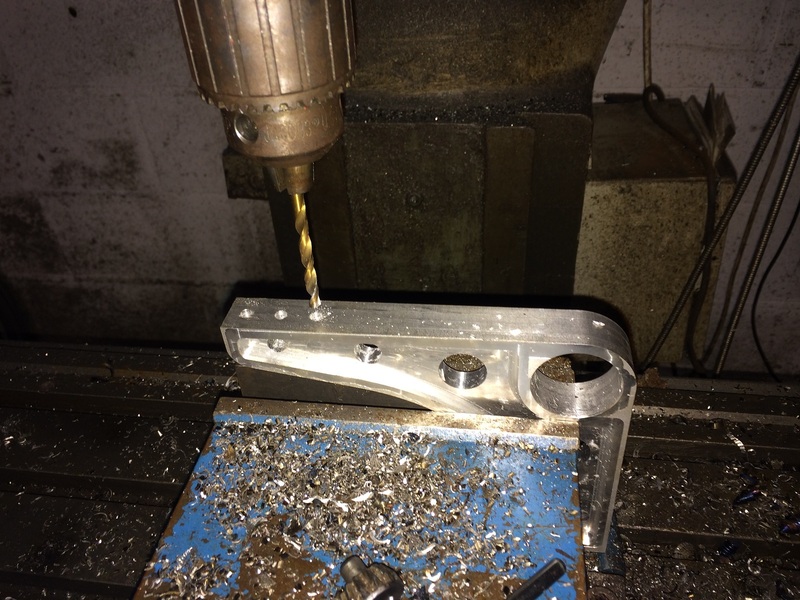 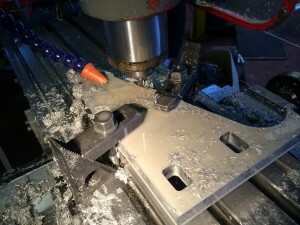 Pete made up a flange on the milling machine to fit the engine. 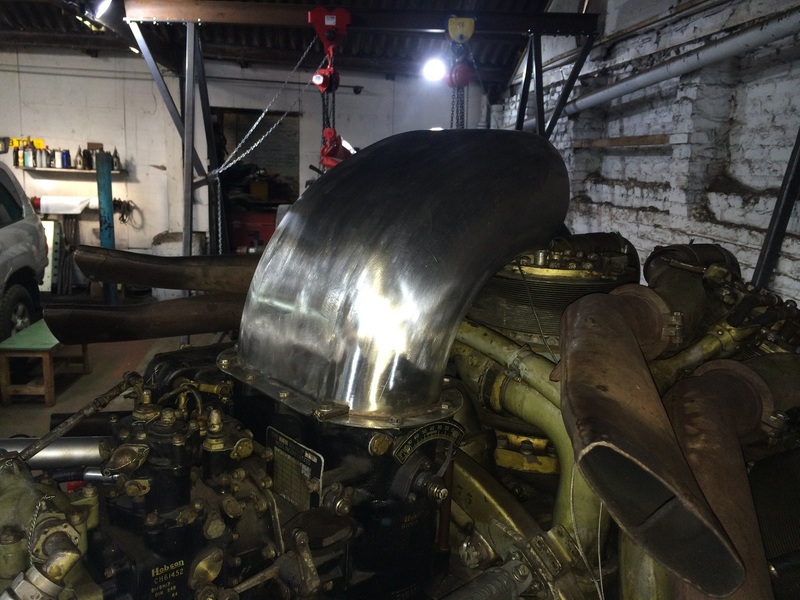 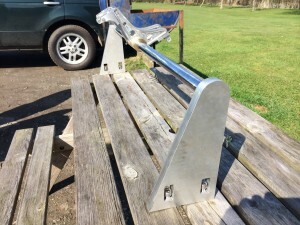 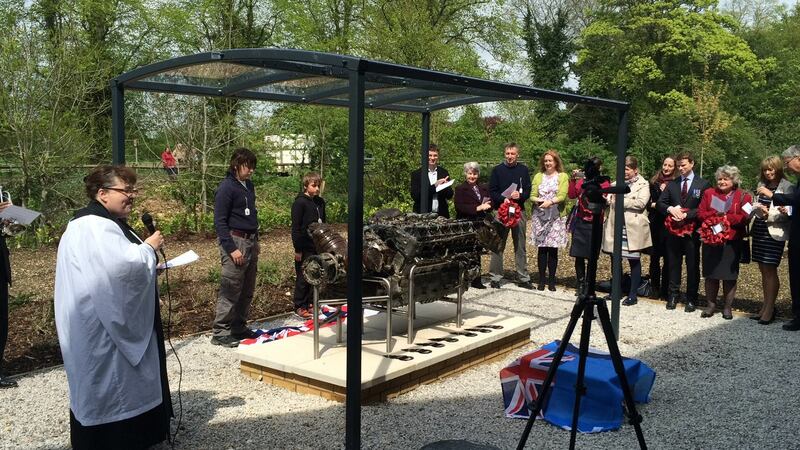 Once welded up and polished , it certainly looks the part. 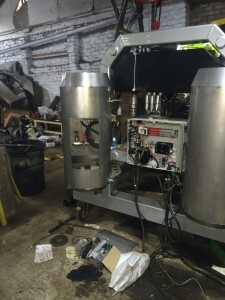 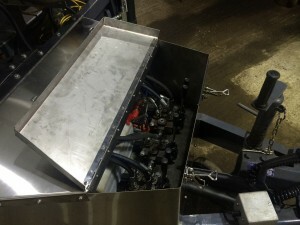 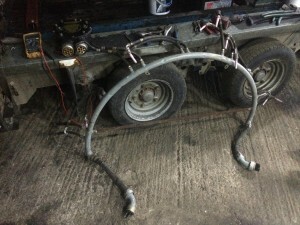 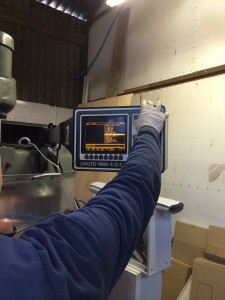 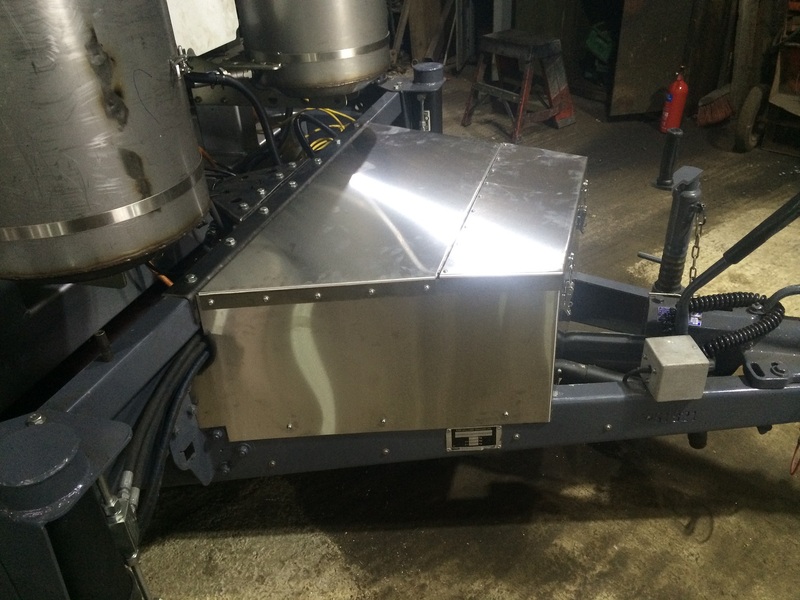 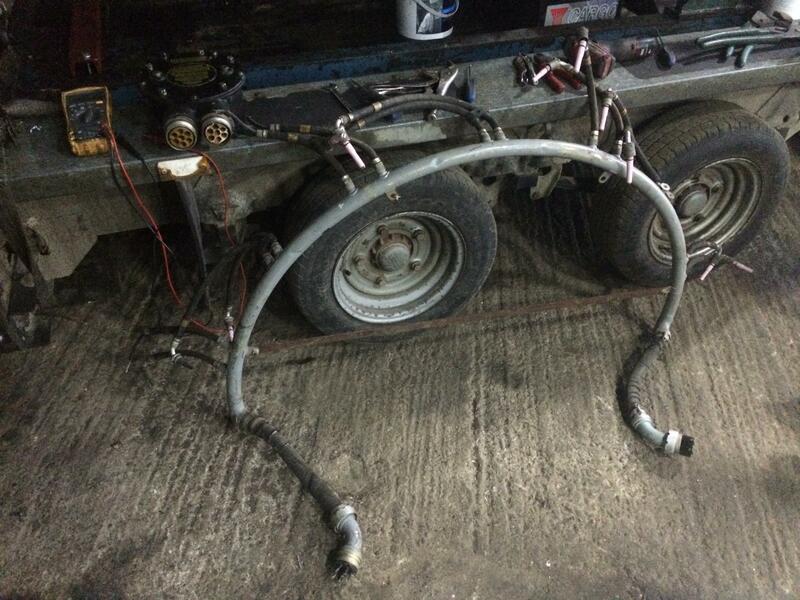 We then fitted some new Gauges and a new cover over the hydraulic controls for the trailer . 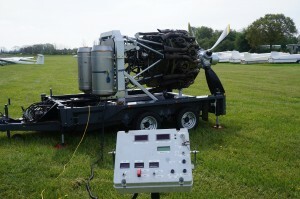 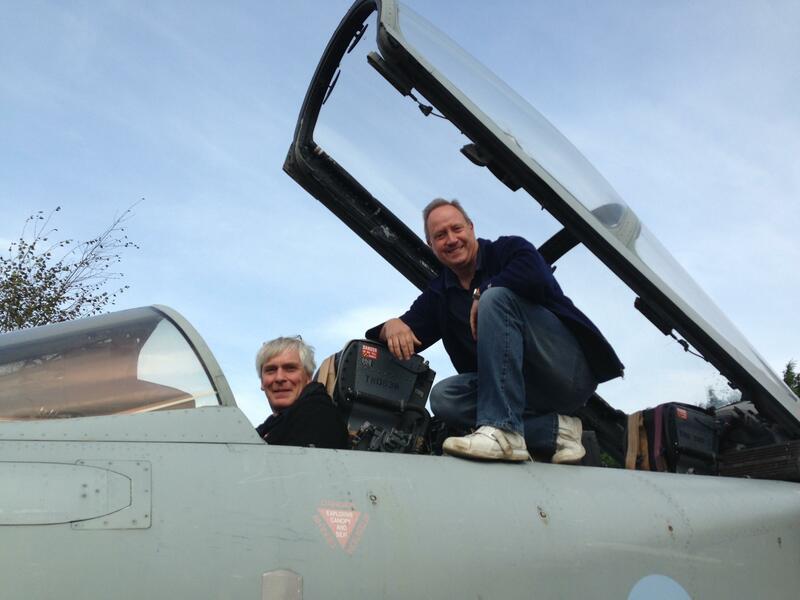 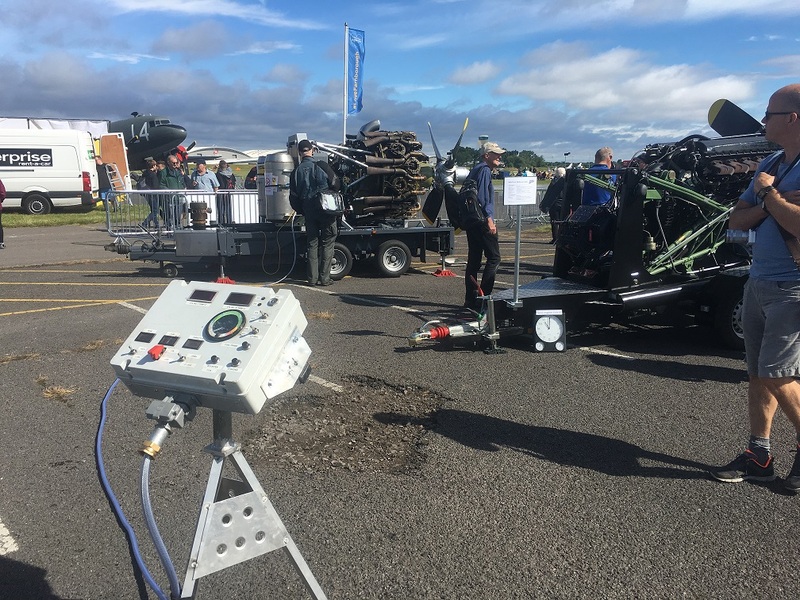 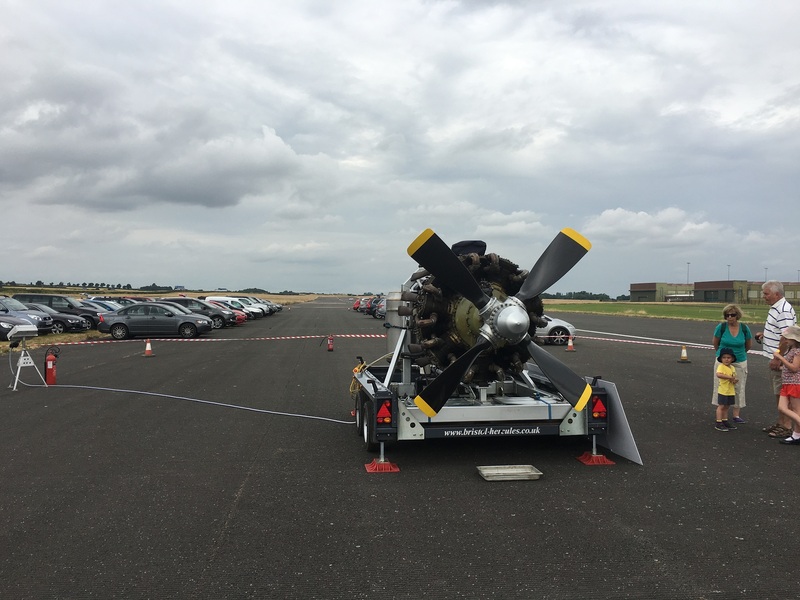 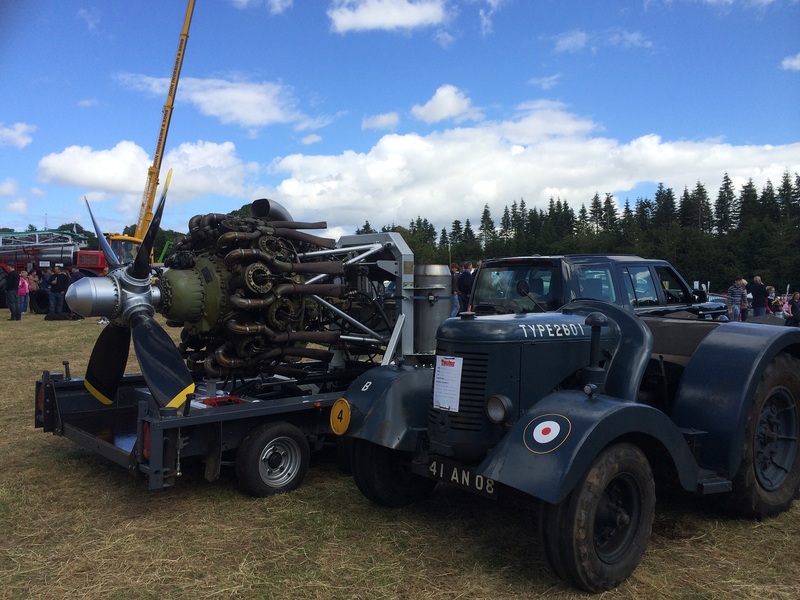 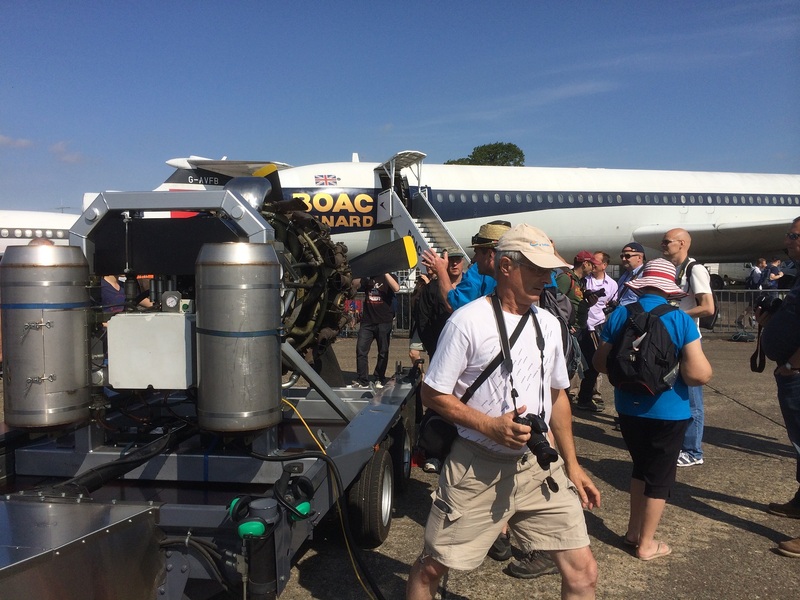 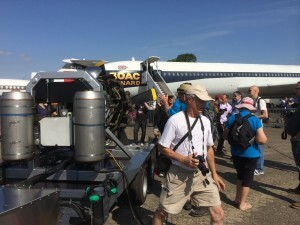 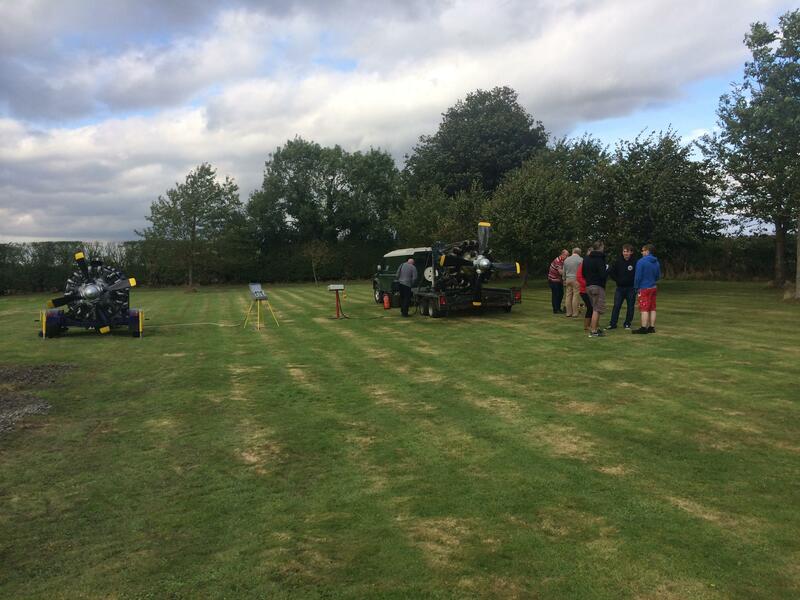 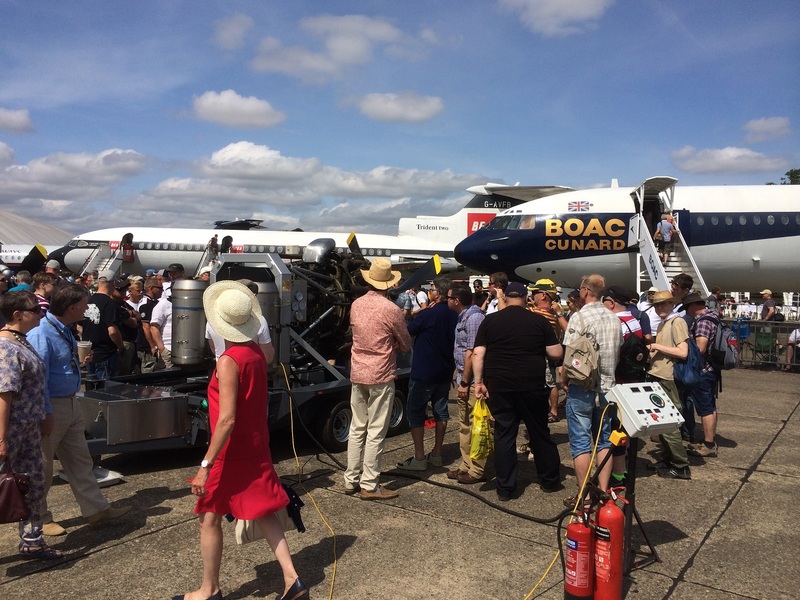 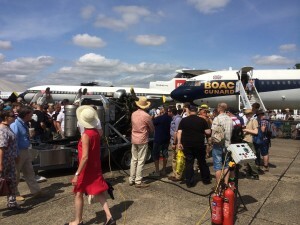 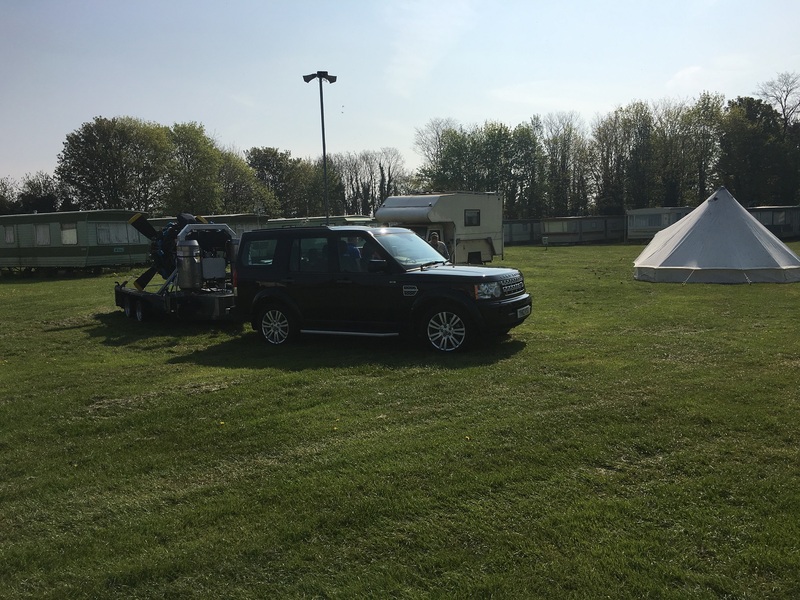 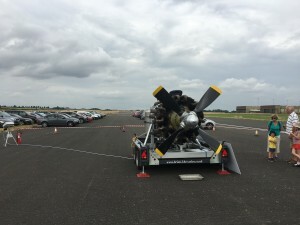 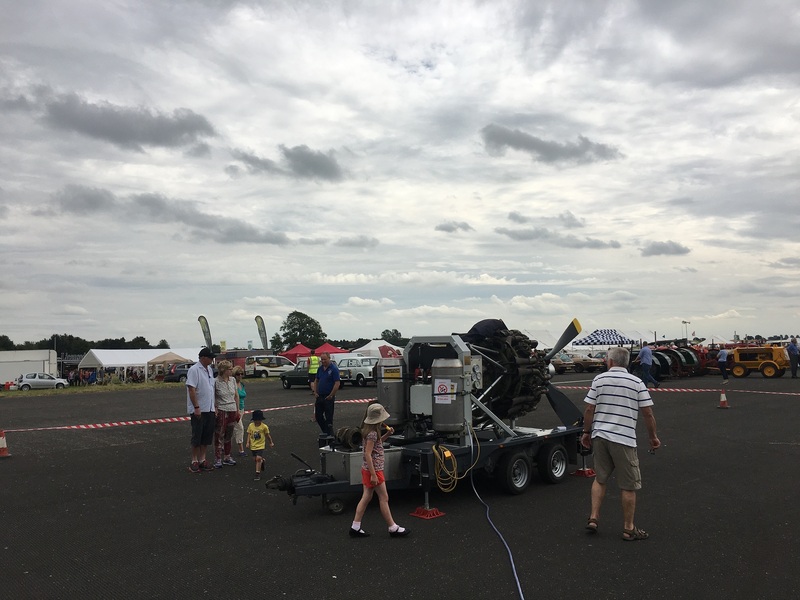 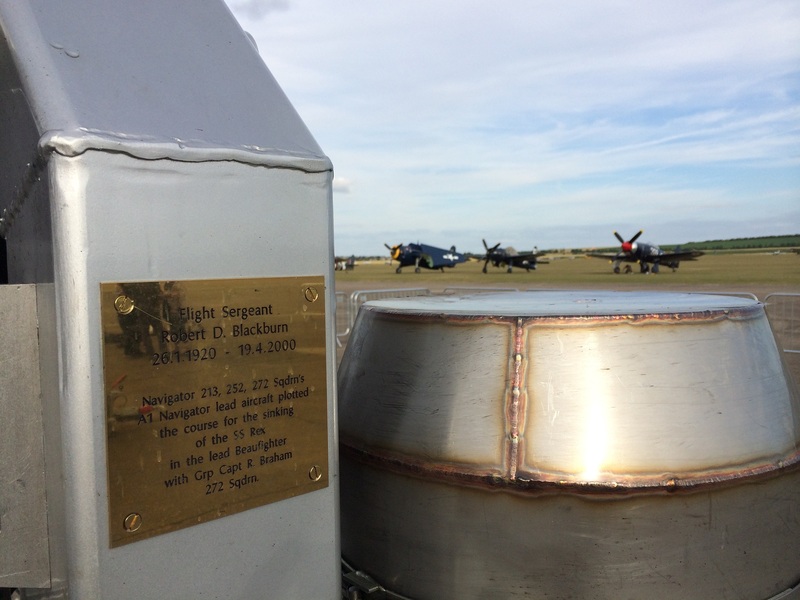 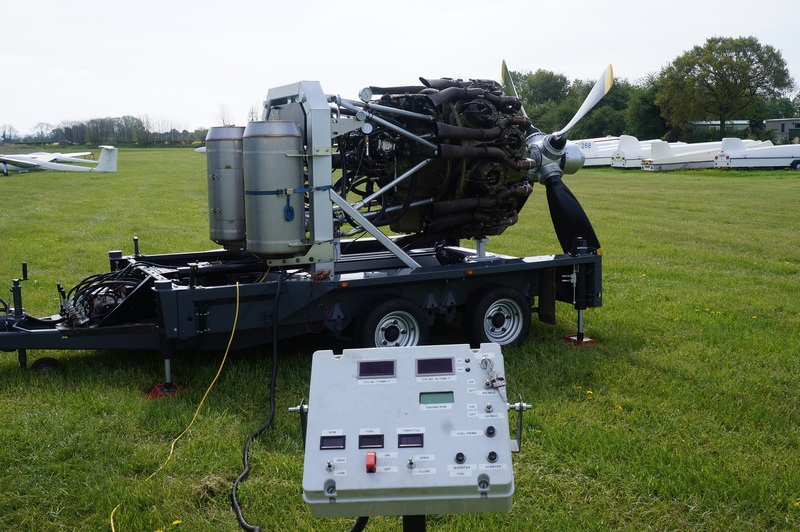 We had a great weekend down at the Duxford flying legends where we got through a lot of Av-Gas! 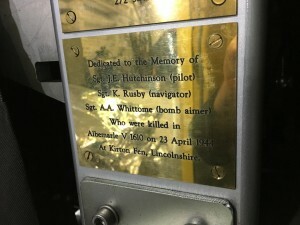 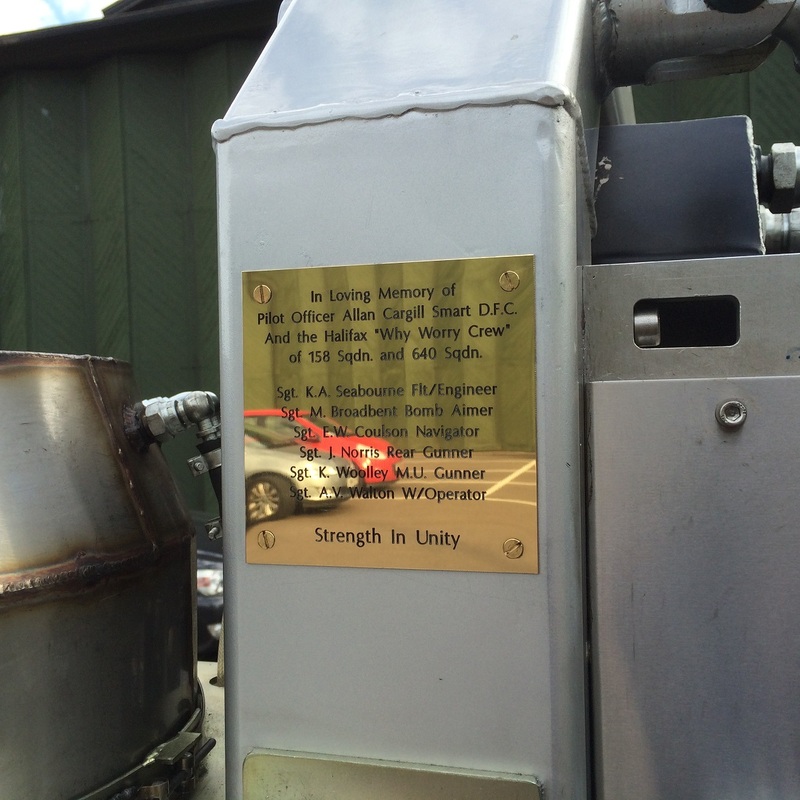 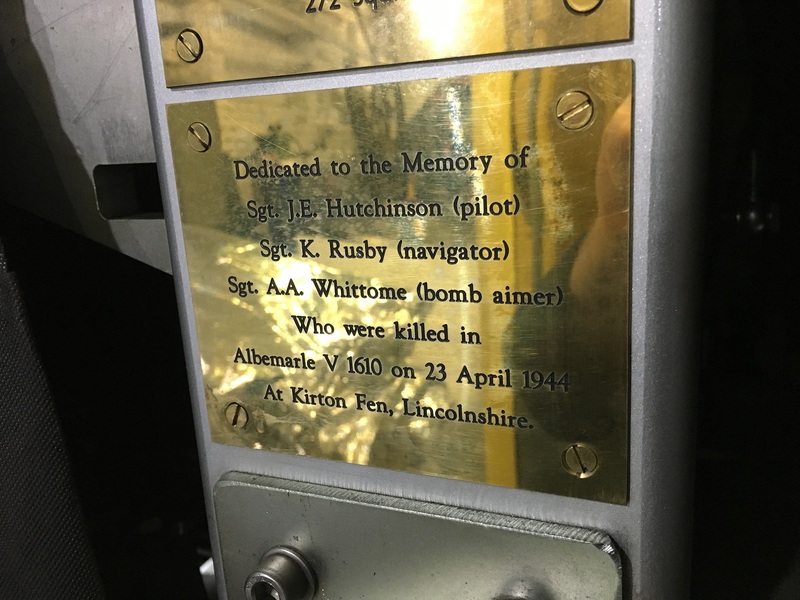 Before we went down we fitted a couple of brass plaques, One for my Dads crew and the other for Peter Blackburn’s Dad. We ran the engine every 45 mins during Saturday and Sunday up to 13:00 just before the Air Show starts, It certainly drew a lot of attention. After Duxford our next show was a local three day family music festival called the DeerShed Festival only two miles away. Last year we took the 216 just to show it as a static display, and the amount of people that asked us when we were going to start it! 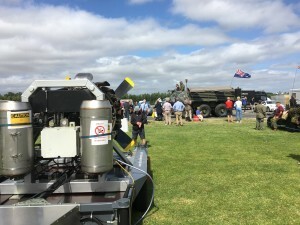 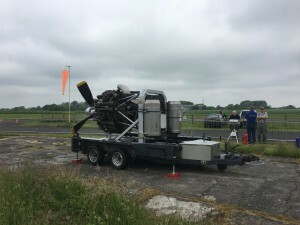 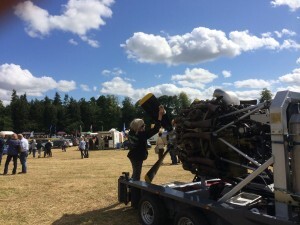 so this year we were invited back to run the engine and it was great success. 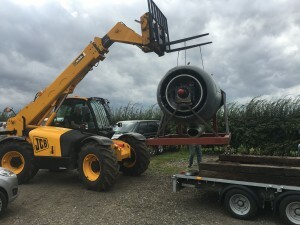 We decided before the DeerShed festival that we would take the 759 with us also, so this meant getting it out of the pod and mounted on a frame! 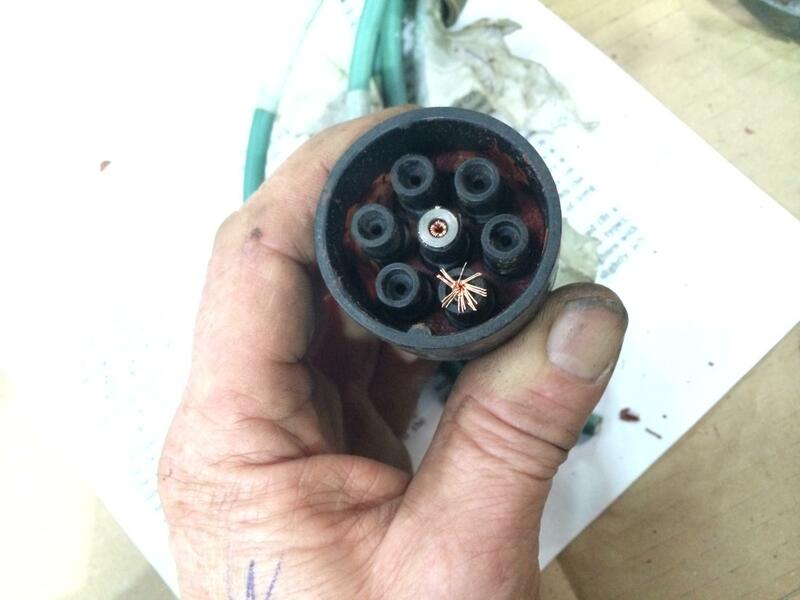 nothing like a bit of pressure, we only had two weeks to do this! 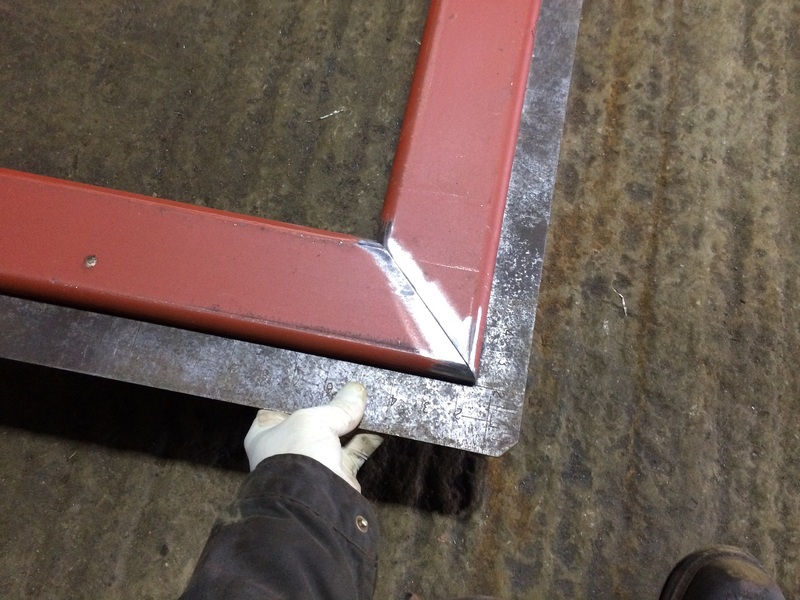 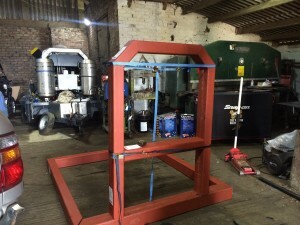 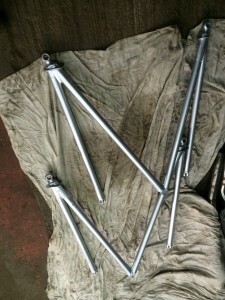 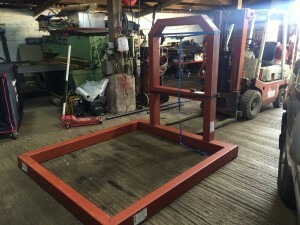 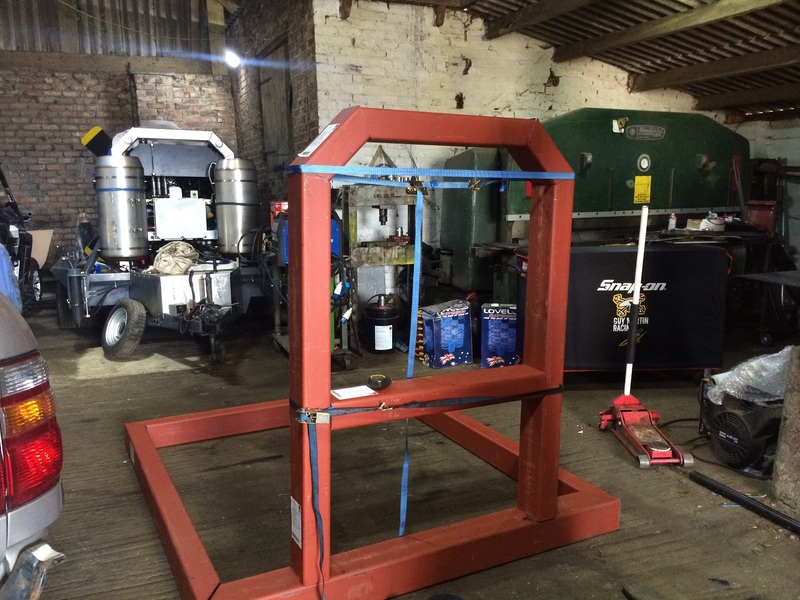 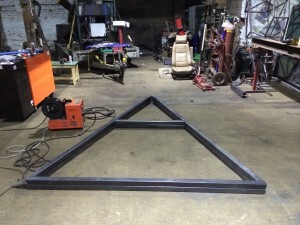 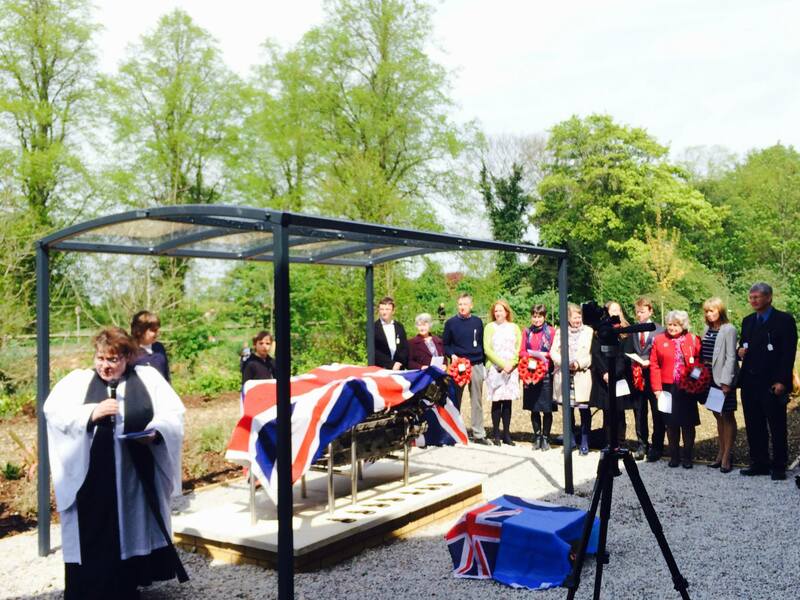 The first job was to make another frame. 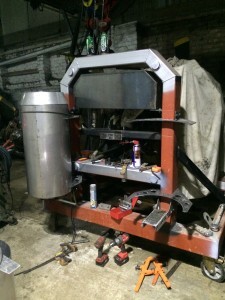 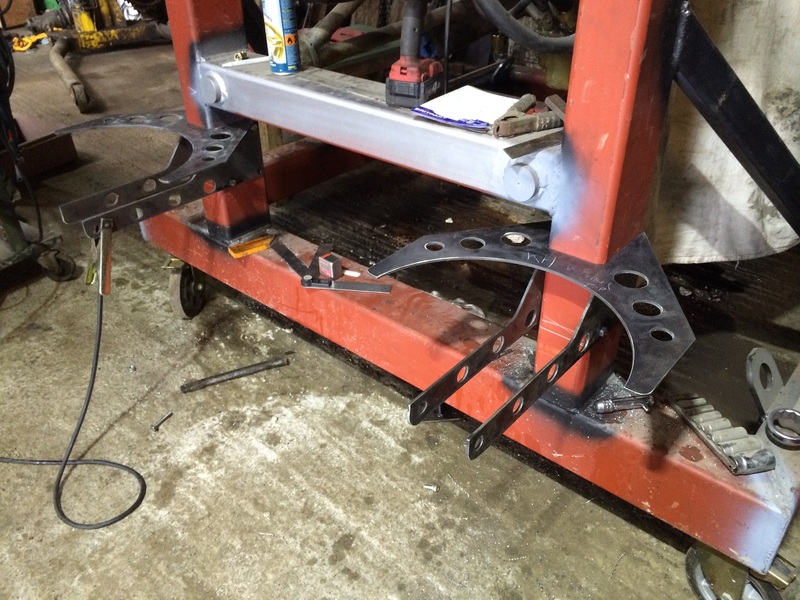 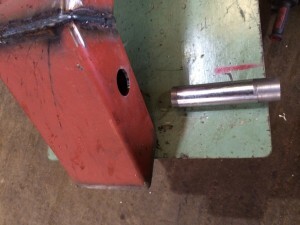 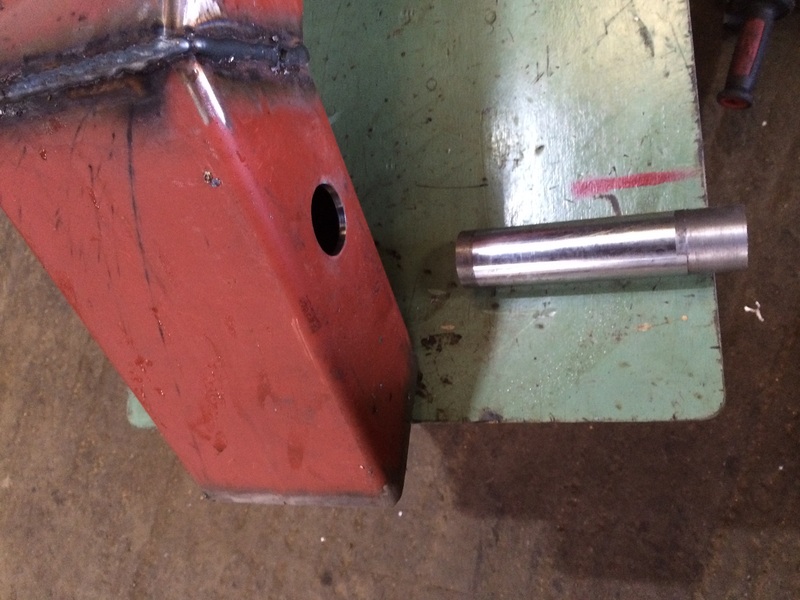 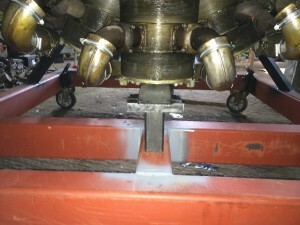 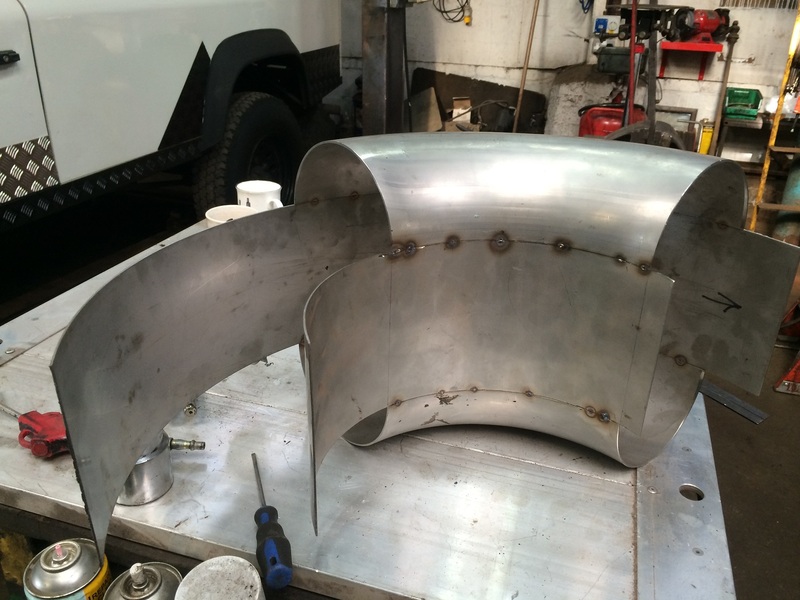 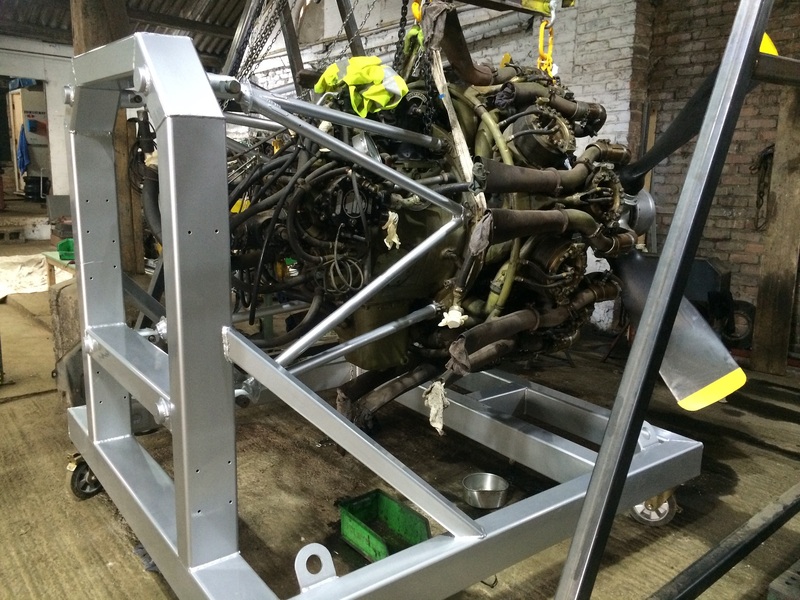 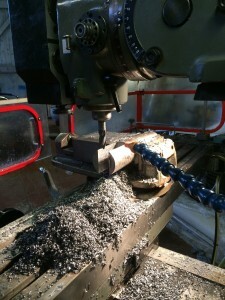 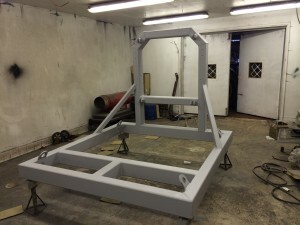 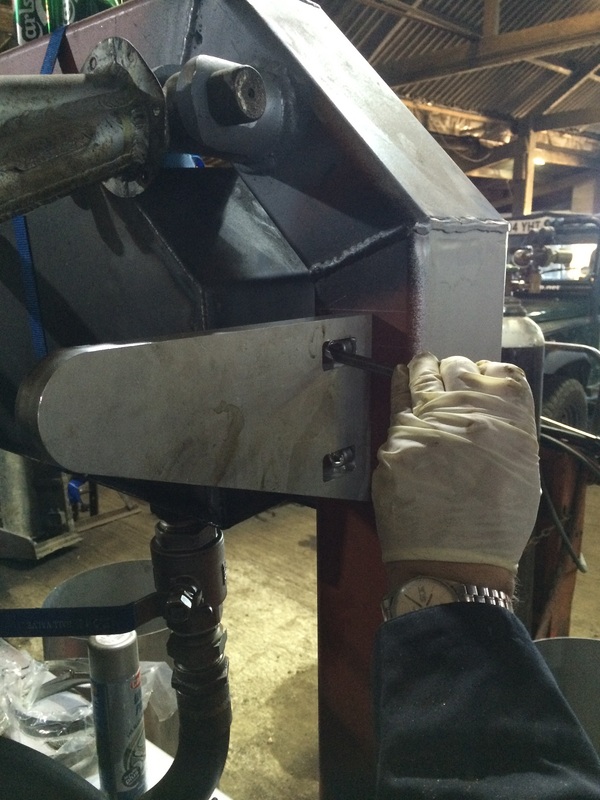 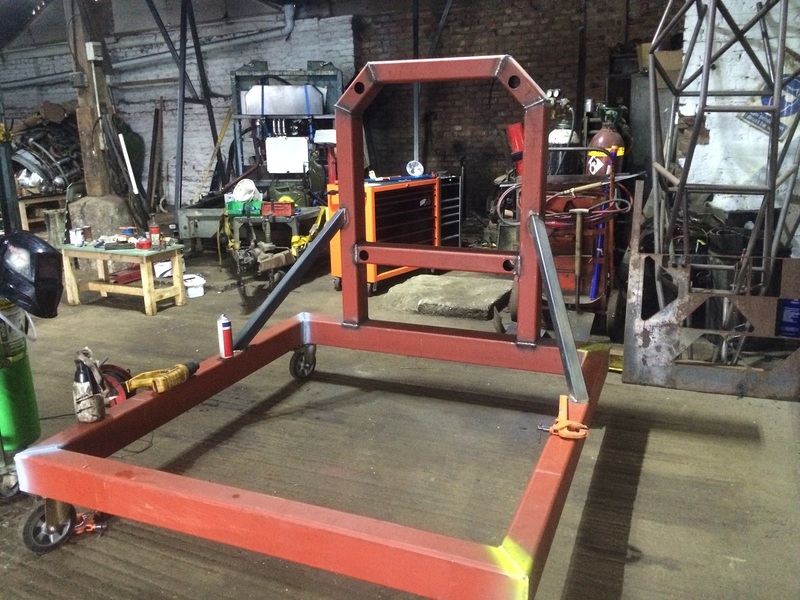 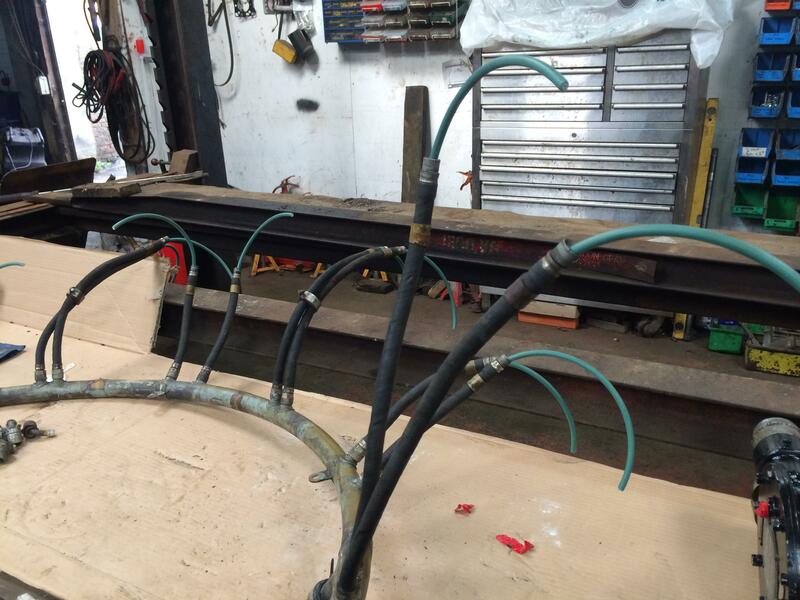 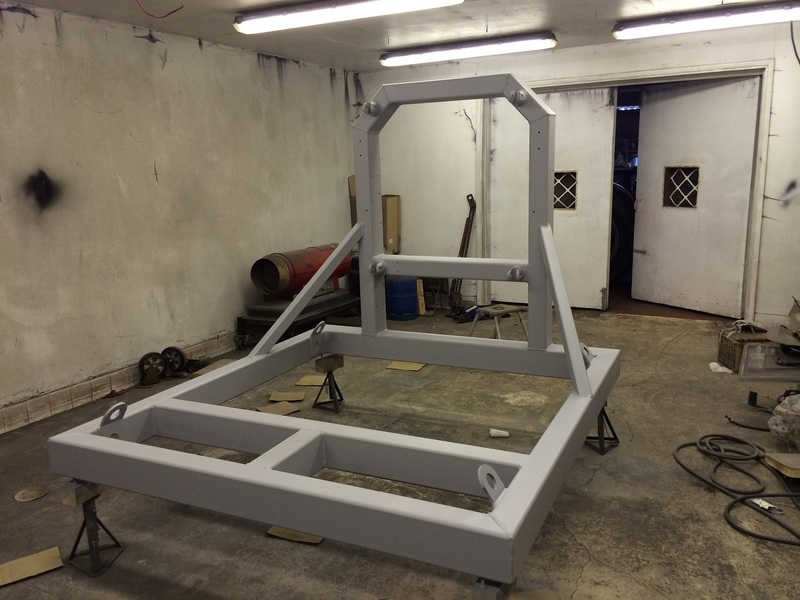 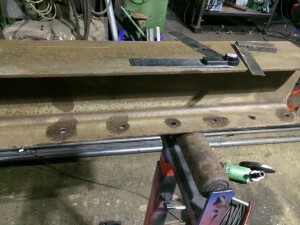 After a dry fit of the steel work, Pete milled in the mounting holes for the engine mounts. 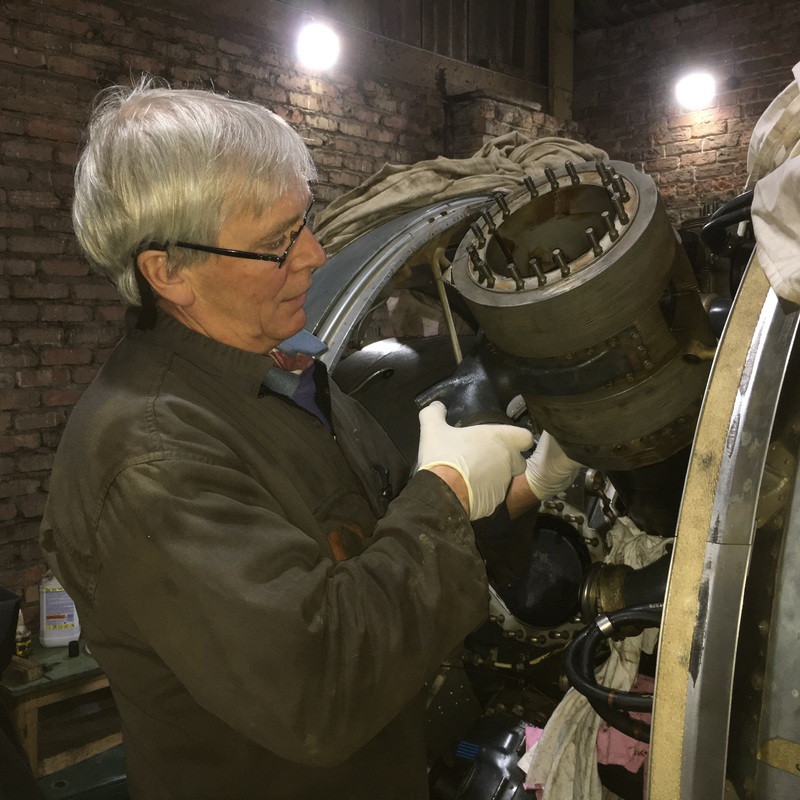 The first time the 759 has seen daylight since 1971, even as Peter was watching the engine come out of the pod a Swallow had a fly by. 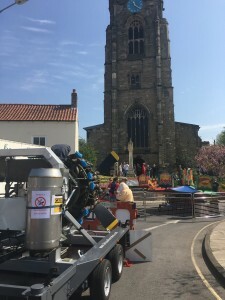 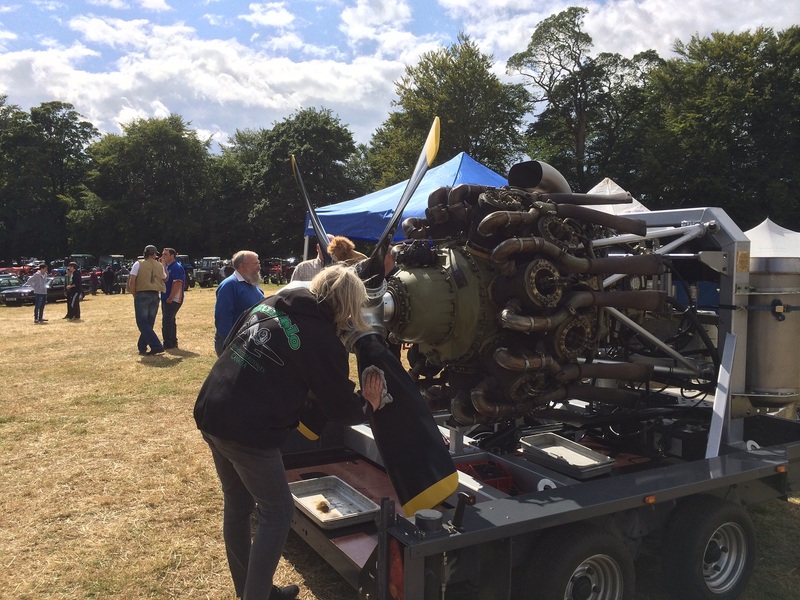 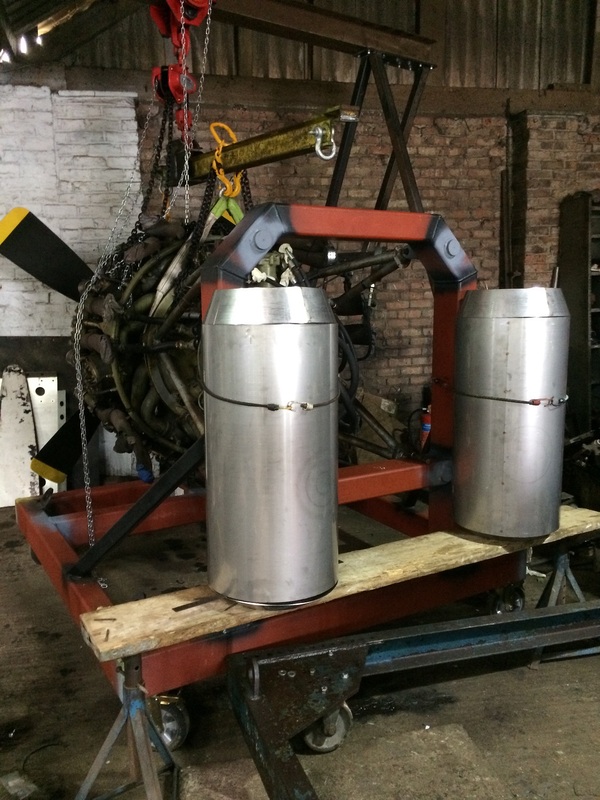 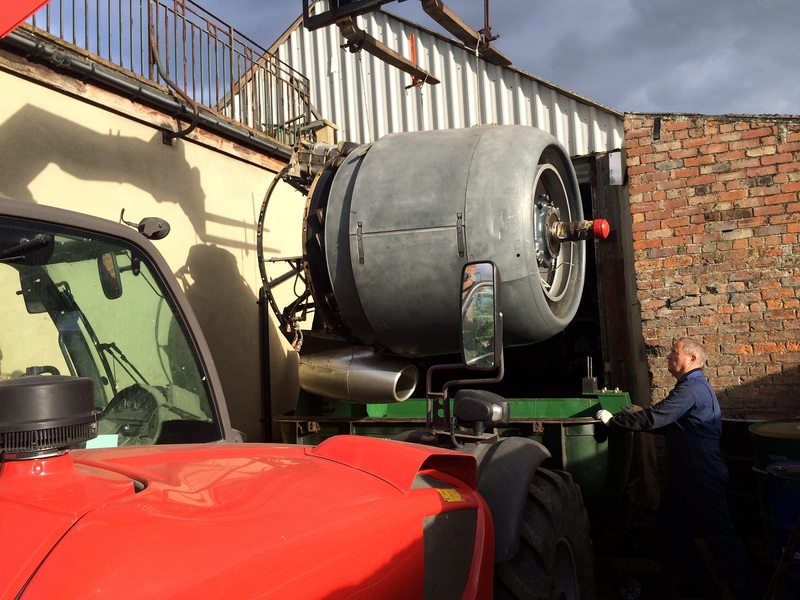 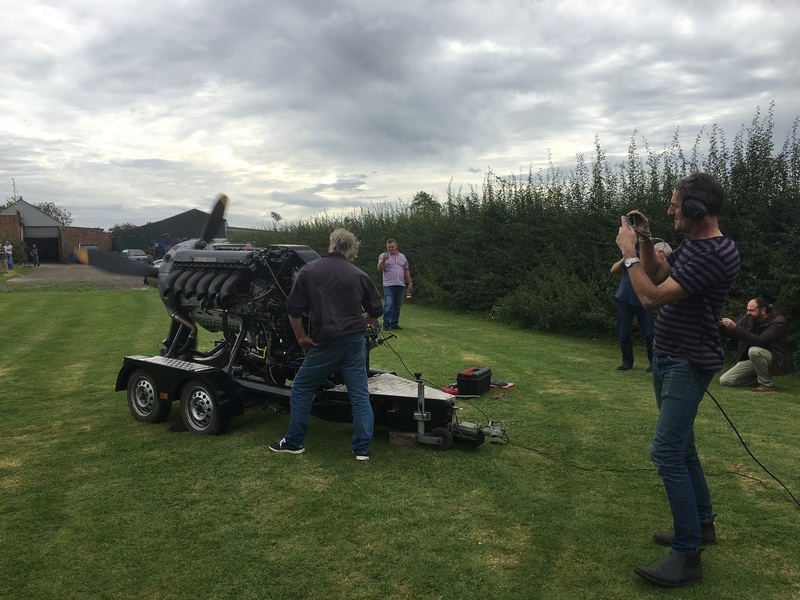 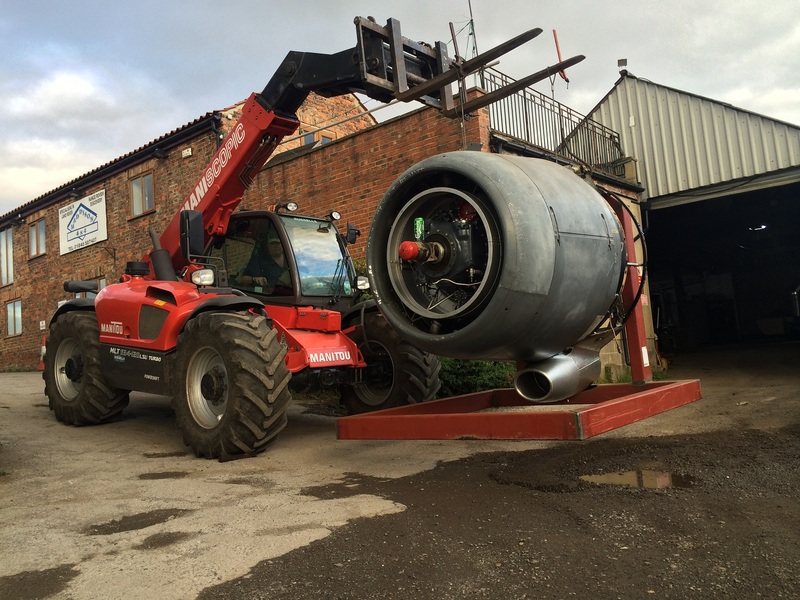 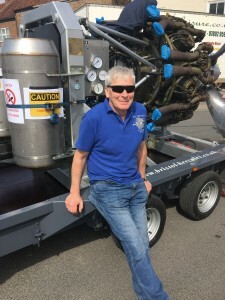 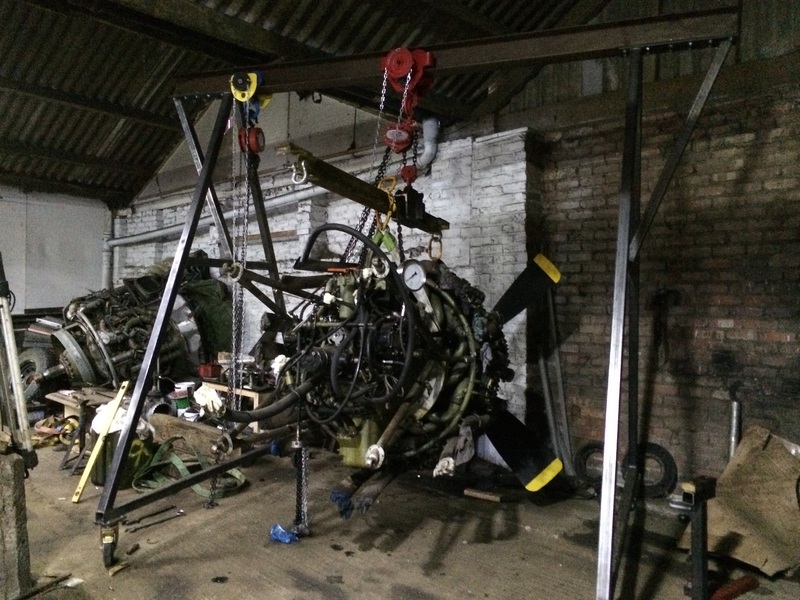 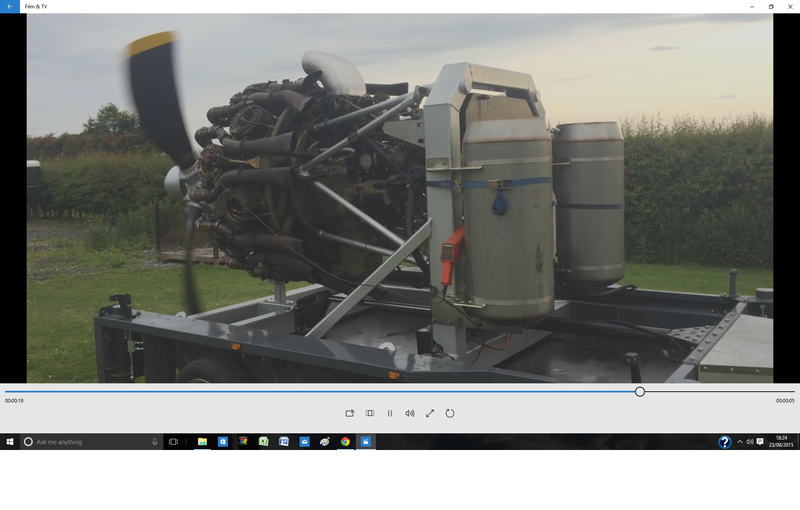 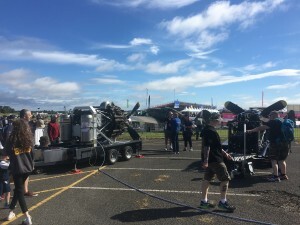 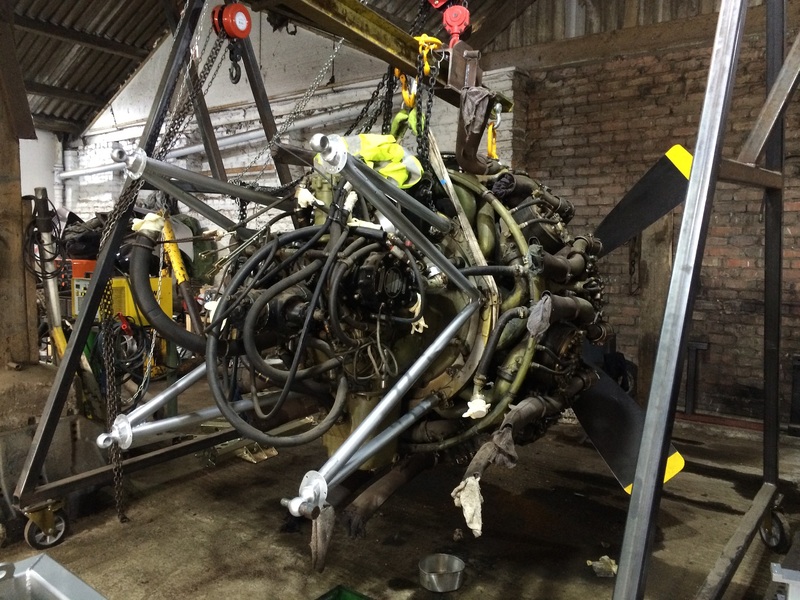 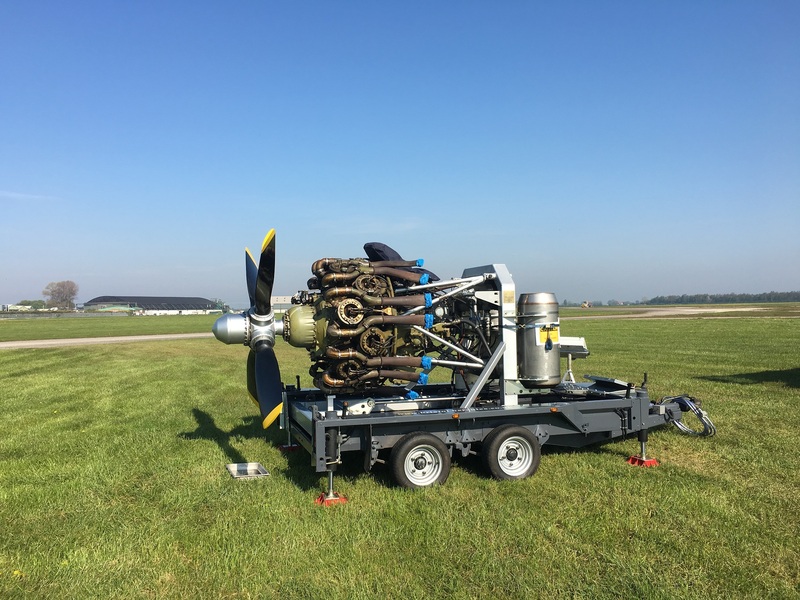 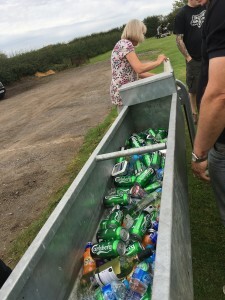 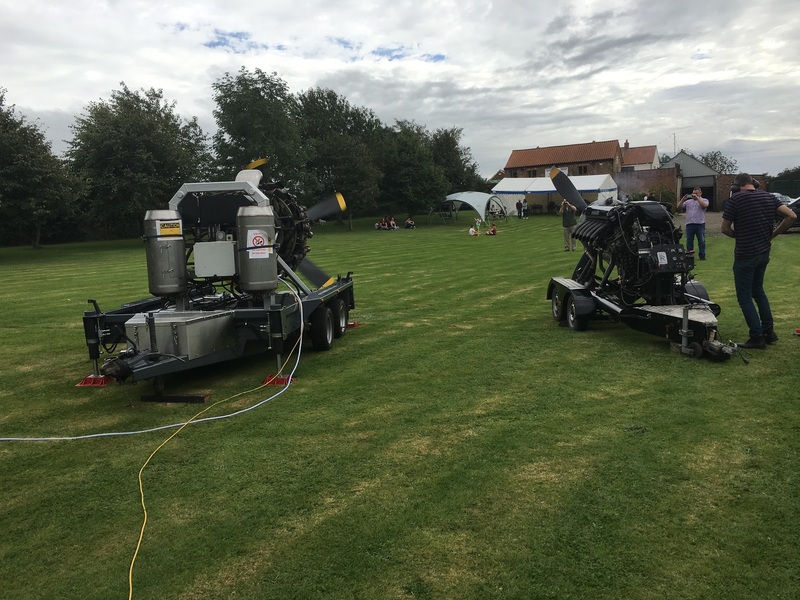 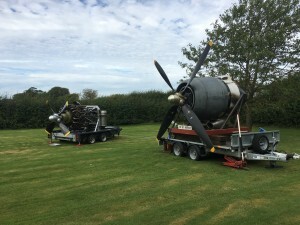 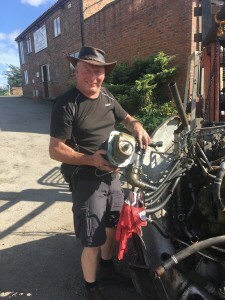 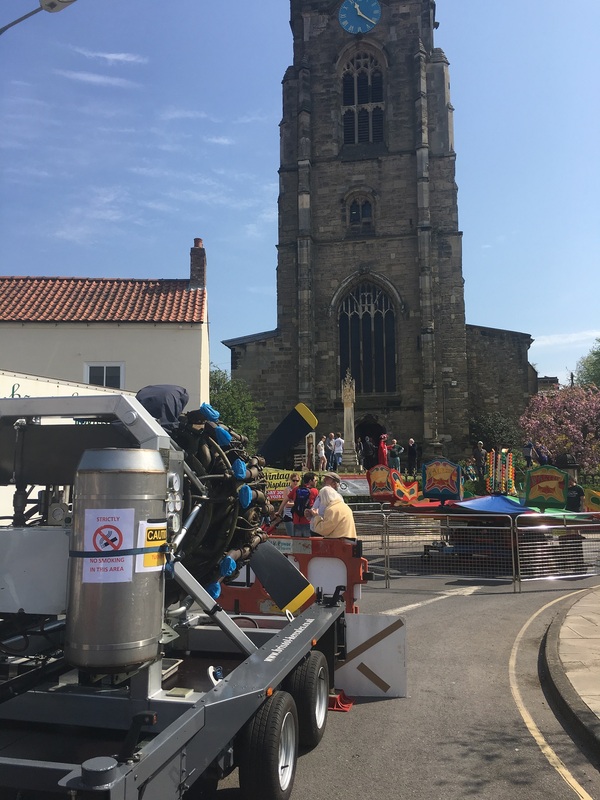 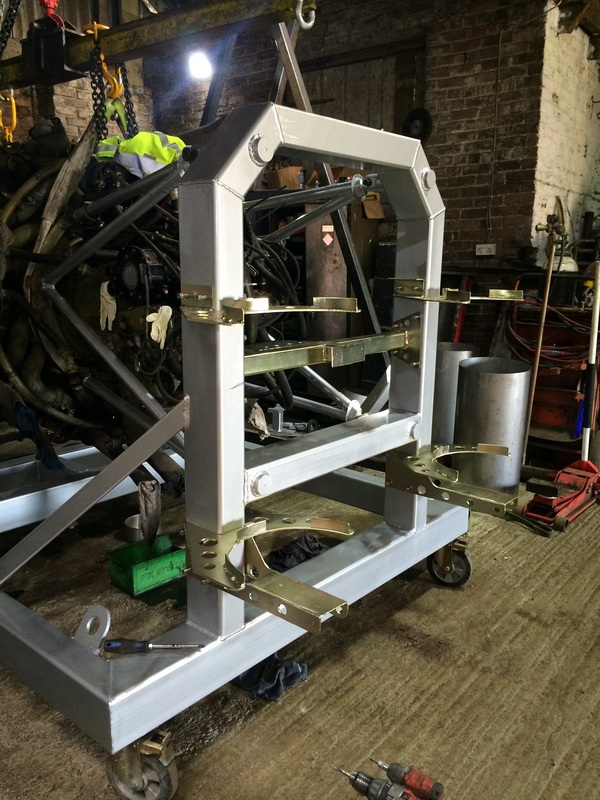 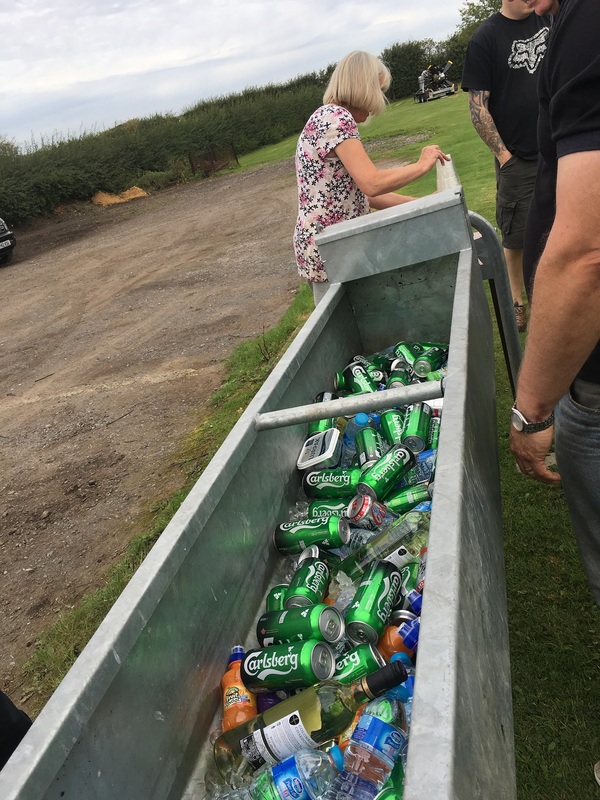 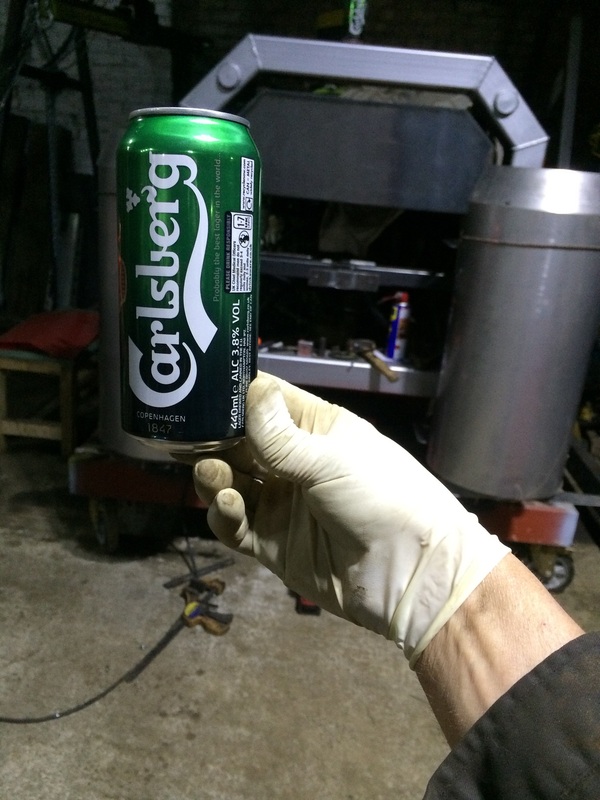 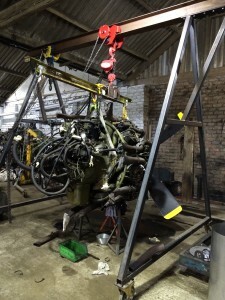 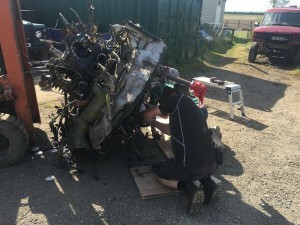 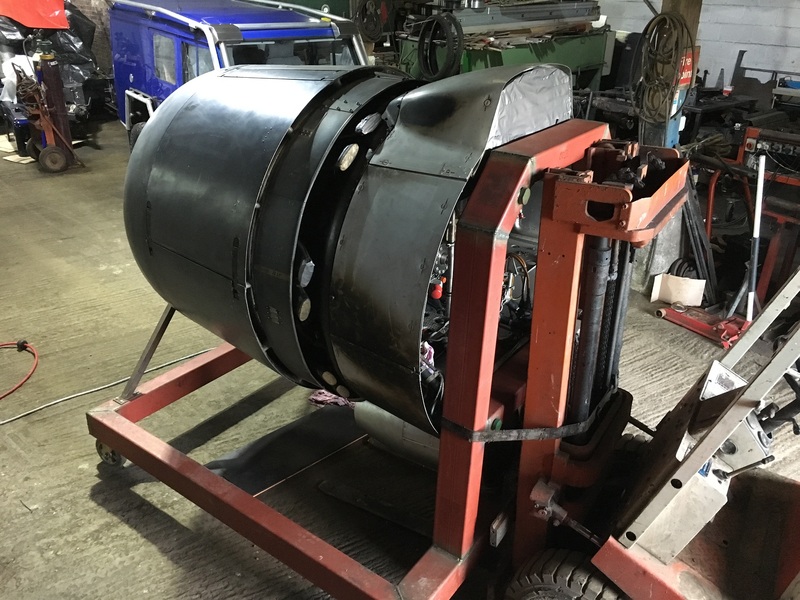 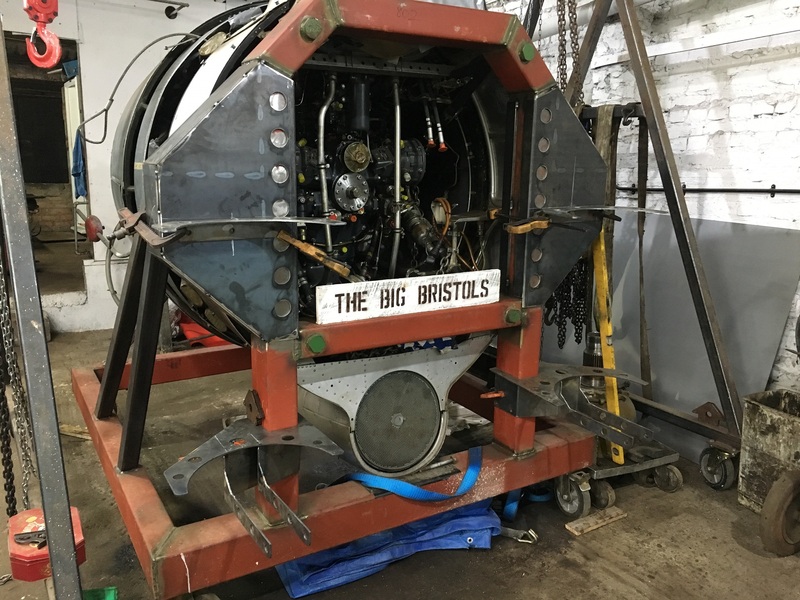 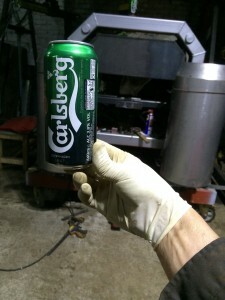 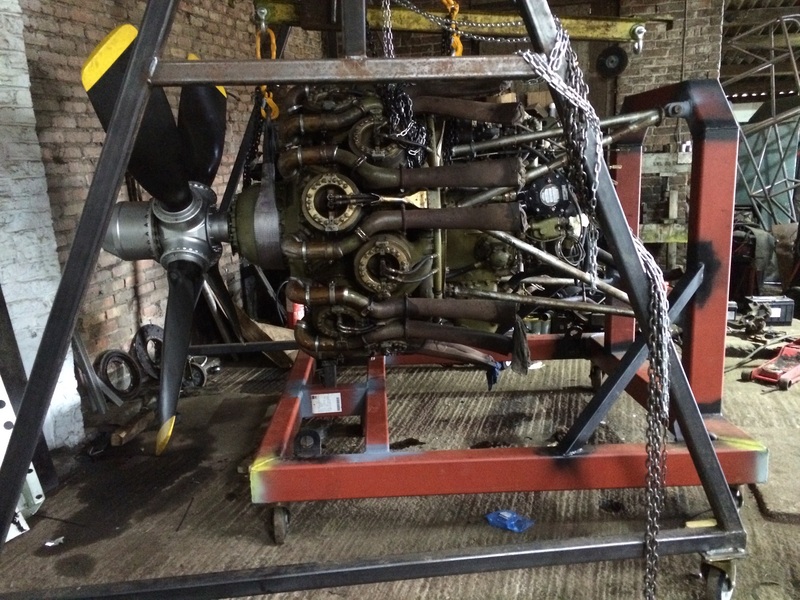 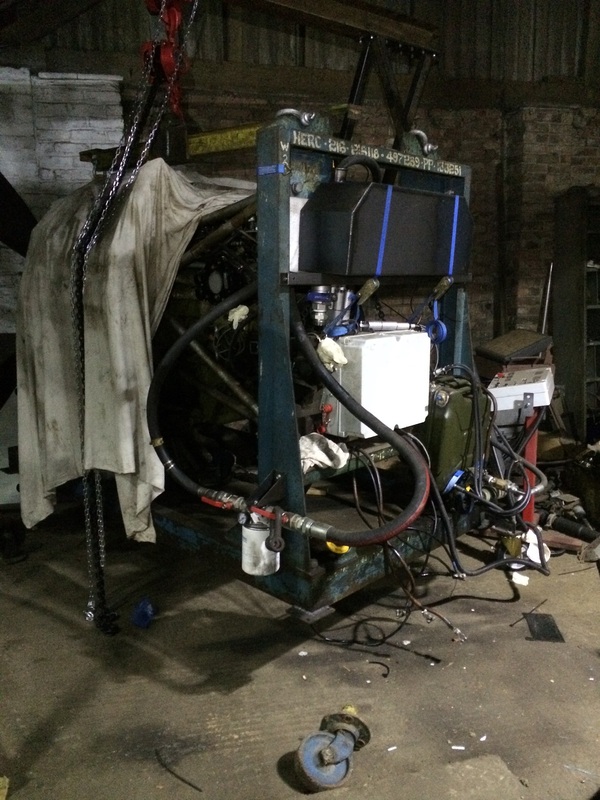 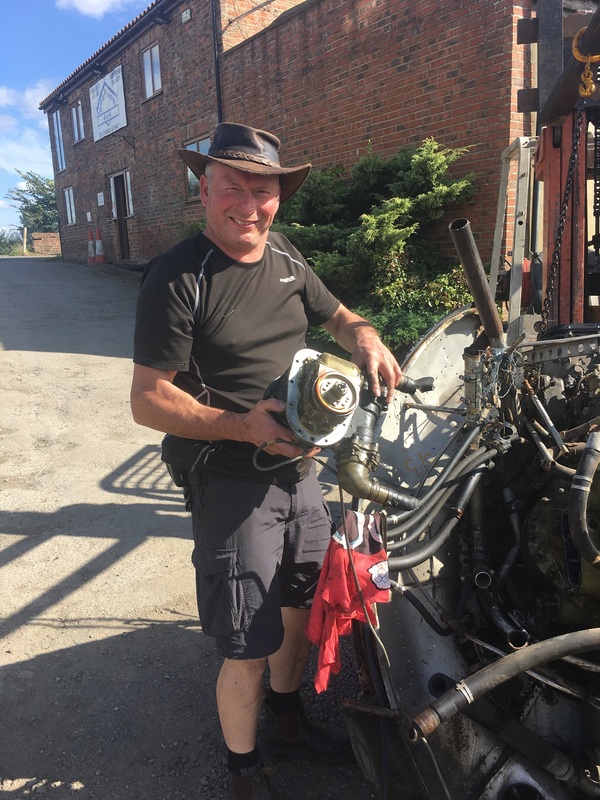 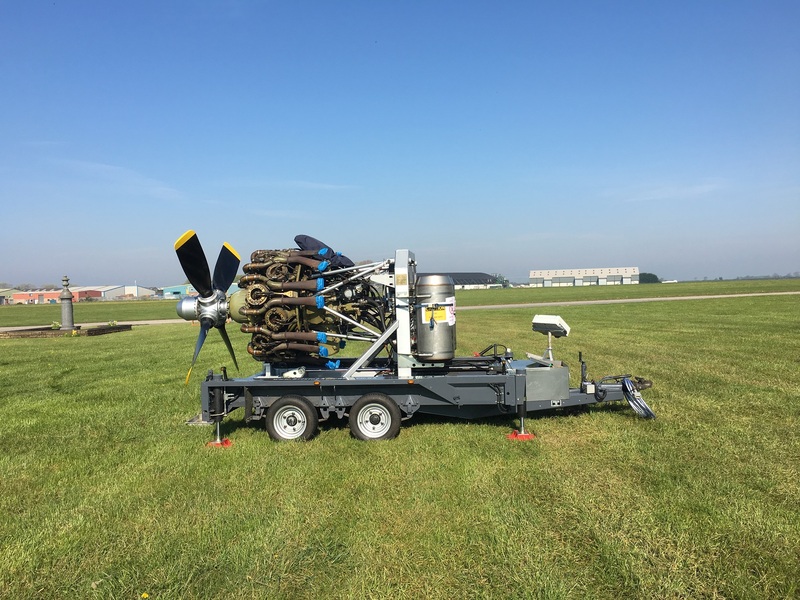 When we got the engine fitted to the frame , it was time to re-hydrate the engine before we lifted it onto a trailer ready to take to the show. 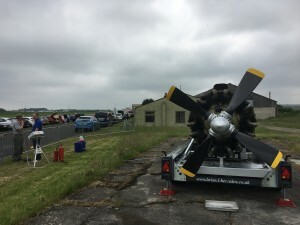 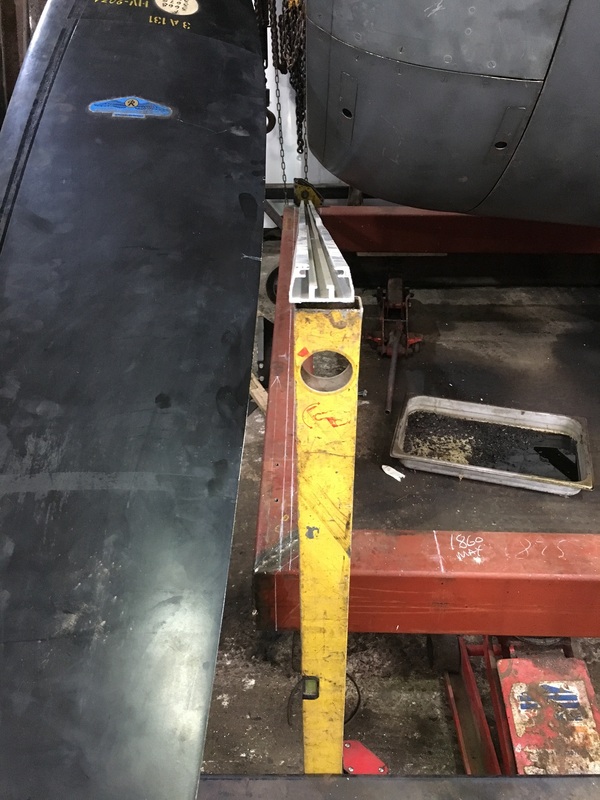 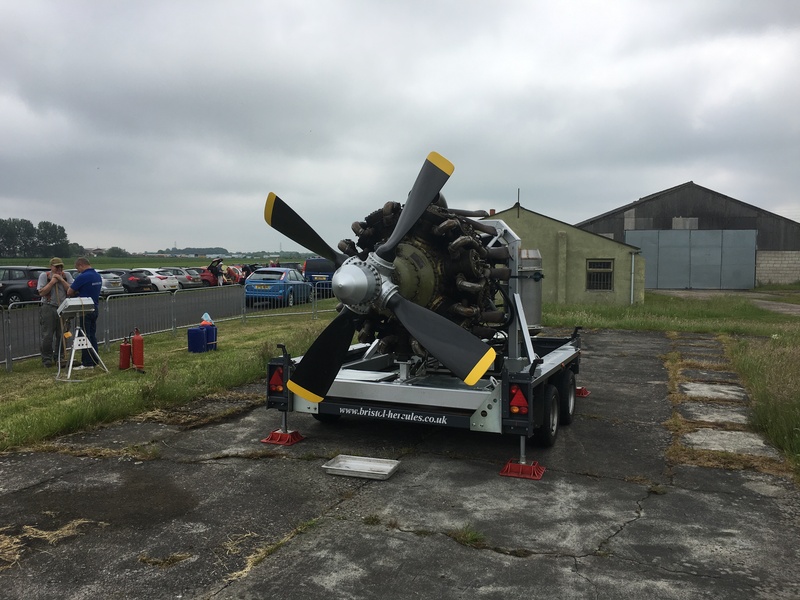 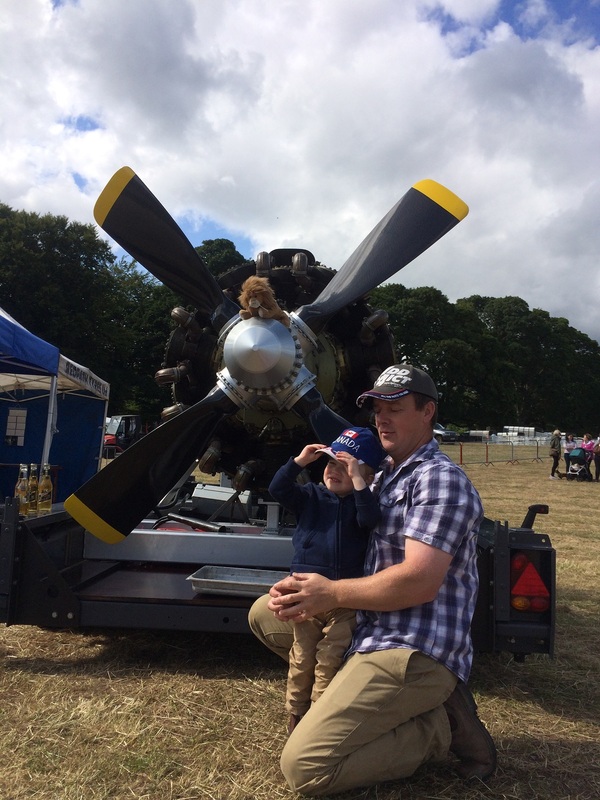 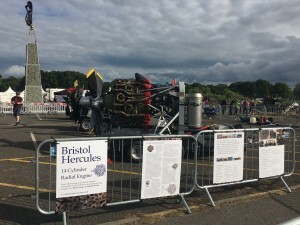 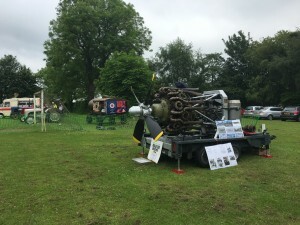 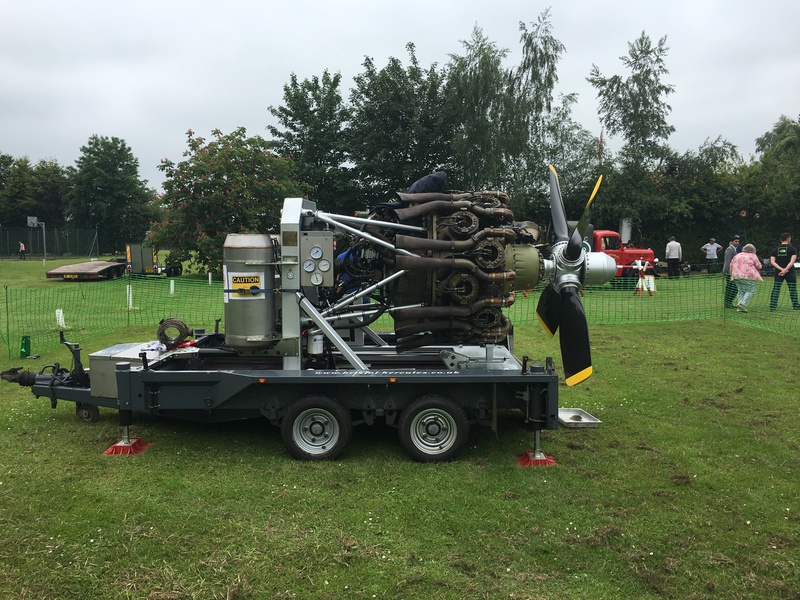 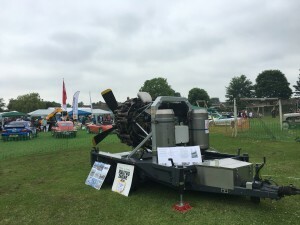 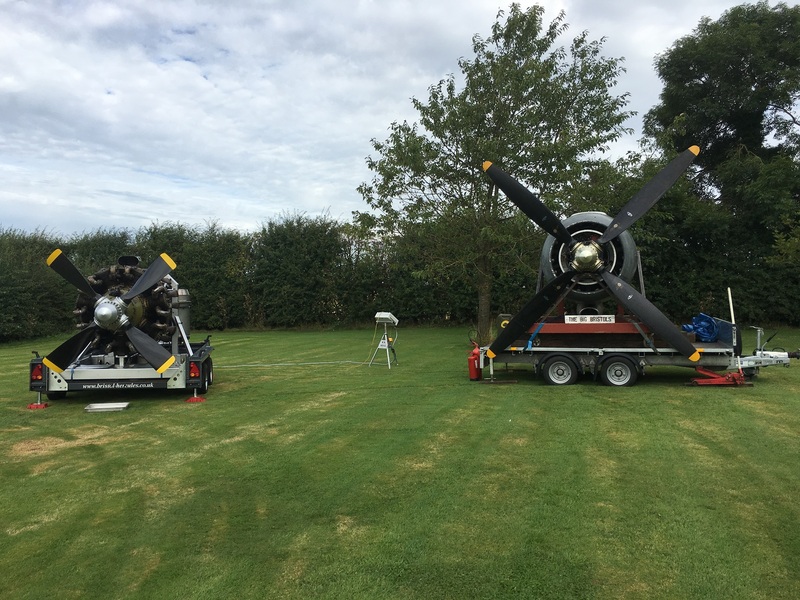 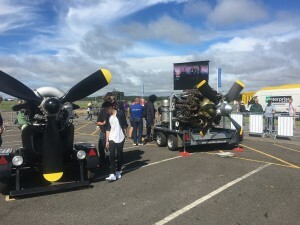 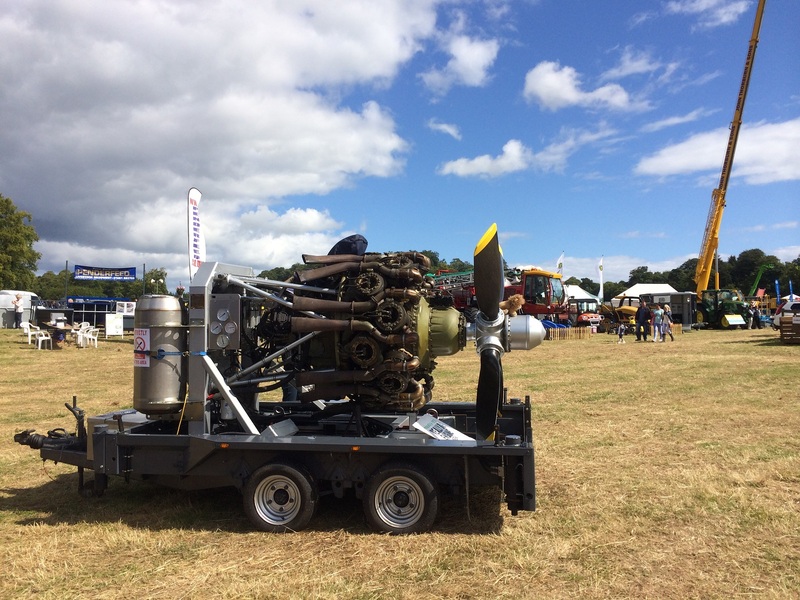 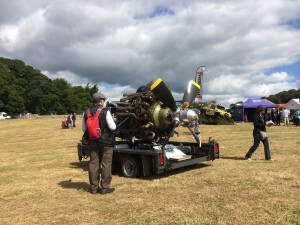 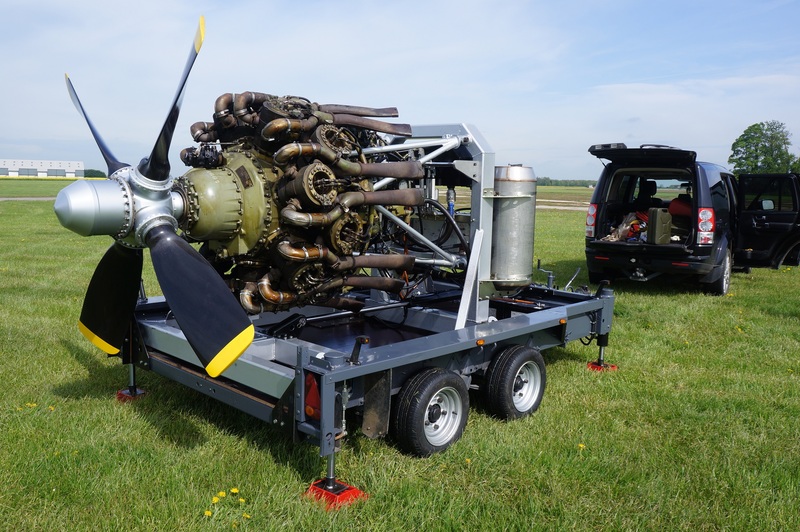 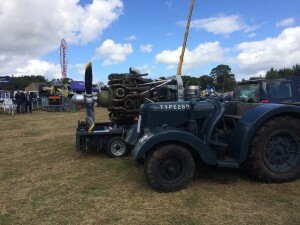 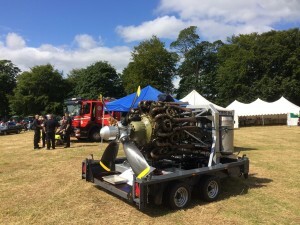 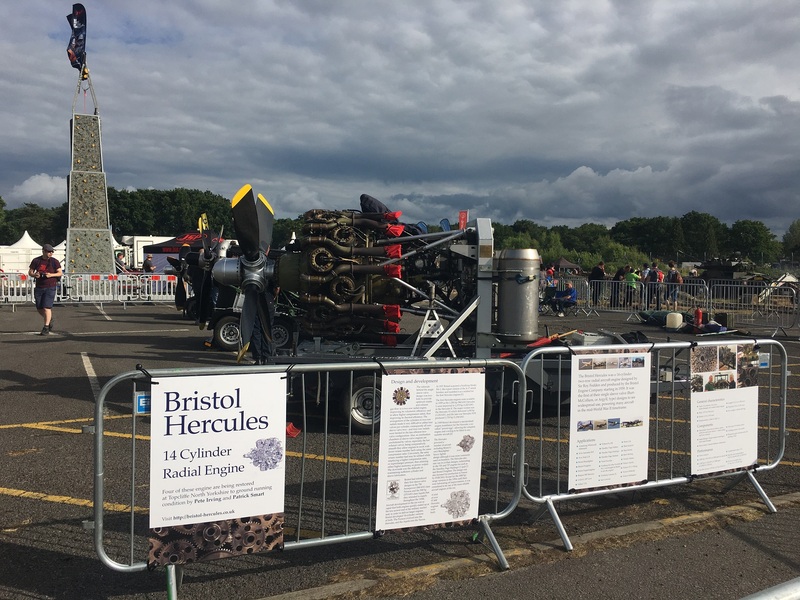 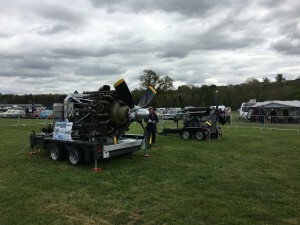 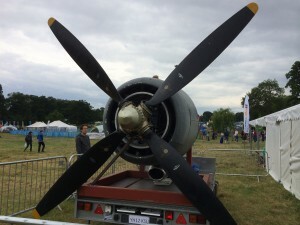 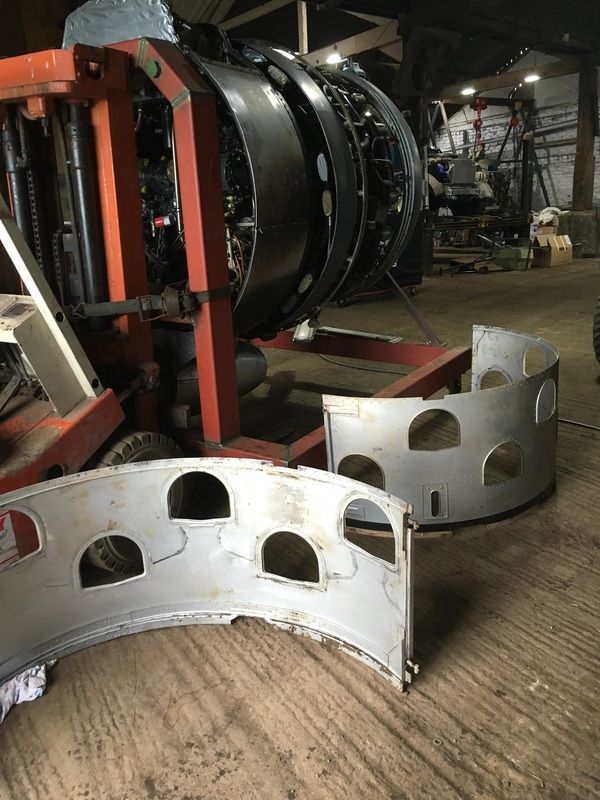 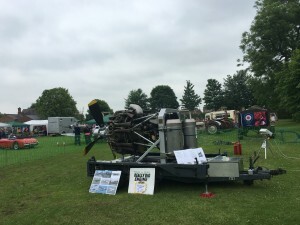 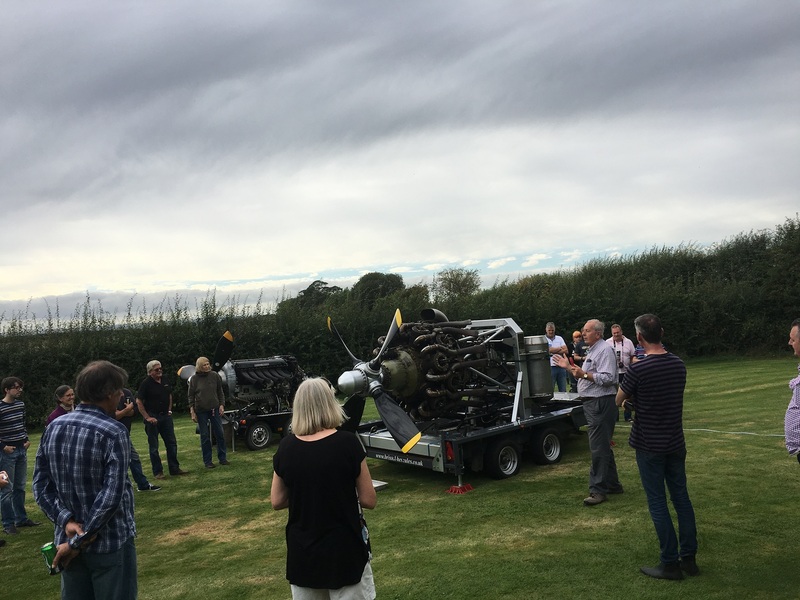 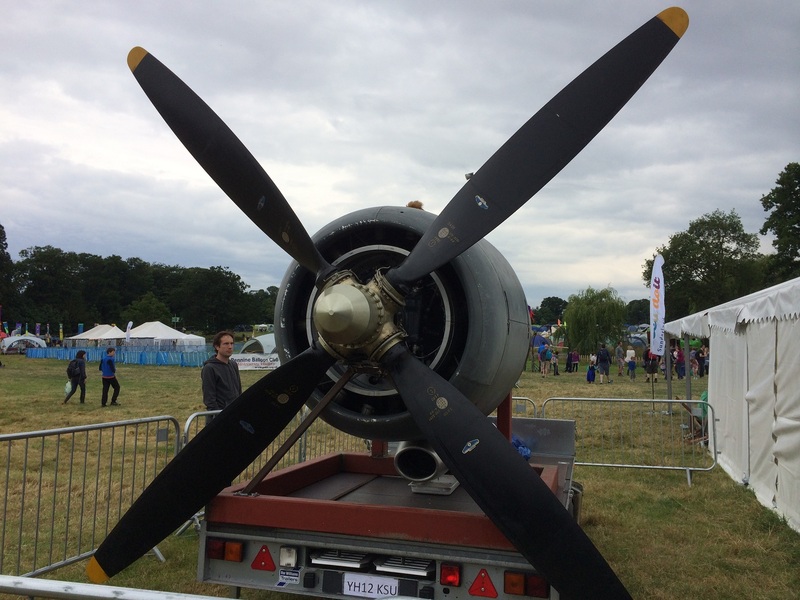 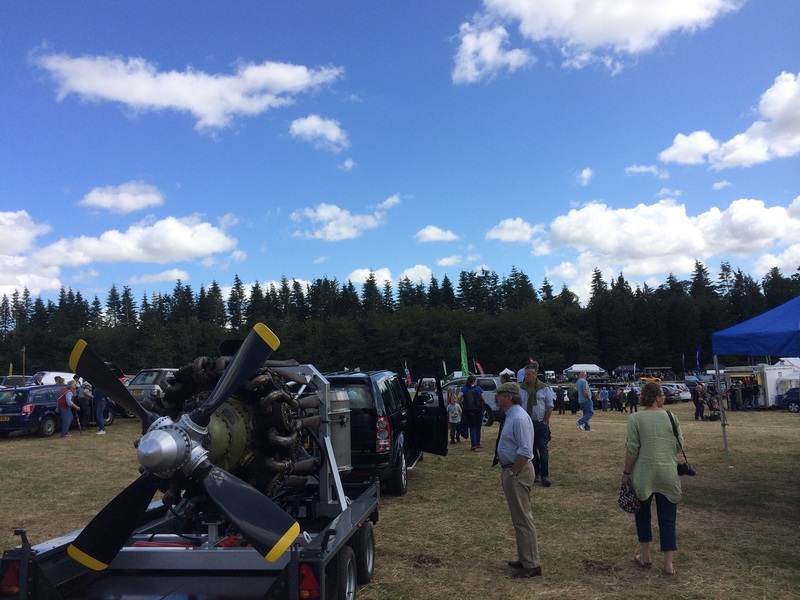 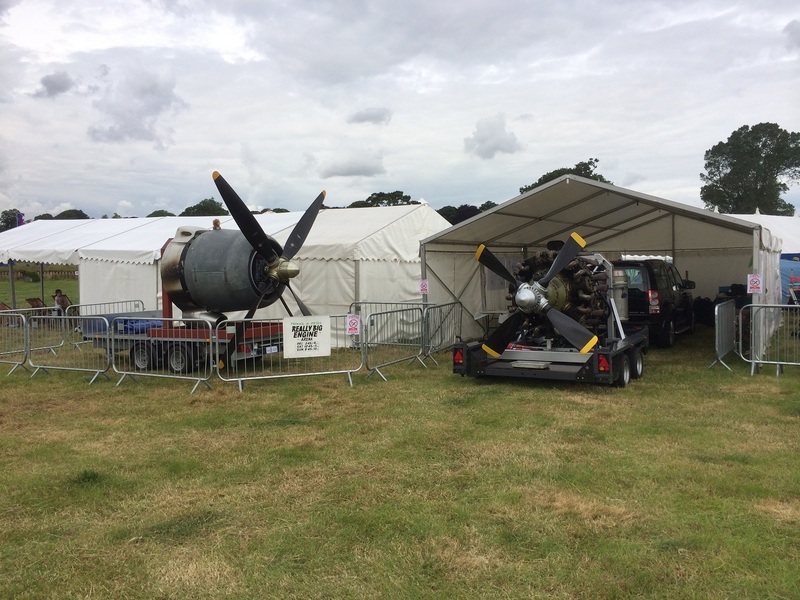 At the show we fitted a full size Rotol Prop, this has put an idea into our heads, should we design a frame to fit a 14 tonne truck so we can run a full size prop at some time! 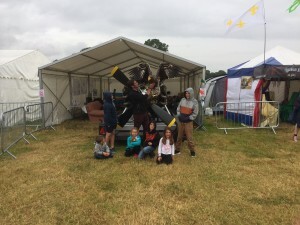 At the end of the show a friend of ours Ben Potter brought his 9 foot wingspan Steller’s Sea Eagle called Camillia over to have it’s picture taken next to the Hercules with all of our Grand Kids and friends . Ones born to fly ones built to fly! 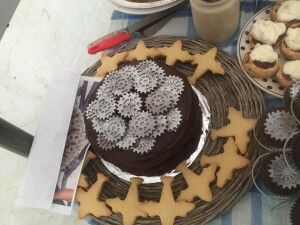 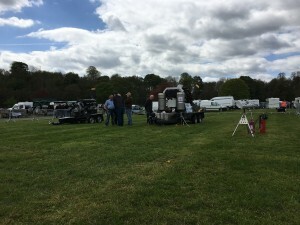 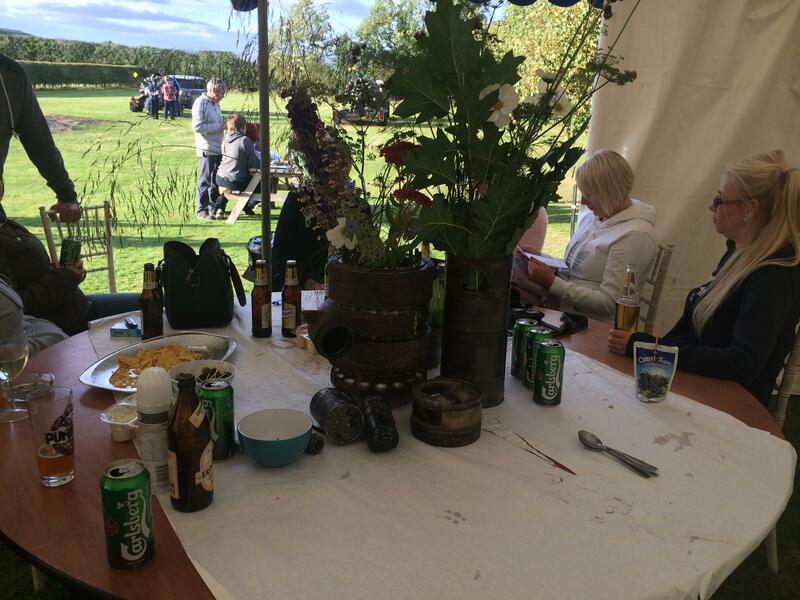 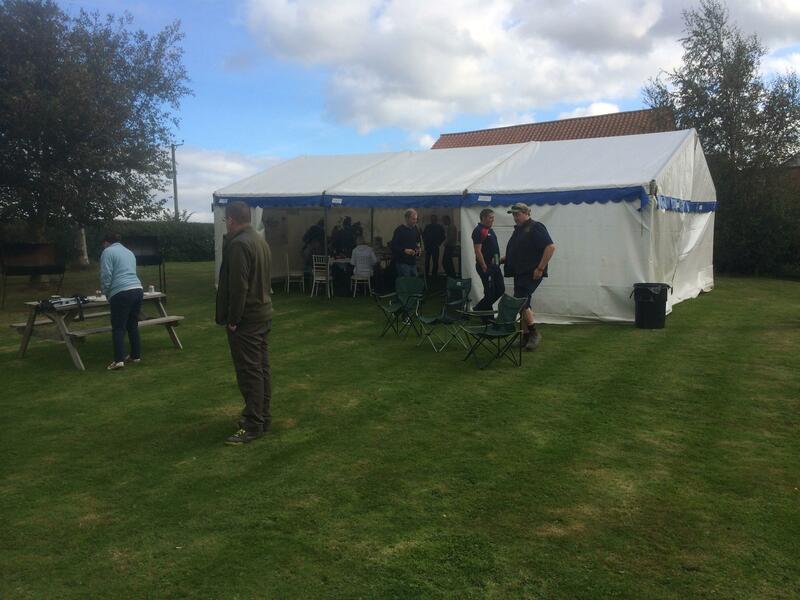 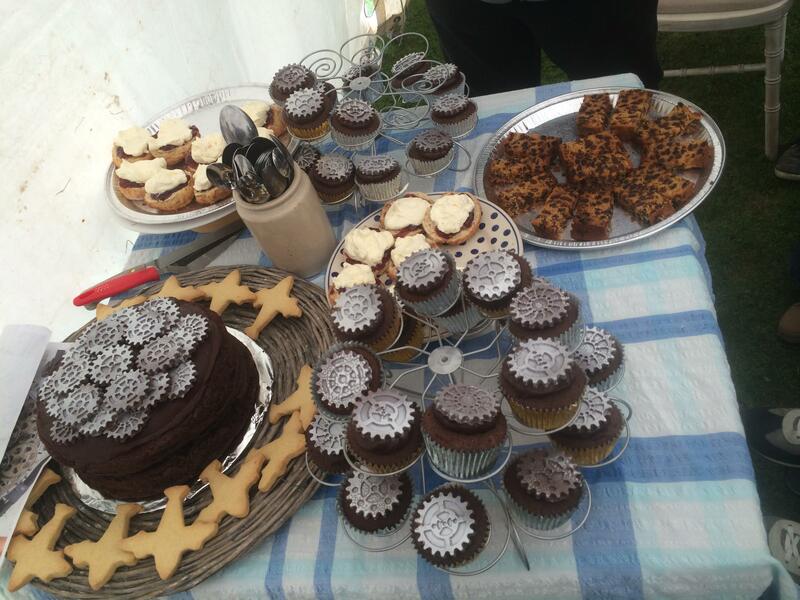 Our next trip out took us to the Scottish Borders Agriculture Show at Duns on the 1st of August. 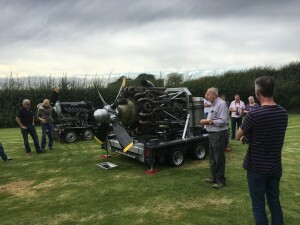 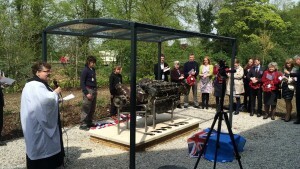 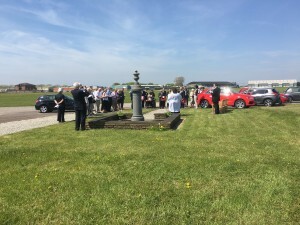 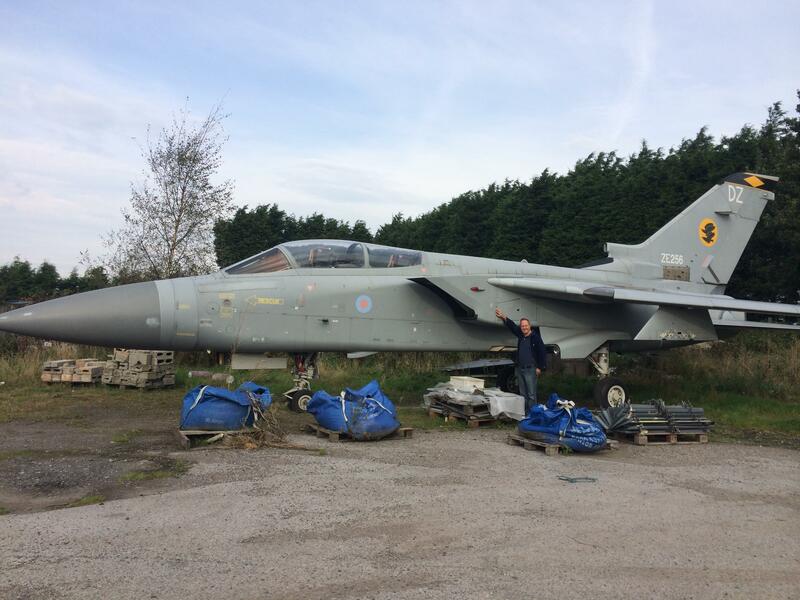 A lot of local people had a lot of knowledge of the engine as there was two local Airfields that used to be home to Beau-fighters. 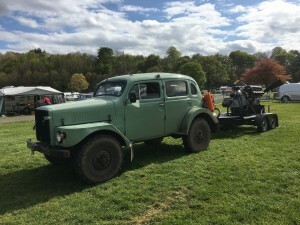 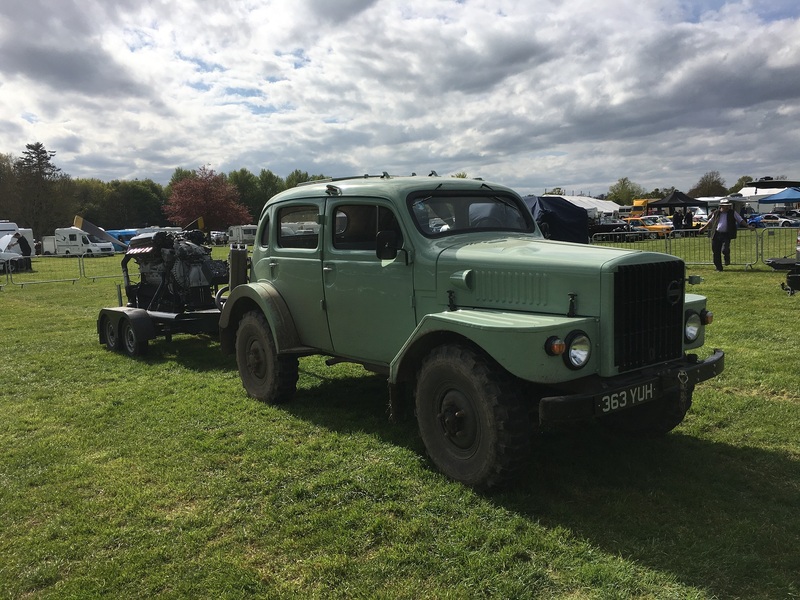 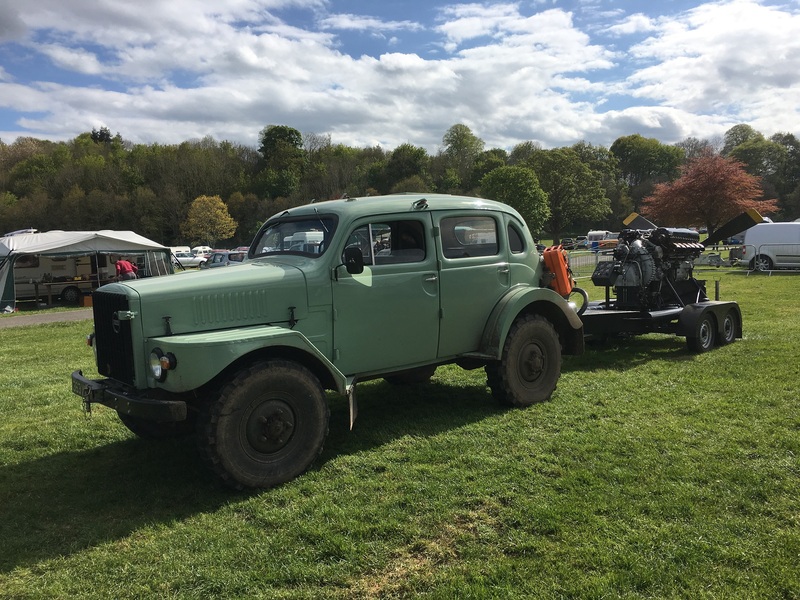 At the Show there was a 1944 David Brown Airfield tractor tug, so thought that we would introduce them! A young future pilot i think! 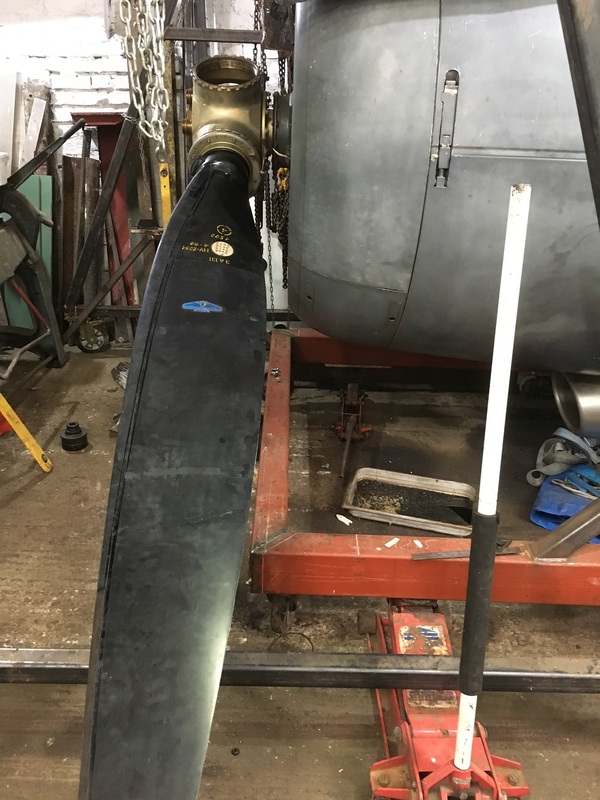 After the engine run,Gill my wife did a bit of house keeping and cleaned the prop blades. 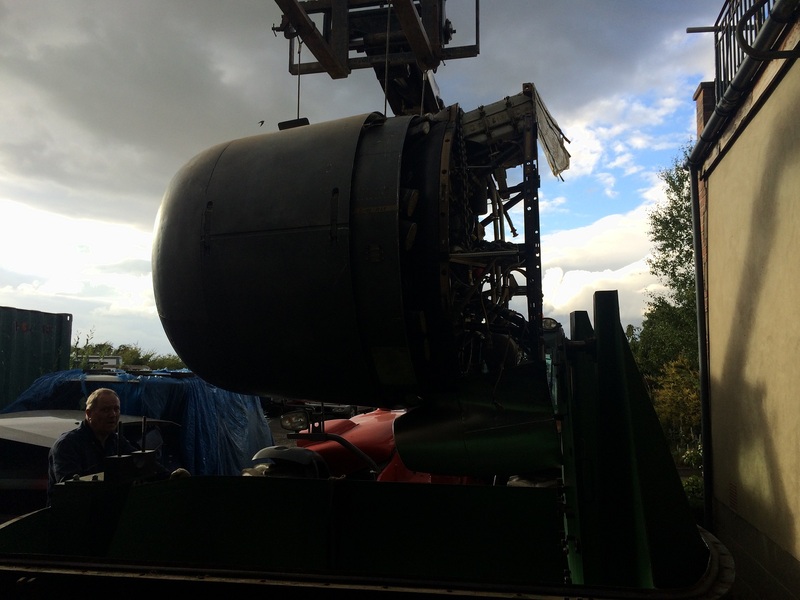 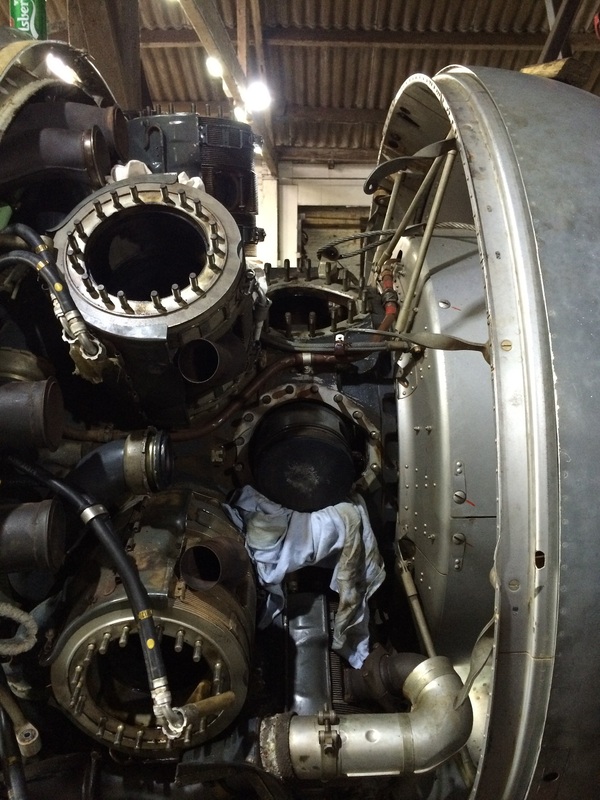 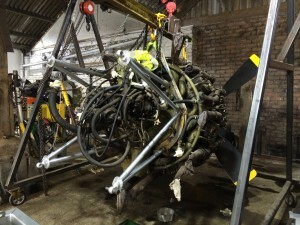 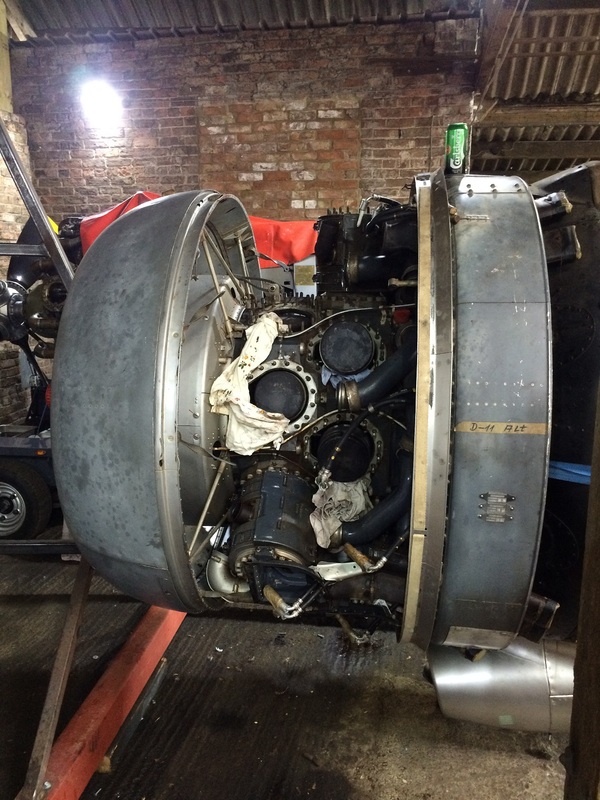 Our next job is to sort out the 759, when we had the full size prop on it , we tried to turn it, it was stuck!. 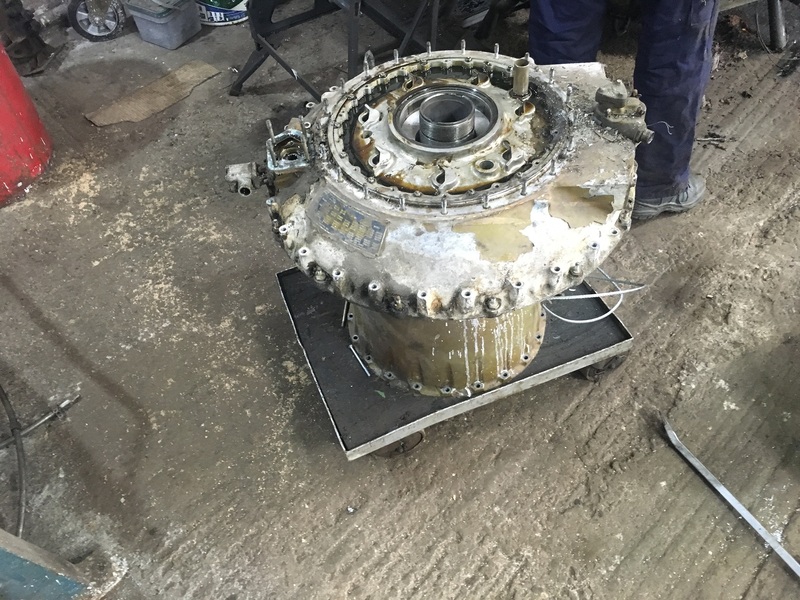 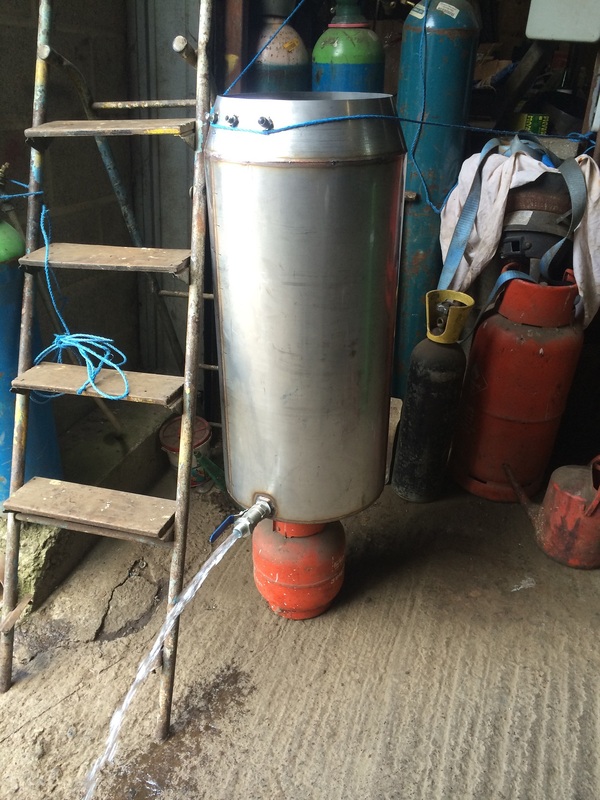 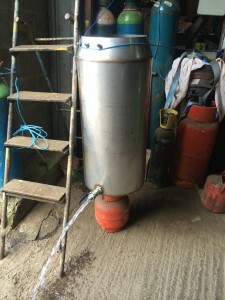 It looks like this one had missed the inhibiting oil!, we have took the head off and the sleeve is too rusty, so we will have to renew that one.